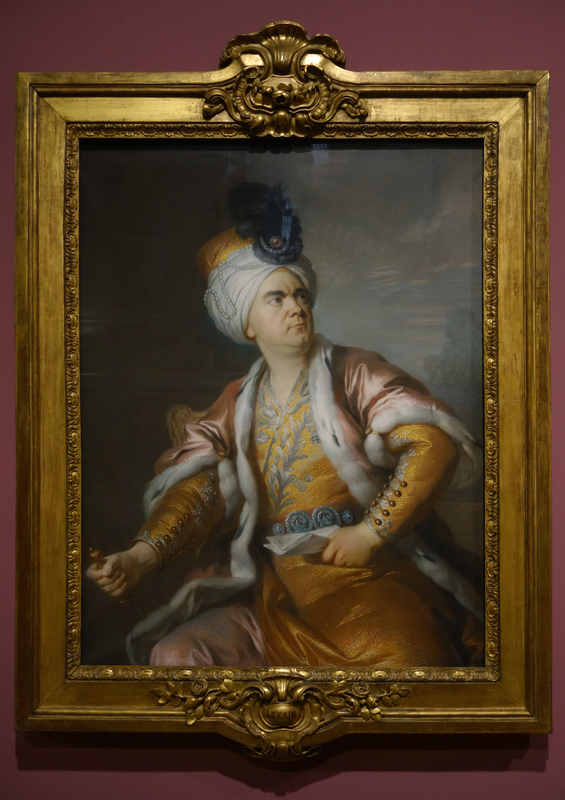 Neil Jeffares, author of the Dictionary of Pastellists before 1800, considers frames in the recent exhibition, 17th and 18th century pastels in the Louvre (June-September 2018). He discusses, amongst other things, the survival of original settings; reframings and stylistic collisions; works stamped by the framemakers; the evidence of inventories and early photographs. The introductory essay is followed by comments on individual works by catalogue number. 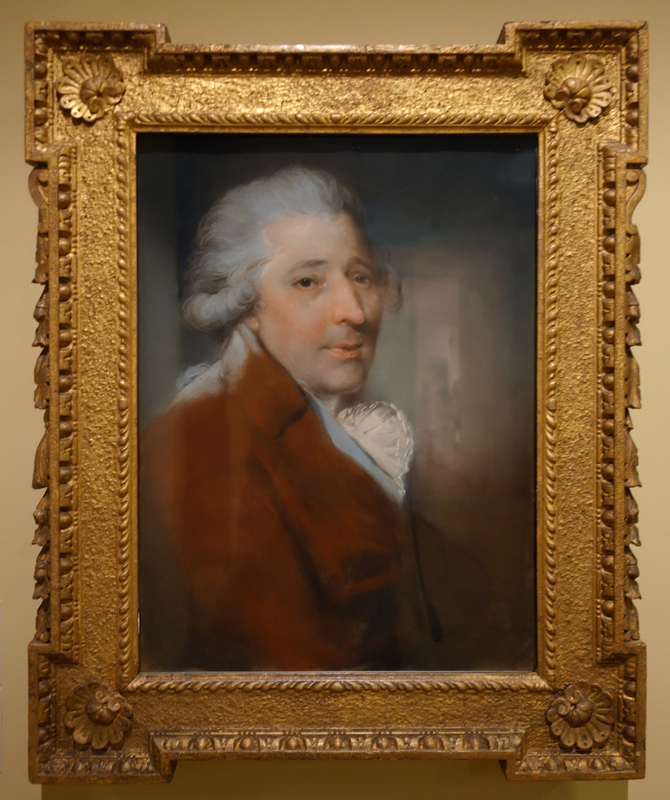 One of the delights of collecting eighteenth century pastels is the feeling that you have before you a work that in many cases is exactly as it left the artist’s studio: they haven’t had to be revarnished every generation, like oil paintings, and the hazards of removing them from their frames means that many are still in their original frames – their cadres d’origine. At least that is the received wisdom. But with experience the collector notices that big-name works – the La Tours, Rosalbas, Perronneaus and Russells – which were highly sought after a hundred years ago were in many cases reframed in something more elaborate, to suit the demands made on the dealers by extremely wealthy collectors who would not have been satisfied with the (often rather modest) original frames. 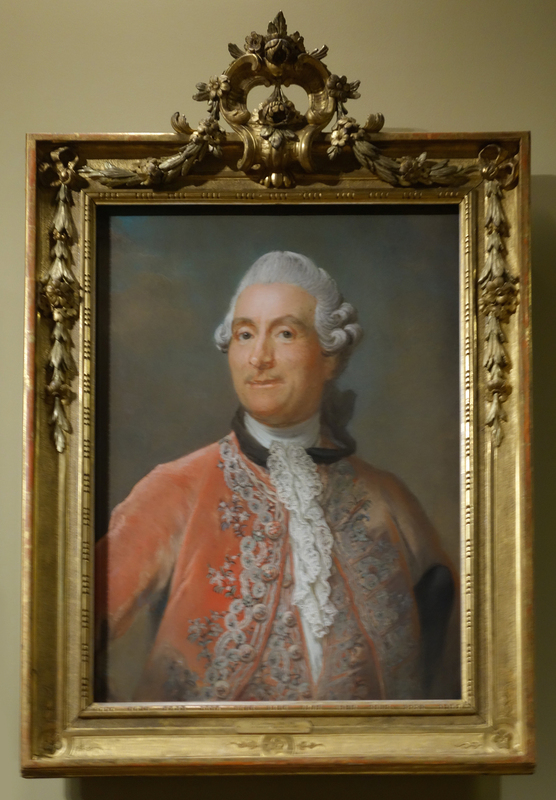 Conversely, later on, when pastels went out of fashion, many good period frames were hijacked for reuse on oils or drawings that were more saleable. 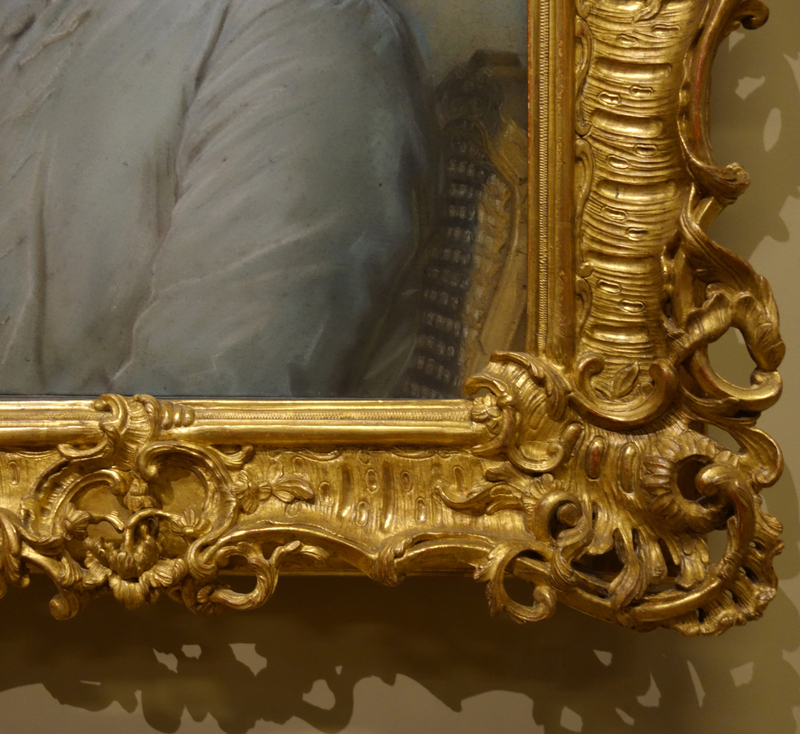 Still, you might think, we can find original frames in the great museums and their historic collections? Up to a point. 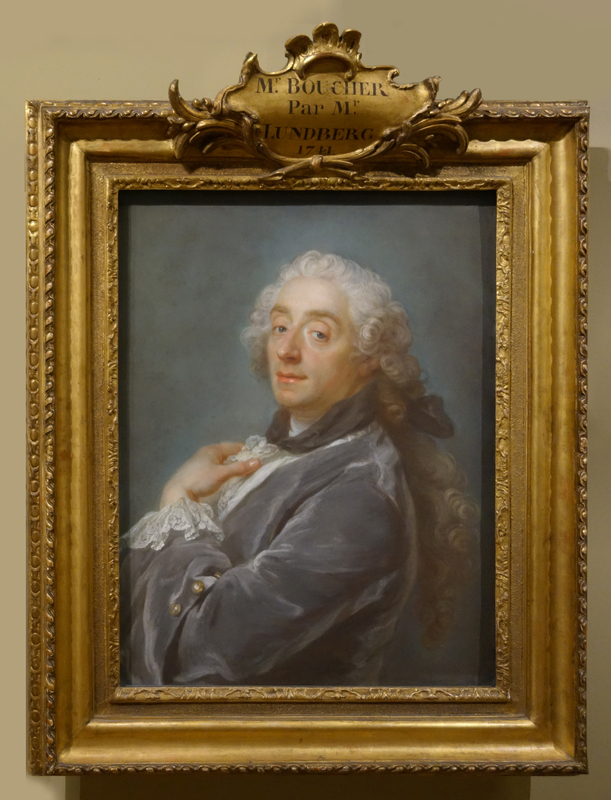 And there is no doubt that the recent pastel show at the Louvre (which coincidentally overlapped with the Louvre’s own, first ever, exhibition of picture frames – still open until 5 November) displayed some magnificent examples which merit our attention. 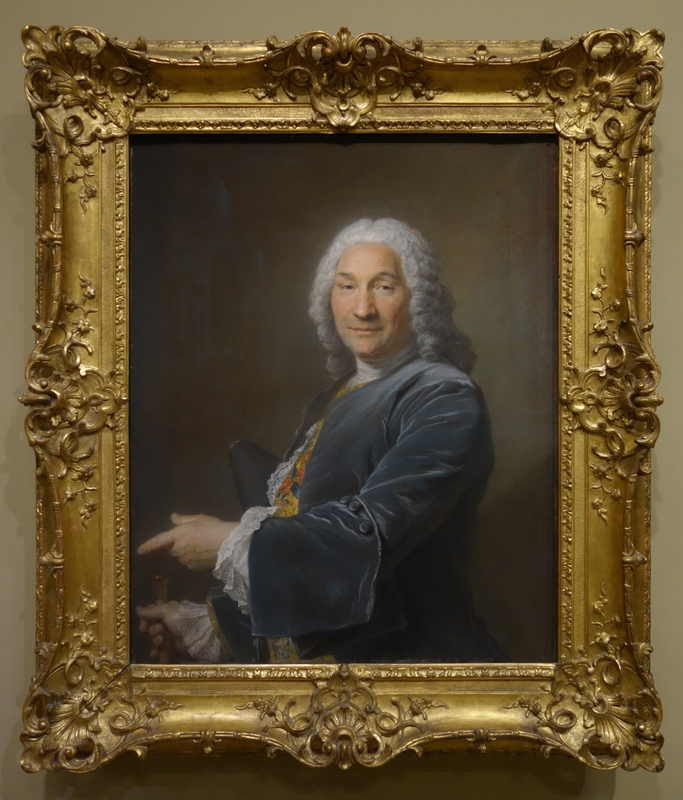 Inevitably, however, an exhibition of frames will concentrate on the most glorious : frames for pastels are often quieter, as befits their contents (a good frame, it has been said, should be as inconspicuous as an English gentleman’s suit). While the pastels are no longer on view, Xavier Salmon’s catalogue (which I have reviewed elsewhere; there is also a detailed commentary with supplementary information on my blog) offers a useful framework for our discussion, even though the information on frames is very limited (only a dozen Louvre frames are reproduced, out of 195 entries – as we shall see, there may be good reasons for so restricted a choice) and the descriptions, when given at all, are not always easy to find. Still less obvious is information on glass, or the strainers on which the works are mounted. 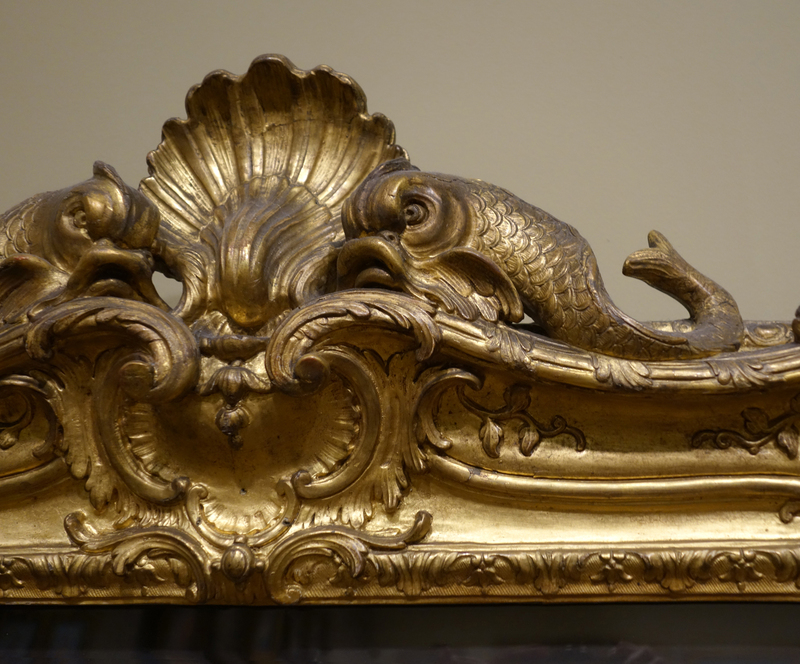 Elaborate picture frames were of course widely used in the Baroque and Rococo eras . In France in particular they achieved an extraordinary level of sophistication and beauty. For the most part framemakers remain anonymous. In eighteenth century Paris, marks by some two dozen makers – maîtres menuisiers or ébénistes – have been recorded . They are however seldom identifiable: most frames are unstamped, and documents rarely survive identifying the framers. Few posthumous inventaires or financial accounts are known from which to identify clients or payments . 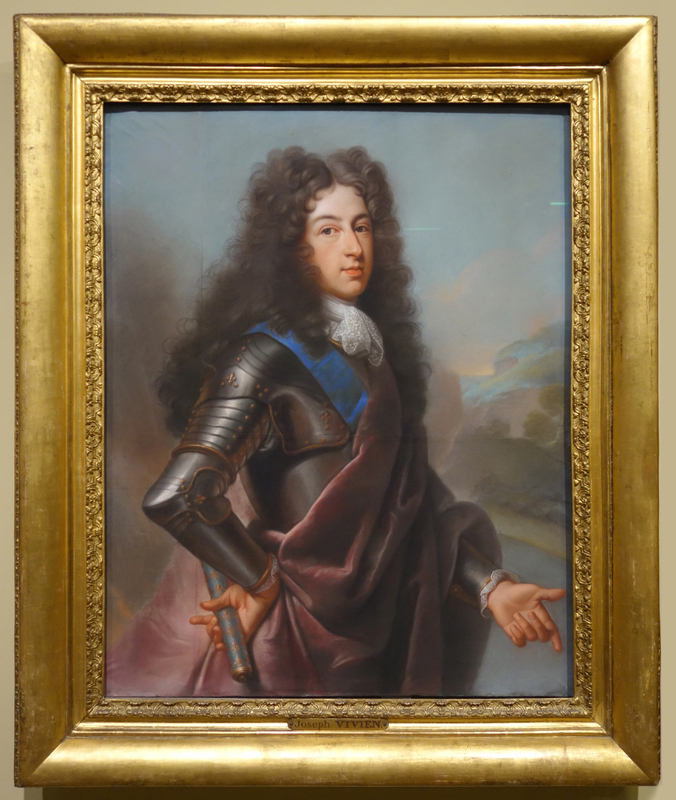 The rare exceptions include some commissions handled by the Bâtiments du roi, including frames for portraits of the royal family which we might expect to find in the Louvre . The portrait is famously now part of the Louvre collection, and of course dominated the recent exhibition (just as it has done from the old days of the Grande salle de pastels on the first floor, Northern block of the Cour carrée): but how many people today are aware that the work has been denuded both of its original frame (the replacement is of uncertain date, but visually has the neo-classical austerity of Louis XVI rather than the opulence of his grandfather’s reign) and of its original glass (following the development of synaeresis, a phenomenon in which glass changes its physical phase state, the original glass had to be changed at some stage after 1942)? We have no idea what either looked like. But what we can see, putting its replacement side by side with the Getty pastel, is what a huge difference the frame makes. These pastels were made just 14 years apart: visually they are separated by aeons. 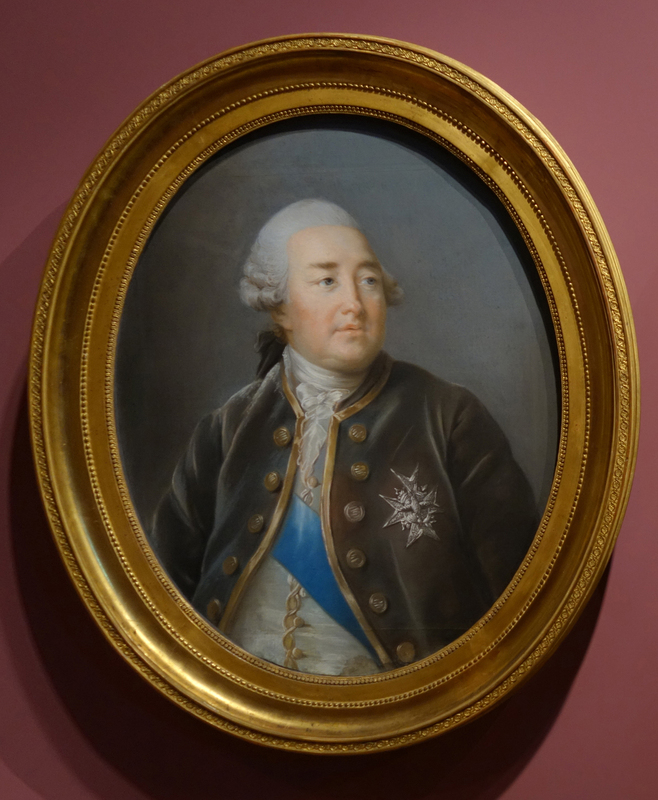 The trend away from plutocratic excess set in earlier than we may think – well before Louis XVI ascended the throne. 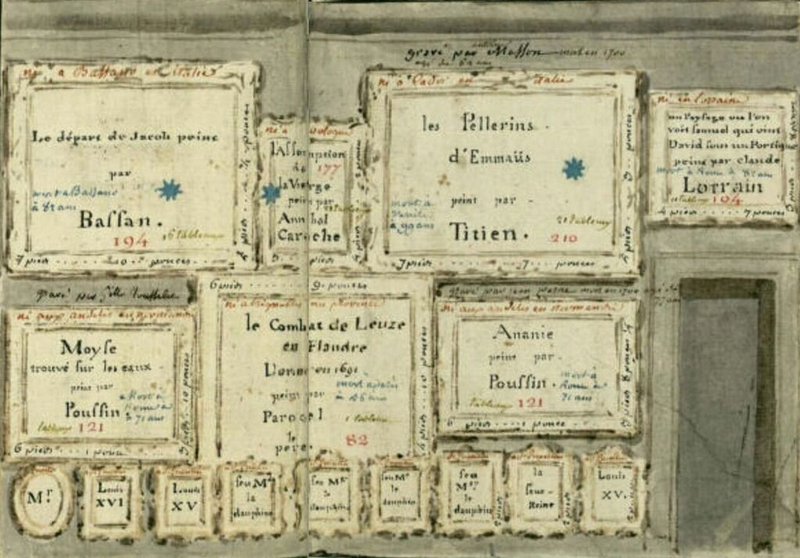 By 1753 the abbé Le Blanc felt the need to attack the prevailing fashion for ostentatious expenditure on elaborate gilt decorations surrounding third-rate pictures: a ‘contraste ridicule’ which resulted from a reluctance to pay more for the picture than for the ‘cartouche bizarre qui lui sert de bordure’ – ‘the bizarre cartouche which frames it’ . 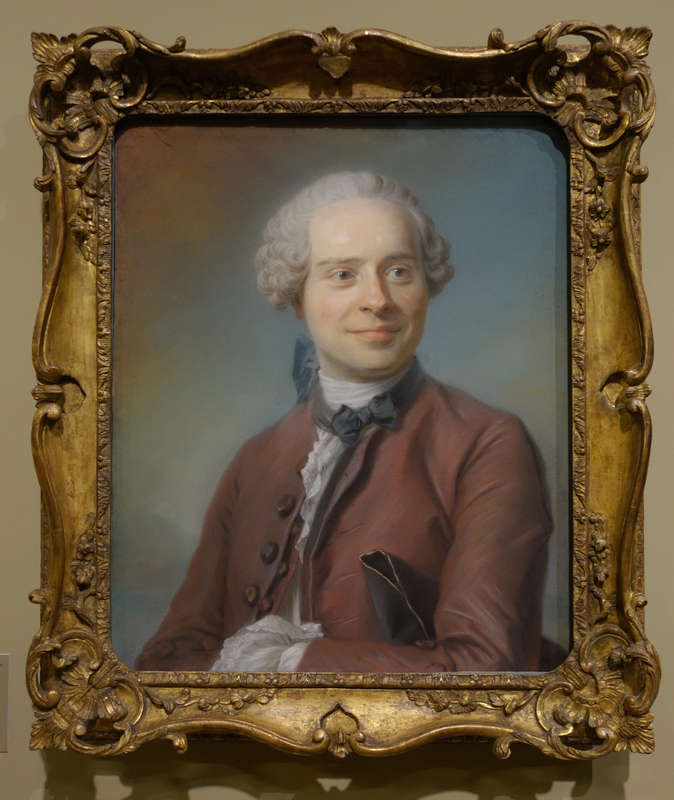 Molièreian ridicule was a great threat to the psyches of the arriviste financiers who were among the most avid commissioners of pastels, and NeoClassical sobriety is evident throughout the Louvre frames. 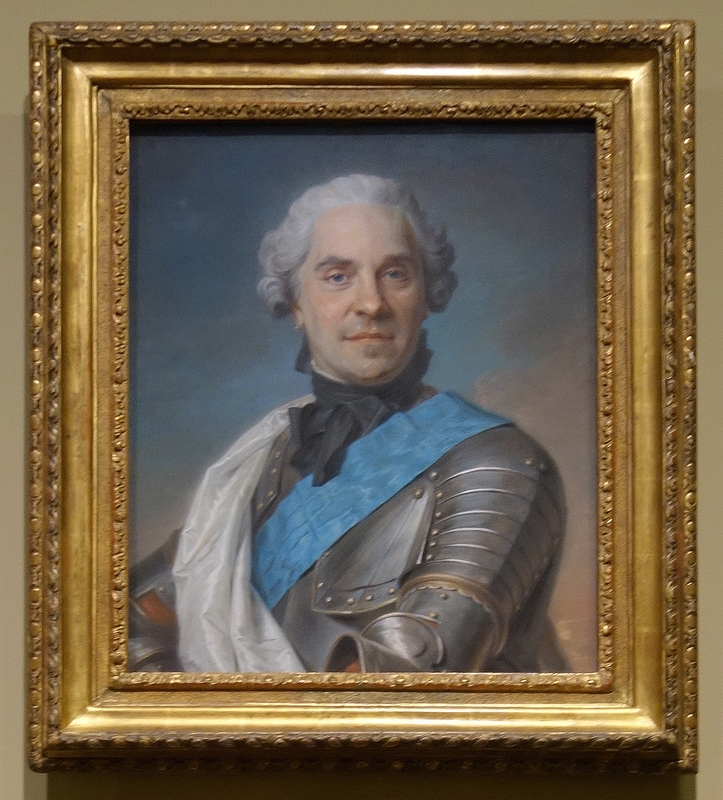 No one today would call the portrait of the président de Rieux a third-rate picture, although there might be some scope for wondering if the frame were not mildly over-the-top. But for the most part pastel frames, being domestic and of smaller scale, were less prone to excess than larger history paintings. 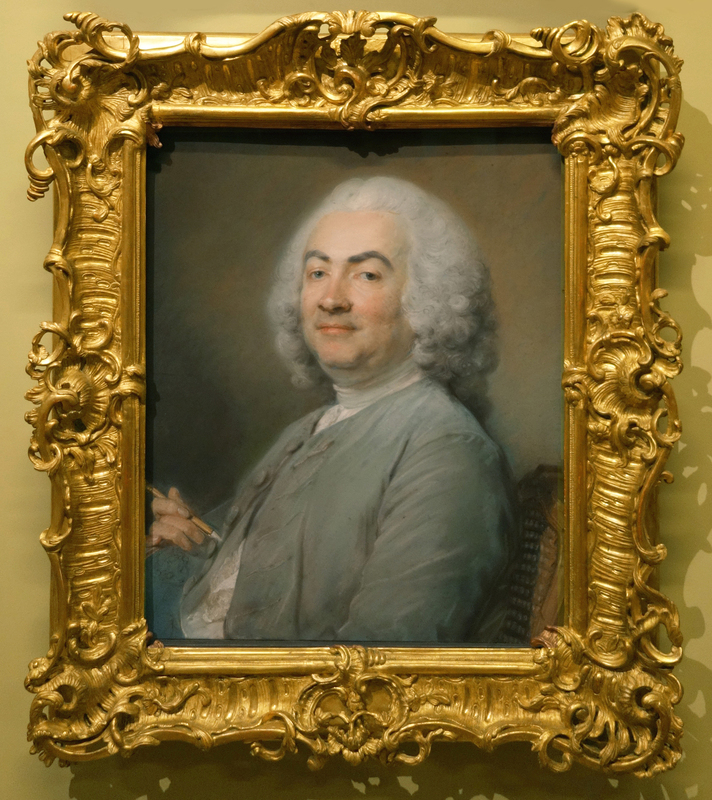 In France a fairly standard rectangular ‘pastel frame’ was widely used throughout the reign of Louis XV (although neither the phrase ‘bordure à pastel’ nor ‘cadre à pastel’ was employed at the time): it usually had an ogee moulding, with cabochon back-edge, gadrooned top-edge, sanded frieze and leaf sight. That on the Maréchal de Saxe (cat. no. 87 below) is a perfect example (but see that entry). 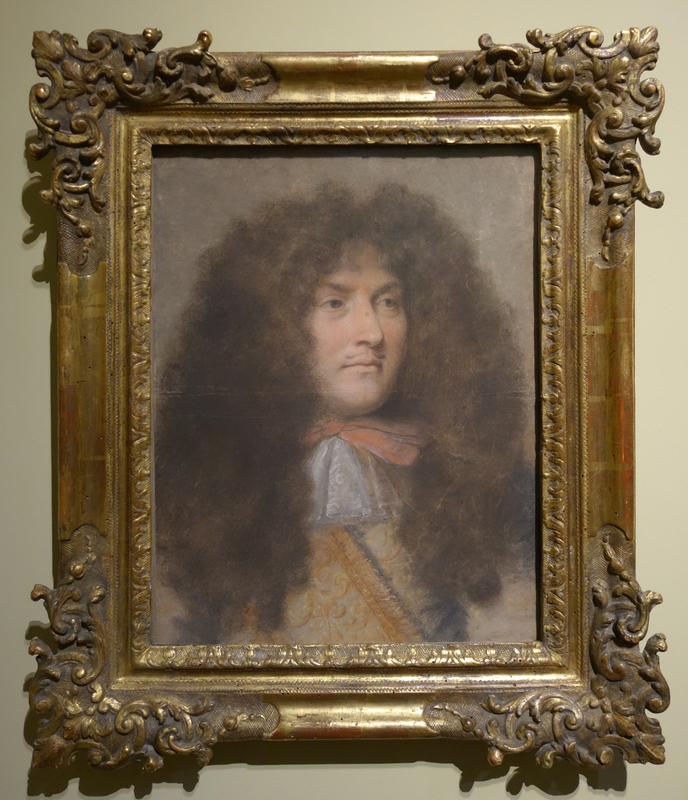 Another is on Mme Restout, recently acquired by Orléans from the family of the sitter; it is just the sort of frame one wants to find on a La Tour. A wider range of mouldings appeared in the 1760s, and an increasing number of them were oval. 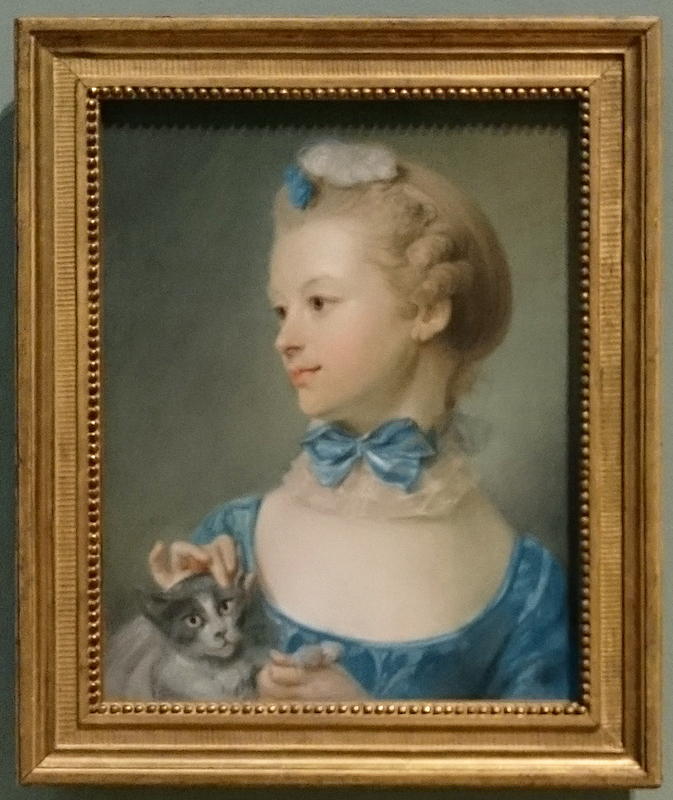 But none of these was exclusively used for pastels, and the practice of artists such as Vigée Le Brun who supplied her clients with framed works in both media was to use the same frames (see cat. nos 141/142 below) . Some readers may wonder whether any of this matters. Obviously some frames are nicer than others, so – if you have a good picture – put it in the best frame you can find. 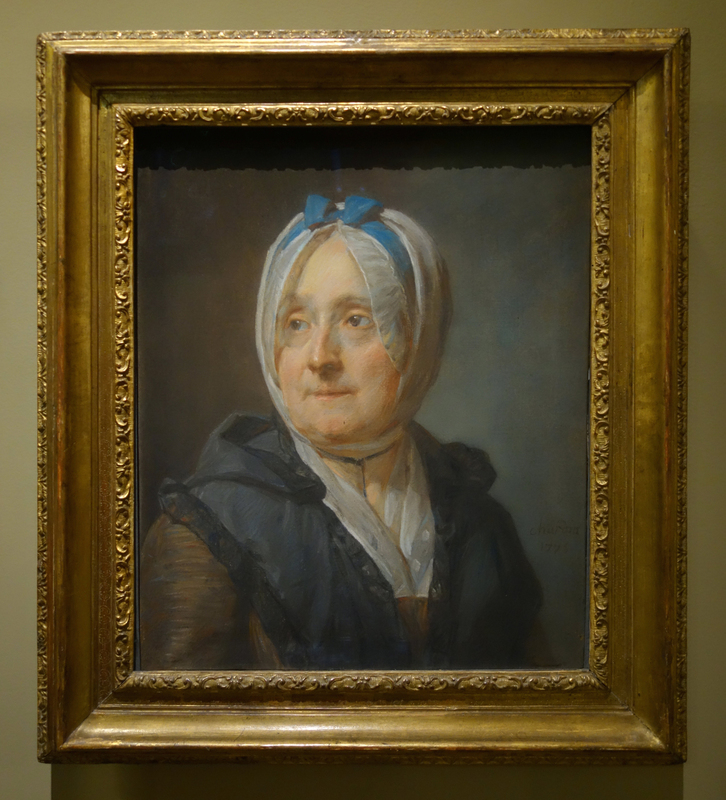 And that may well have been the prevailing thinking in many museums – particularly those with enough money to afford ‘enhancements’ (so paradoxically pastels in family collections may have been better served by inattention). 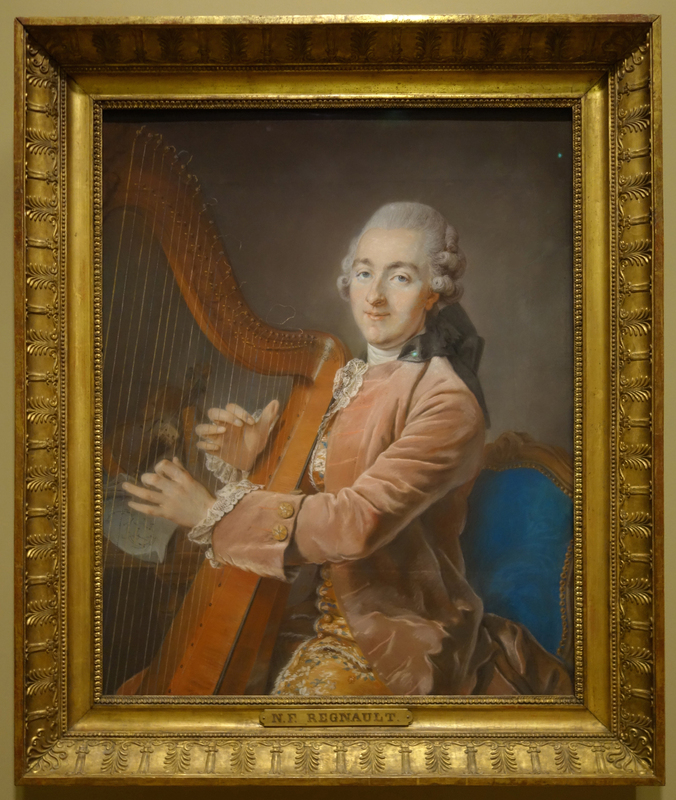 Today, however, the importance of authentic frames is more widely understood – even if it feels as though we’re thirty years behind the early music movement: we want Rameau on an original Ruckers harpsichord, not Wanda Landowska’s machine. 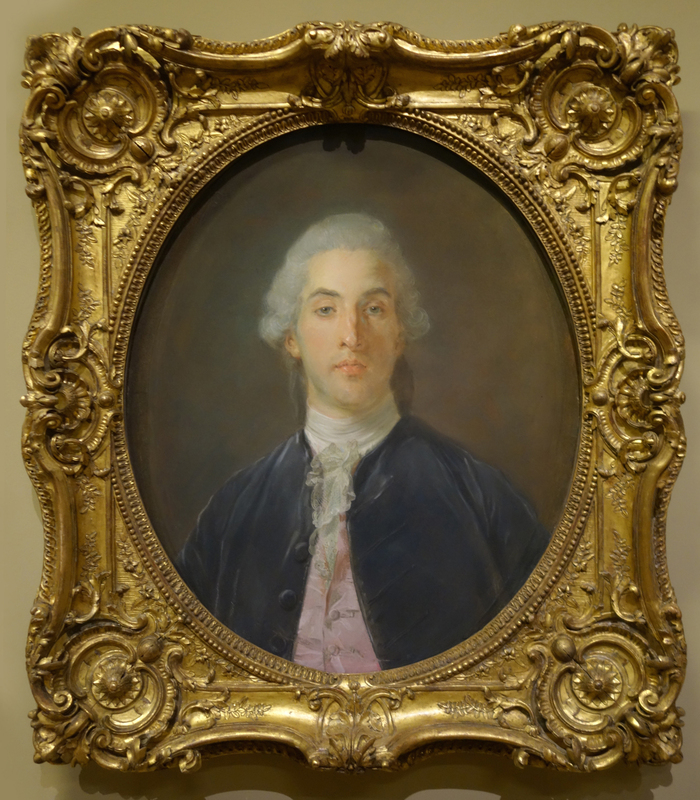 There remain pockets of resistance, where framers prefer to rely on aesthetic response rather than strict accuracy: something which is entirely understandable when we come across the extremely primitive frames supplied, for example, for Perronneau in Bordeaux in 1758 . 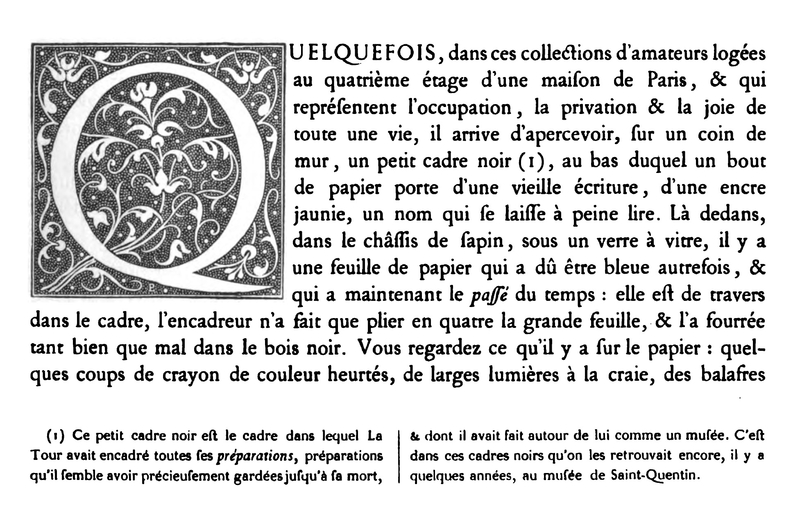 Let us remember too how the Goncourts chose to open their 1867 monograph on La Tour – with an account of the simple black frames for his préparations, a fact confirmed by the repeated references to black frames – ‘cadres noirs’ – in his brother’s 1806 will – although they have not survived. 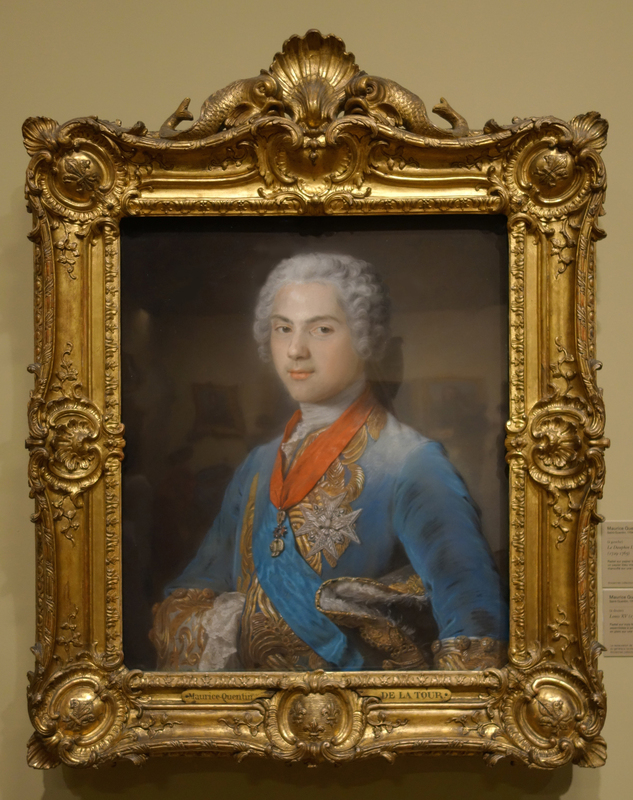 There is another accidental function of the frame in museums, beyond the proper aesthetic matching and integrity of endeavour: many of us were taught as children to recognise furniture periods by basic shape – curved is Louis XV, straight Louis XVI and so on. 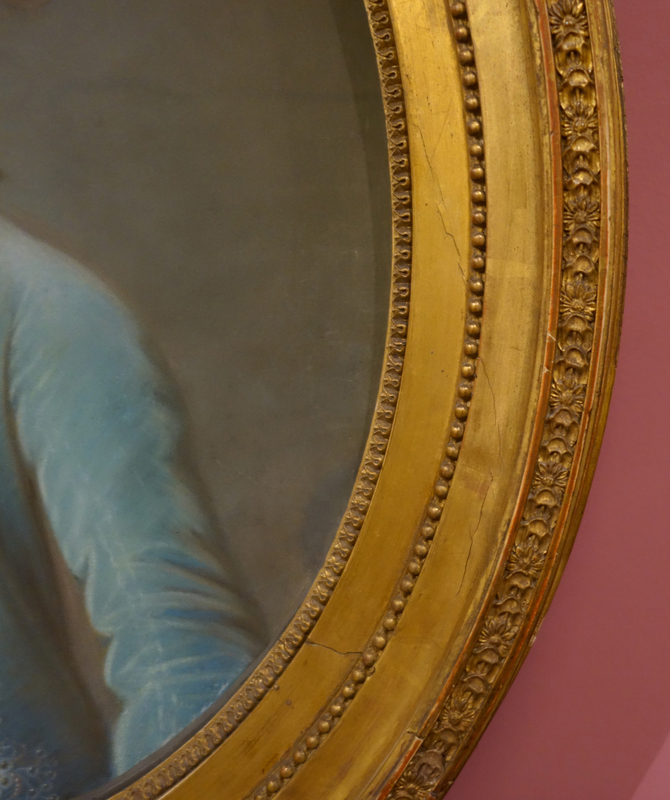 So there is a simple heuristic benefit in making sure portraits are in the ‘right’ frames, and it can be quite disconcerting to find a mid-18th century portrait in a Directoire frame. The recent Louvre exhibition compounded this by omitting dates from the labels. 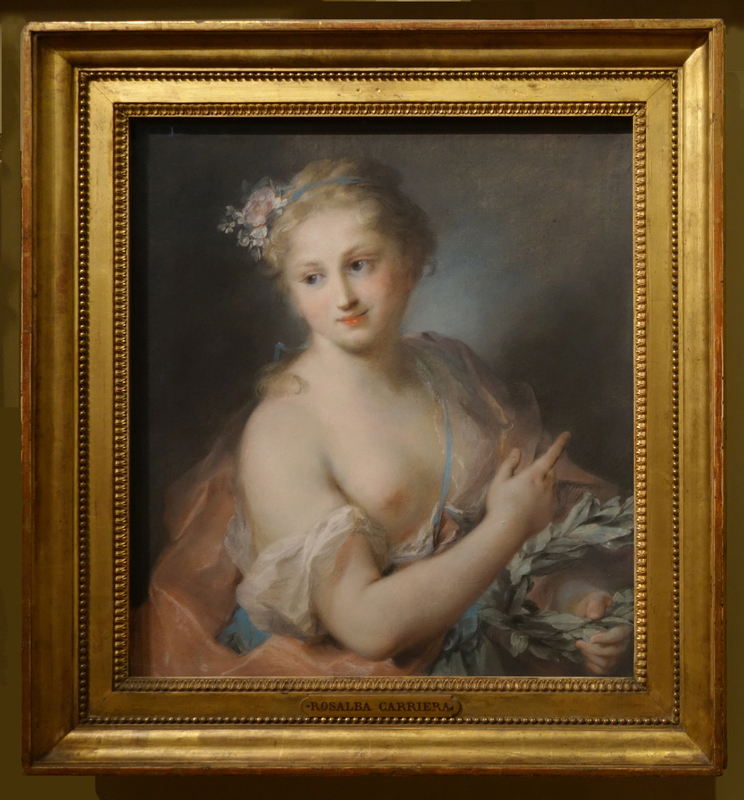 Particularly with pastels, where there are so few opportunities to see them, the Louvre has a special responsibility in that its presentations normalize the expectations of the public. It is assumed that they set the standard – and where irreversible past choices have made that impossible, there is a need for disclosure and explanation. 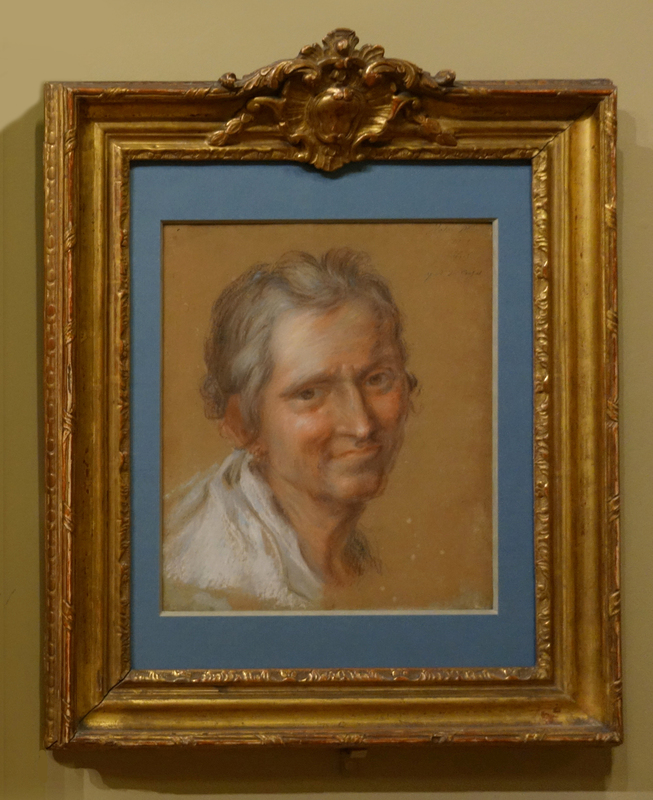 Fortunately the Louvre tends to keep old frames (several thousand, from which those in the current frame show have been drawn), so it is not inconceivable that a proper study could reunite some that 19th or 20th century taste have put asunder. We know too that amongst the finest pictures in the Louvre are the fabled morceaux de réception, or diploma paintings, presented by artists on admission to the Académie. 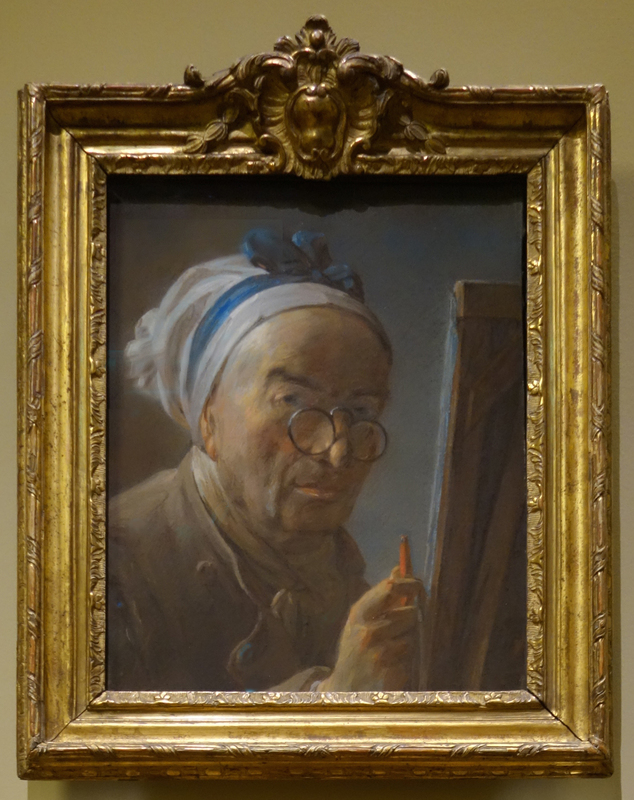 The Procès-verbaux record, for example, on 25 September 1728, the young Jean-Siméon Chardin offering a group of his still life paintings (oils of course): the Académie kept two of them, requiring him to have them framed, at his expense. 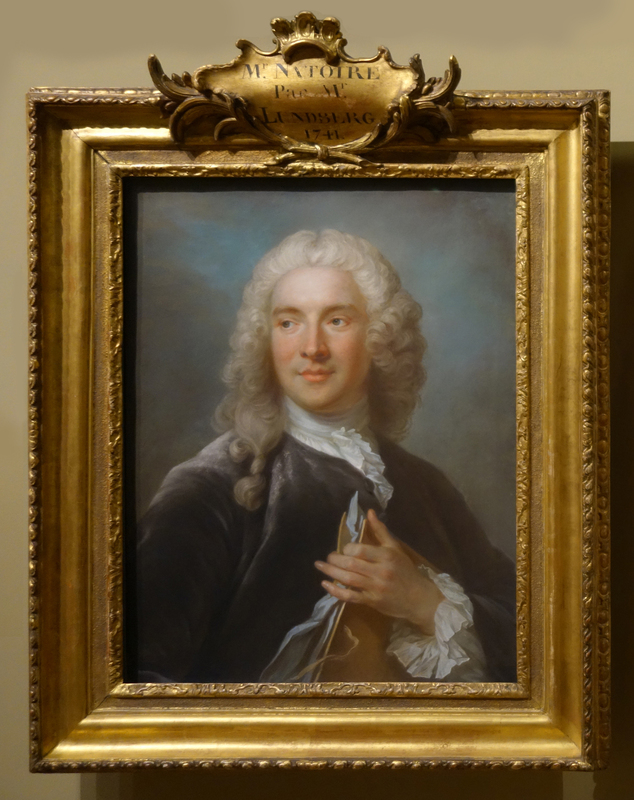 When Jullienne died (in 1766), he left self-portraits by Rigaud and Largillierre to the Académie, stipulating that each be given ‘une bordure digne des tableaux et de l’Académie’ (‘a frame worthy of the paintings and of the Académie’), the costs of which would be met out of his estate (de Montullé undertook the necessary arrangements). So it was long established that pictures for the collection must be appropriately framed. We will see too that a number of mouldings appear in the collection which I presume are Louvre standard patterns, albeit they have less of the livery appearance than, say, the famous Dresden frames. 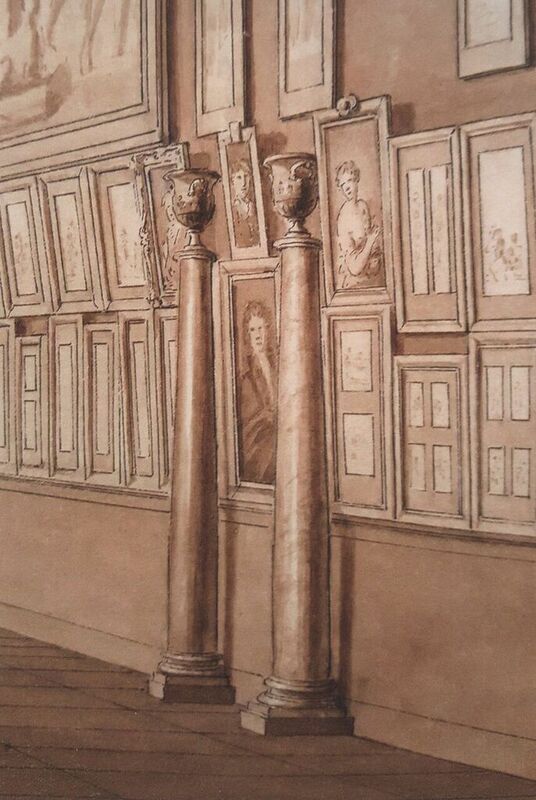 One can find in the Archives des musées nationaux documents such as a ‘rapport de M. Landon sur les bordures de tableaux à changer ou à restaurer’ (15 November 1821; ‘report by M. Landon on picture frames to be changed or restored’) suggesting a systematic campaign of reframing pictures from which it seems pastels did not entirely escape. Rather more recently (in the 1960s and later), many pastel frames were altered during what are now regarded as misconceived conservation campaigns, such as the fitting of Lepeltier boxes (an L-shaped wooden moulding which incorporates the spacer with an outer wrap for the strainer) which involved enlarging, and thus weakening, the rebates in original frames. I have said nothing either about the (mostly) 19th century labels on many Louvre frames (thankfully few on the pastels, but the Russell Mary Hall is a victim, with its misspelled ‘Vikery’): obtrusive visually, lettered at a time when typography was at a nadir, they frequently give as much attention to donors as to artists or sitters. 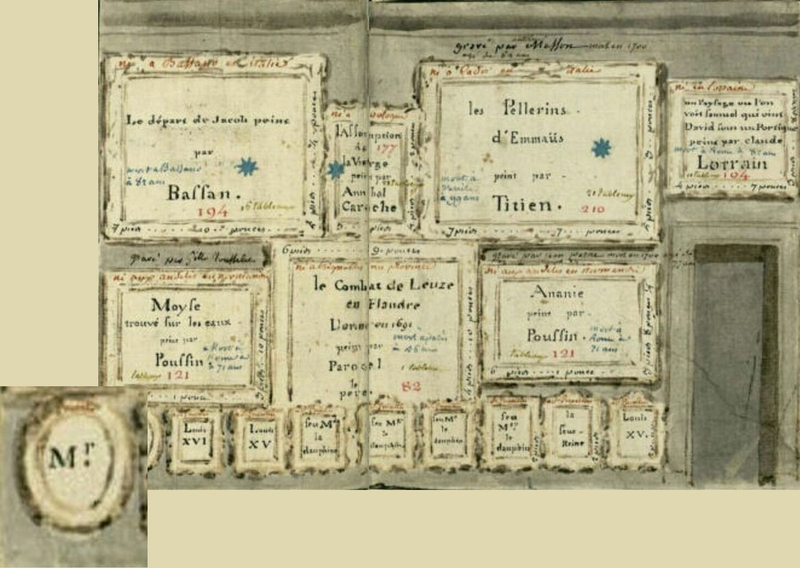 Of course every museum uses labels of some kind; the tradition at the Louvre goes back to a directive from the Minister of the Interior, of 19 January 1796, requiring that there be ‘placé sur chaque bordure un cartouche avec le nom du peintre et le sujet’ (‘fixed to every frame, a tablet with the title and artist’s name’). Let us now move from the general to the particular. I don’t have space to comment on each frame in the exhibition, and I will try not merely to repeat what you can find in Xavier Salmon’s catalogue (‘XS’ in what follows) or what you can see for yourself in the many photographs of the exhibition available on social media. Numbers and titles in bold refer to the catalogue (there were no exhibit numbers in the exhibition). If you don’t have the catalogue to hand, I have also cited the J numbers which you can find in my online Dictionary of pastellists – just type the J numbers into the search box to be taken to the pdf where the work is reproduced (without frame, I’m afraid) and discussed, often with information not in the catalogue. (You can also find the Dictionary entries from the catalogue numbers by searching ‘Salmon 2018, no. x’ where x is the catalogue number). There’s a concordance of catalogue and J numbers here. I should add that I am not a frame or furniture specialist; I have not examined the frames in studio conditions, have not inspected the backs and haven’t read all the conservation files. I would be most grateful if readers who have been able to do so can add or correct any of my observations. 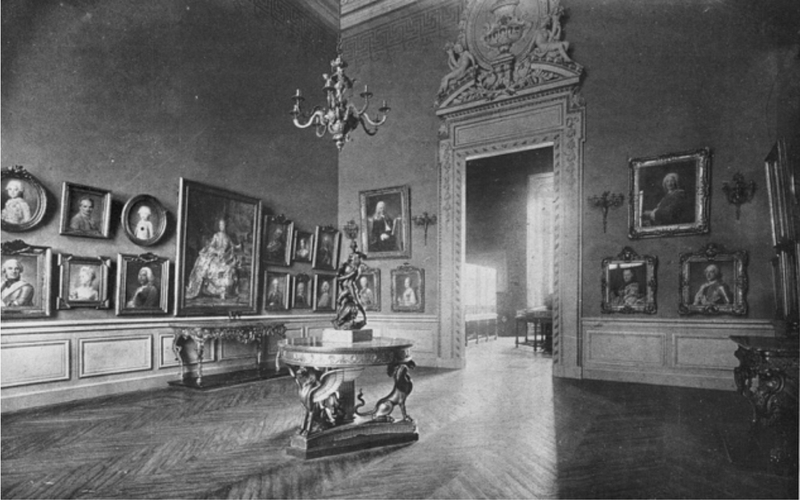 I have however consulted a number of historical documents (many overlooked or not included in XS) which can shed light on the frames; and of these the most important is an early photograph of pastels hanging in the Louvre, published in 1919 . J.468.11. 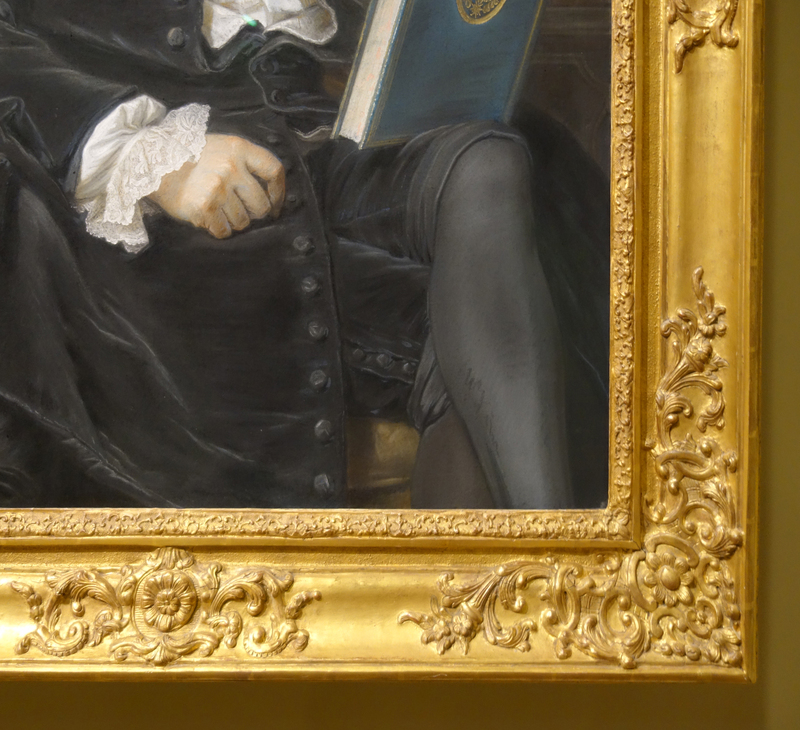 This portrait illustrates the problem for this discussion: it’s in a nice Louis XIV frame with fleur de lys corners, of a model sometimes even called Le Brun. But how can we tell if it was original to this pastel? The glass however is modern (probably Mirogard, to judge from the green hue of reflected spotlights). ‘reste le cadre, non localisé à ce jour’ (‘the frame was left, but has not, to date, been located’). Michel Laclotte appealed to the thief to take great care of the work in the press immediately afterwards. 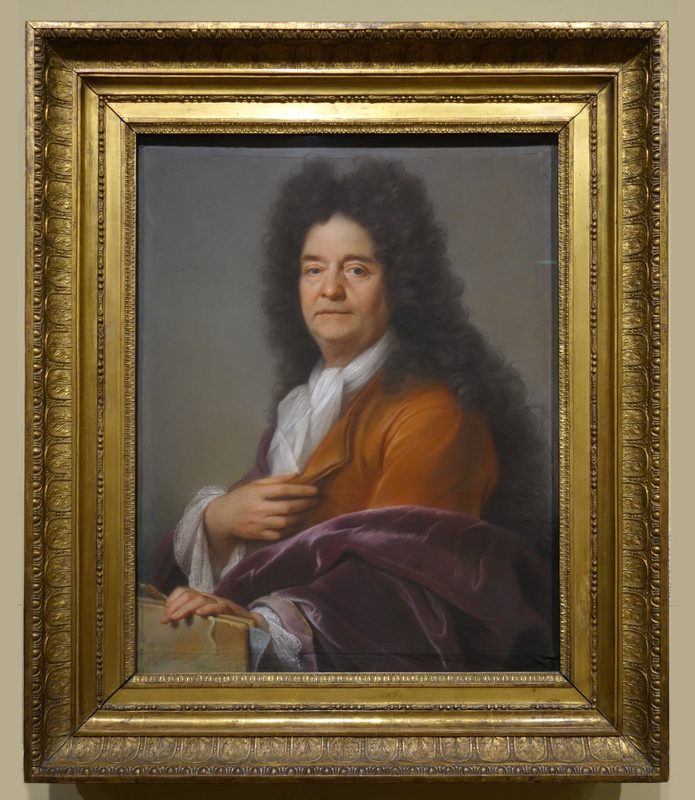 The report in L’Humanité suggests that the pastel may have been unscrewed from the frame with the glass attached in a ‘montage paquet’, in which case there is a far better chance of survival than with a traditional assembly. J.77.338. 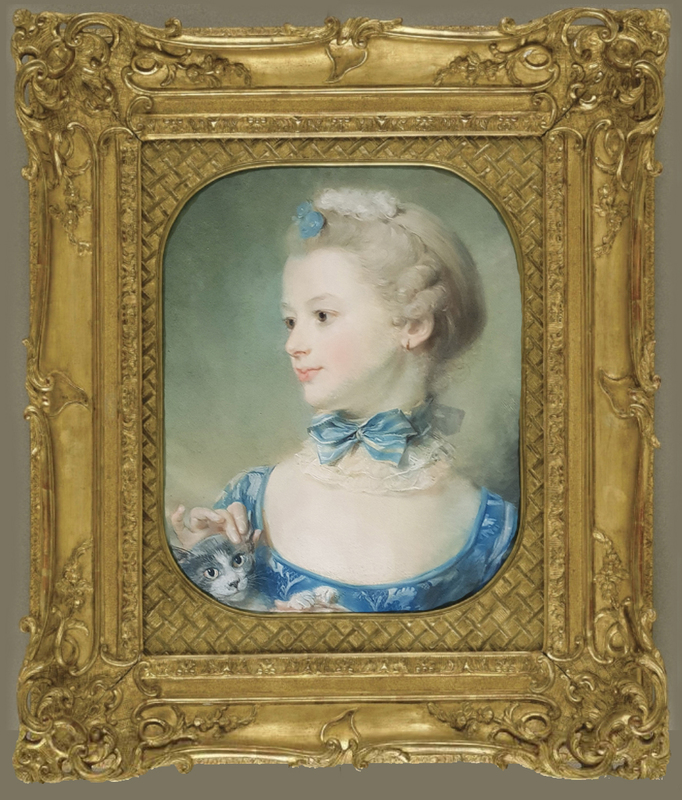 In a completely unsuitable Louis XVI/ Directoire frame, perhaps a century later than the pastel (1698), elaborated from the model widely used in the Louvre (see cat. no. 32 below). In XS’s Louvre lecture (YouTube, at 46 minutes 10 secs in) it is stated that the frame for cat. no. 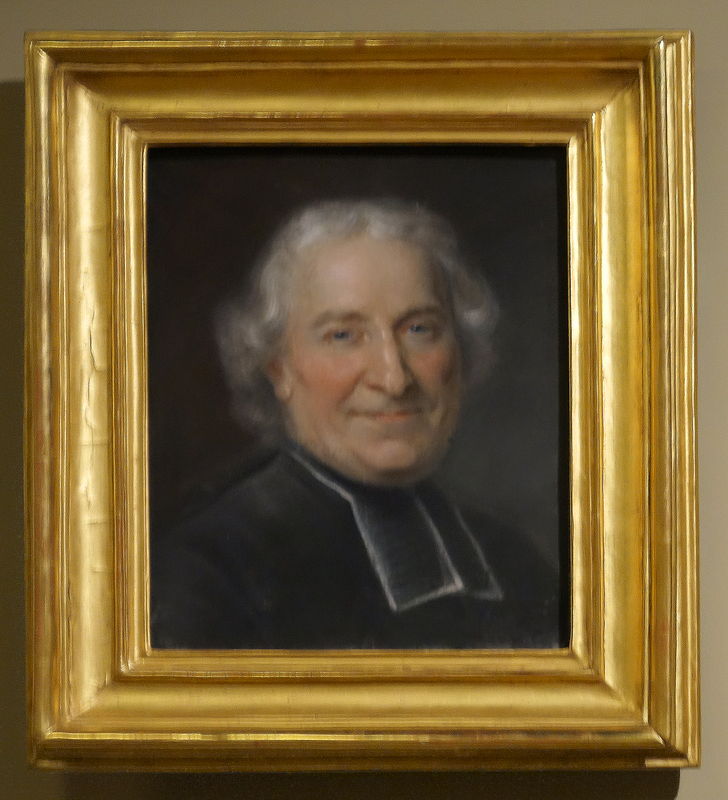 19 (Maximilien Emanuel, duc et électeur de Bavière, see below) was made by Vivien’s brother: as far as I am aware the only relevant document is the payment to Jacques Vivien of 174 livres on 7 November 1700 by the Bâtiments du roi for the frames on these three portraits of the royal princes. The versions of the paintings at Schleißheim, which are signed and may arguably be the primary works, are in quite different mouldings. J.77.278. (See also the entry to cat. nos 16–18, above). By far the most exciting of the Vivien frames, enhanced also by the presence of the original glass (whose charm however is offset by the bizarre decision to install secondary glazing between the pastel and the old glass). Unsurprisingly it bears the Wittelsbach arms, more specifically with the charge of Arch-Steward of the Holy Roman Empire (the orb in the central shield, not a Carolingian crown as required from 1706 to 1714), appropriate for the duke of Bavaria until 1706. We know how extensively Max Emanuel used French craftsmen for his programme of artistic display, but it is not clear (to me at least) whether this was executed in Paris or Brussels. Börsch-Supan deduced, from the absence of any payment for the work, that it was a gift to Louis XIV or the Grand Dauphin from the sitter (whose sister had married the Grand Dauphin). J.77.188/J.77.206. 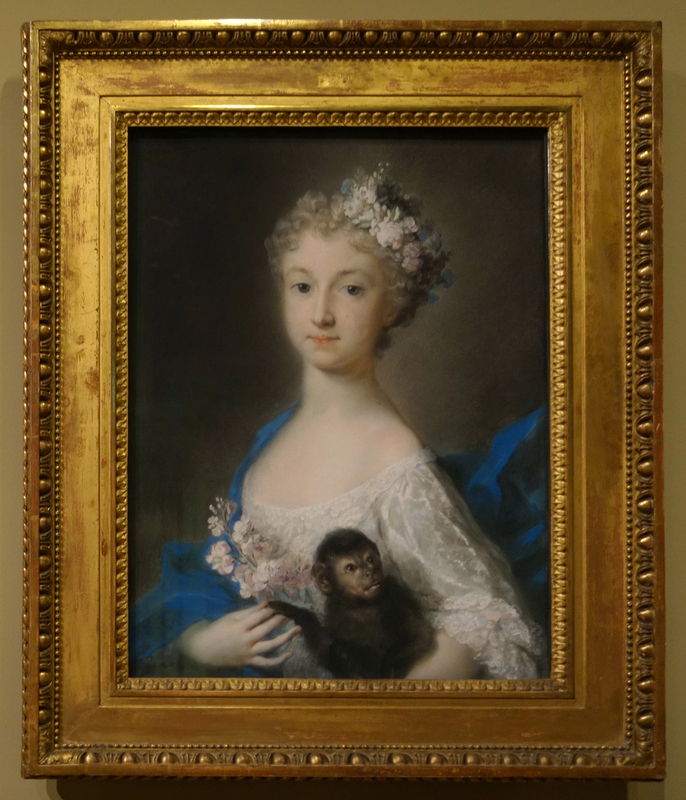 Both Vivien’s reception pieces are still in frames of the same model as that of the Vivien Abbé Lalouette, acquired in March 2018 by the Nationalmuseum. They may be assumed to be the cadres d’origine, which are nevertheless somewhat weighty for modern taste. Neither has its original glass. 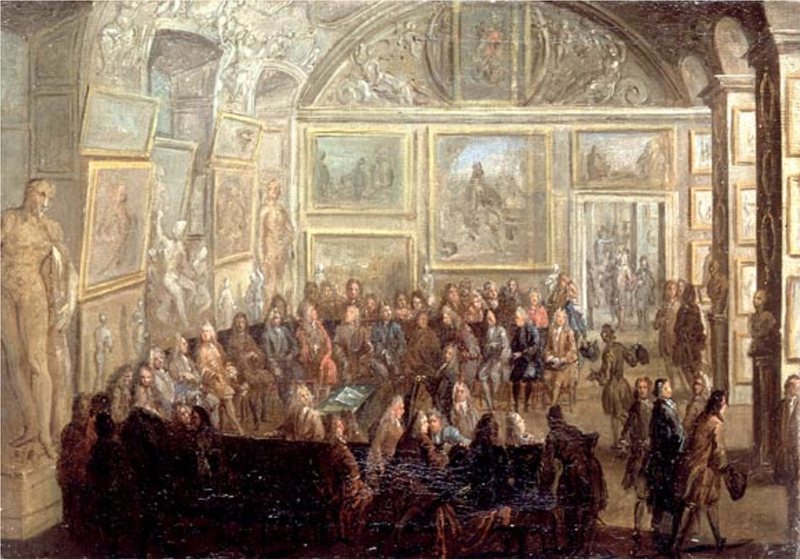 Guérin’s Description de l’Académie (Paris, 1715) provides an exact layout of the Académie’s portraits, showing Vivien’s Girardon opposite Antoine Coypel’s 1715 self-portrait (no. 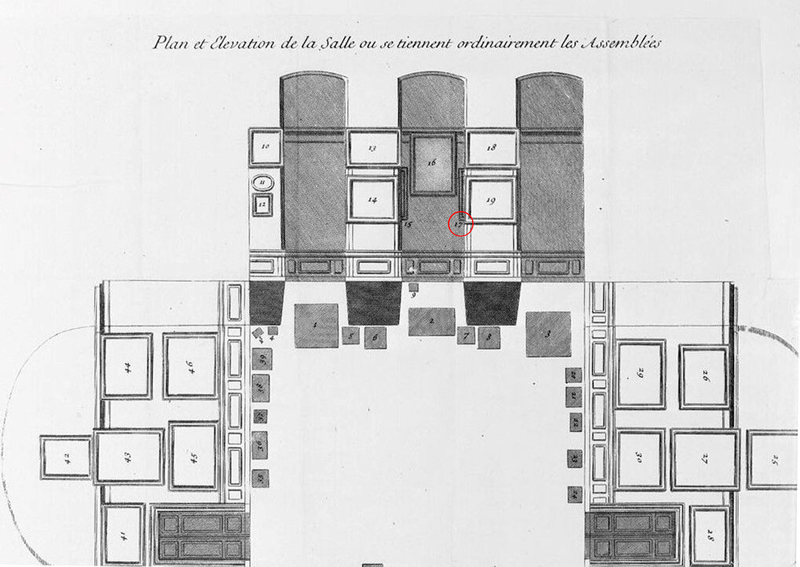 17 in the diagram, circled in red), placed in an alcove between two large Rigauds in the Salle d’assemblée (now the salle de Diane). Although the recess (to the left) is partly obscured by two sculptures in Martin’s Assemblée, it appears that both works are also partly hidden by Santerre’s Suzanne et les vieillards in the middle, which is annoyingly tilting forward. 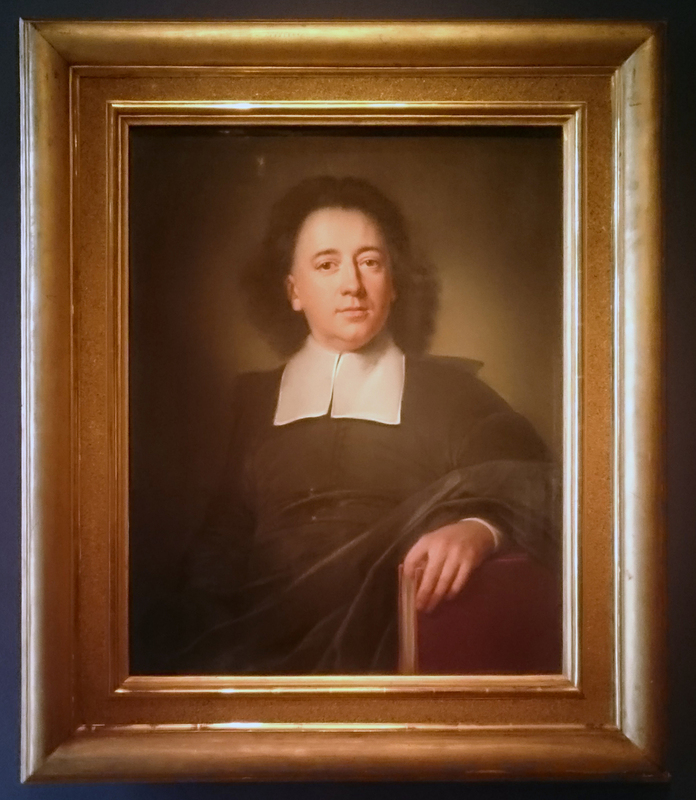 The pastel of Robert de Cotte by Vivien is again in a recess in the outer, first room: see the further discussion under cat. no. 38 (Rosalba Carriera’s Nymphe d’Apollon) below. J.171.105 & J.171.107. At first sight these appear to be matching pendant classic pastel frames. On closer inspection we can see that the mouldings are not precisely the same. And while an excellent job has been done to restore cat. no. 26, a fairly recent RMN photograph (metadata suggest 2013, but these are not always reliable) shows that it had suffered extensive losses of gilding, particularly to the top edge (all four sides). A similar chip to the lower right corner, top edge, of her son, seems to have been more summarily repaired with shell gold. But one wonders if it is a replacement for a matching frame which might have suffered more heavily. 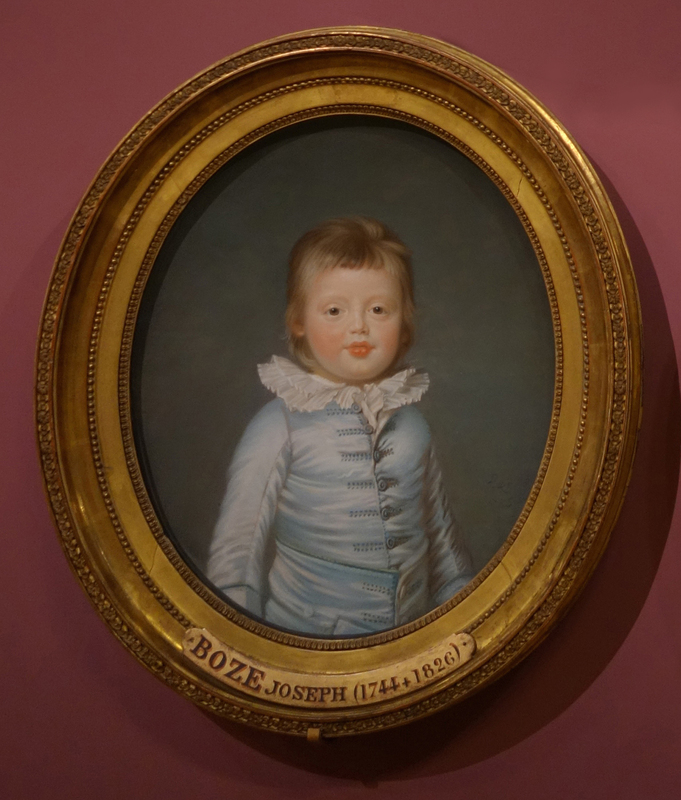 And one notes that damage to frames requiring the pastel to be unframed is one of the greatest hazards they encounter: is the condition of his face the result of abrasion from such an adventure? J.177.101/J.177.177. Both presumably reframed. The late Louis XVI model for Mme Boze is a Louvre favourite: a piastre top edge, a plain hollow scoop, a pearl row, a flat frieze as wide as the scoop, and a narrow rais-de-coeur sight edge (see also cat. no. 86). 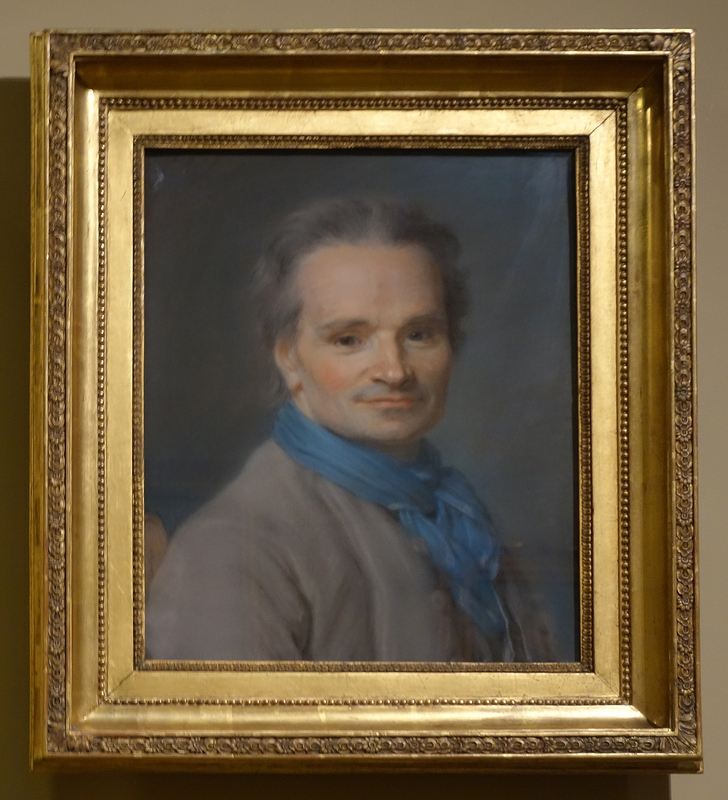 The self-portrait was finished in 1782 at a time when Boze consistently used a different style (see cat. 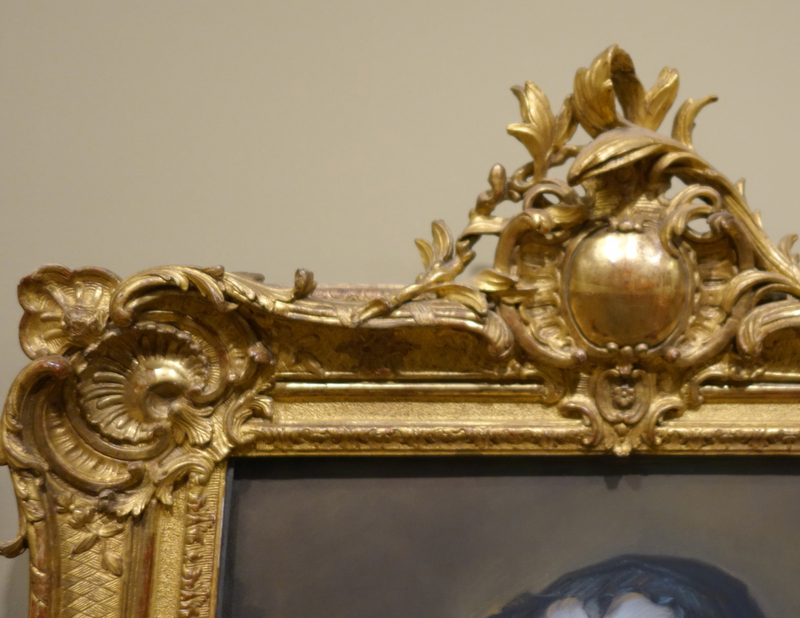 nos 33–35 below): the current frame has slightly overemphatic leaf decoration. J.21.2378/J.21.0442. These two heads are effectively drawings (indeed they raise questions as to whether they are within the scope of the exhibition). Cat. no. 36 is close-framed, but the discolouration of the paper reveals that it has had other presentations. Cat. no. 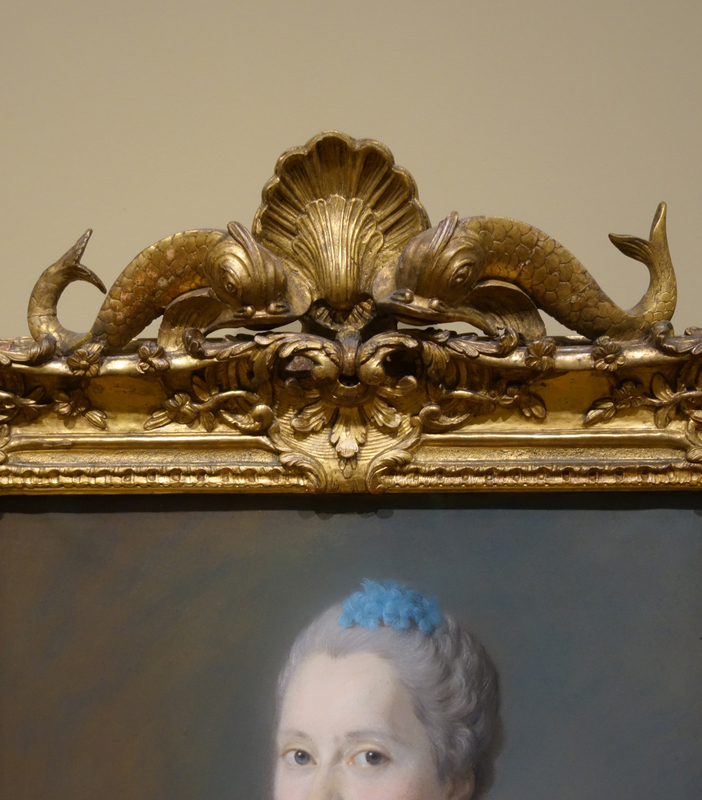 37, however, has a modern drawing mount of a good deep blue to relieve its austerity, but without the decoration Mariette would have added to make it less institutional. But the mount is then placed in a baguette/fronton frame of the wrong proportions. The disappointment is enhanced when one finds the same moulding on two Chardins (cat. nos 42, 45 – q.v.) and a Nattier (cat. no. 110). It was presumably a standard Louvre frame still in use in the 1960s. It may of course be that one is original, and the others copied from it. J.21.1727. The recesses in the Académie’s rooms discussed above (cat. nos 20/21, Vivien’s Girardon & Robert de Cotte) may have been chosen to minimise light exposure, but, as the piece by the Amateur de Province makes clear , the Académie’s location of the Carriera Nymphe de la suite d’Apollon, which it received seven years after Guérin was published, was less than ideal (other than in respect of the name of the gallery). His views were ignored, as we can see from Bourgeois’s Exposition des dessins… (it dates from slightly later than the 1797 scene depicted), where the pastel is clearly visible in full light , right of the pillar, second row; beside it, between the pillars, is Vivien’s Robert de Cotte, which remains in its cadre d’origine. 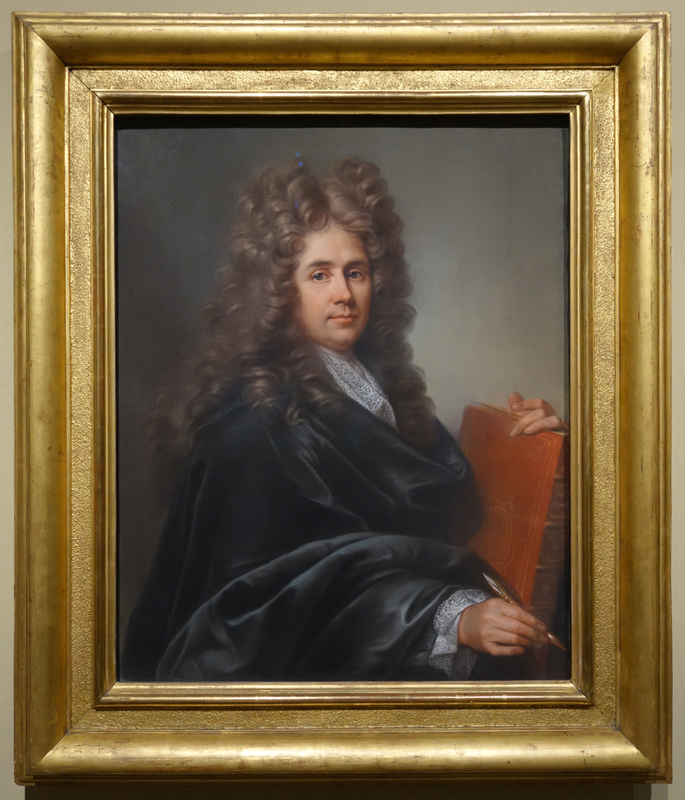 We know from the detailed correspondence (published by Sani in 1985 and reprinted in XS, p. 94) that the pastel was sent from Venice unframed, and that Nicolas Vleughels arranged to have the frame made for it in Paris. 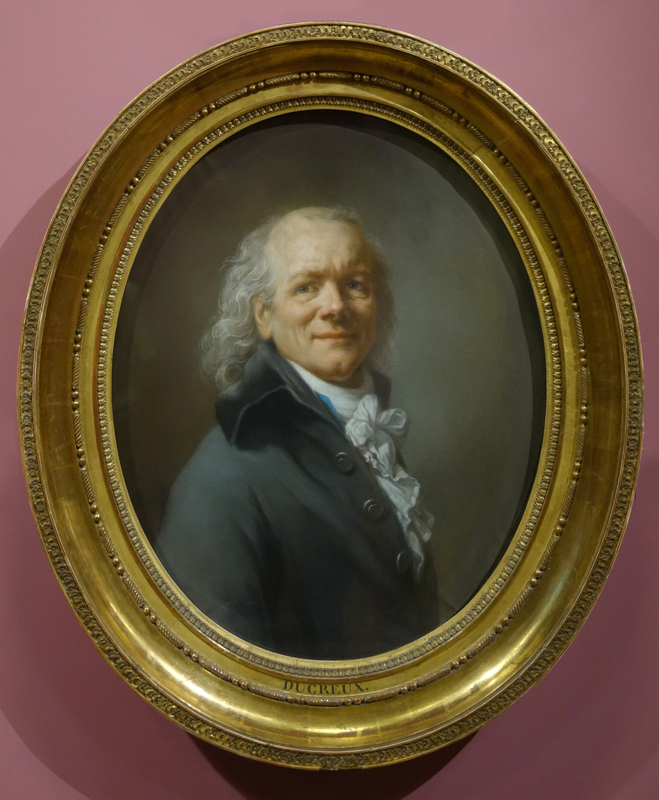 My recollection (although I can find no images) is that some of Vleughels’s own pastels in the Louvre (they were not in the exhibition nor in the catalogue) are in similar light baguettes with decorative frontons, but neither my recollection nor Constantin Bourgeois’s draughtsmanship suffice to claim an exact match. In any case the current frame on this work was evidently added after the date of the Bourgeois drawing – possibly not much later. It is singularly inappropriate. J.21.054/J.21.0575. 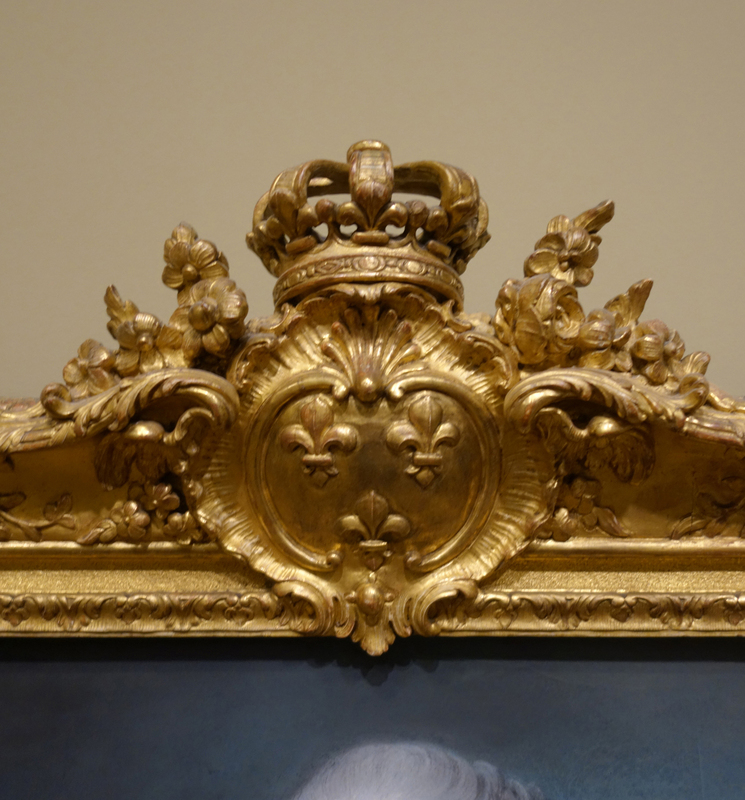 Inappropriate Louis XVI frames. J.219.103/J.219.115/J.219.136/J.219.13. This extraordinary group of pastels has drawn the most lavish praise from all eras. 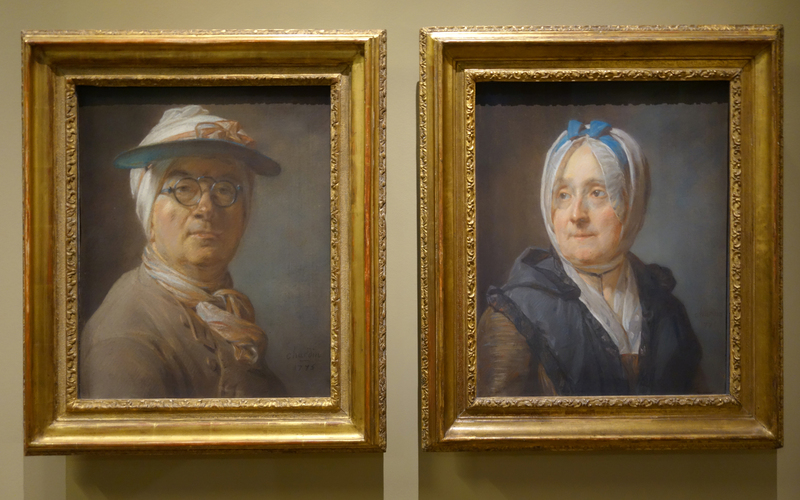 The classic simplicity of the frames for the pendants 43 and 44, of Chardin and his wife, are exactly right. Those for 42 and 45 are a little fussy; that they have matching decorations suggests they were made together (although their dimensions differ), making it all the stranger that the Self-portrait with spectacles (no. 42) has a border at the bottom, suggesting that the frame is neither original nor made for the pastel – although it was no. 42 which entered the collection of the Louvre first, some 130 years before no. 44. 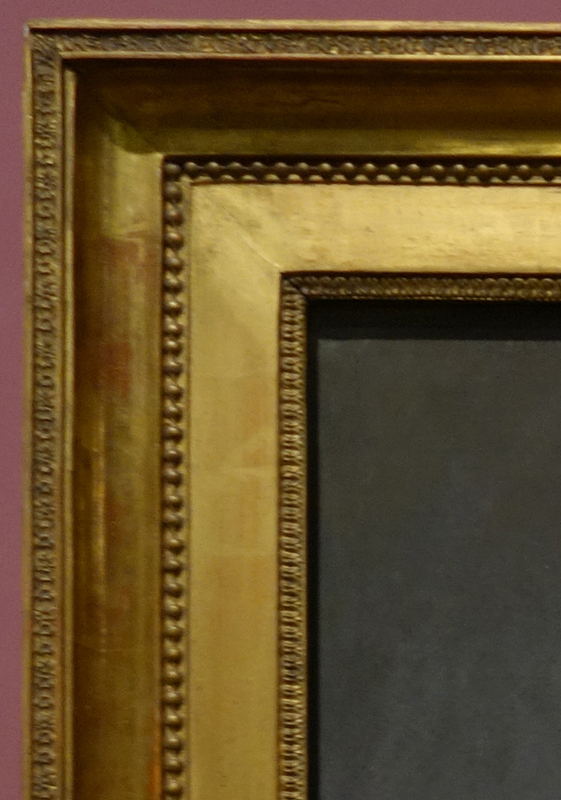 Presumably both frames postdate the second acquisition (1966) – a theory reinforced when one notices the same moulding on cat. nos. 37 (Rosalba Carriera, La gouverante de Crozat) and 110. There is a further source that may illuminate this: the extraordinary 1867 canvas by Philippe Rousseau entitled Chardin et ses modèles in the Musée d’Orsay. One cannot be certain if this was the real frame which cat. no.42 carried in 1867: the extraordinary fronton, if not purely Rousseau’s fantasy, would have been vulnerable to damage, thus explaining why it might have been changed (although the mount suggests that it too was a later addition). But whatever the documentary value, the painting, by treating both the self-portrait and its frame as the objects of a still life, beautifully reinforces the message of this essay. J.2472.333. 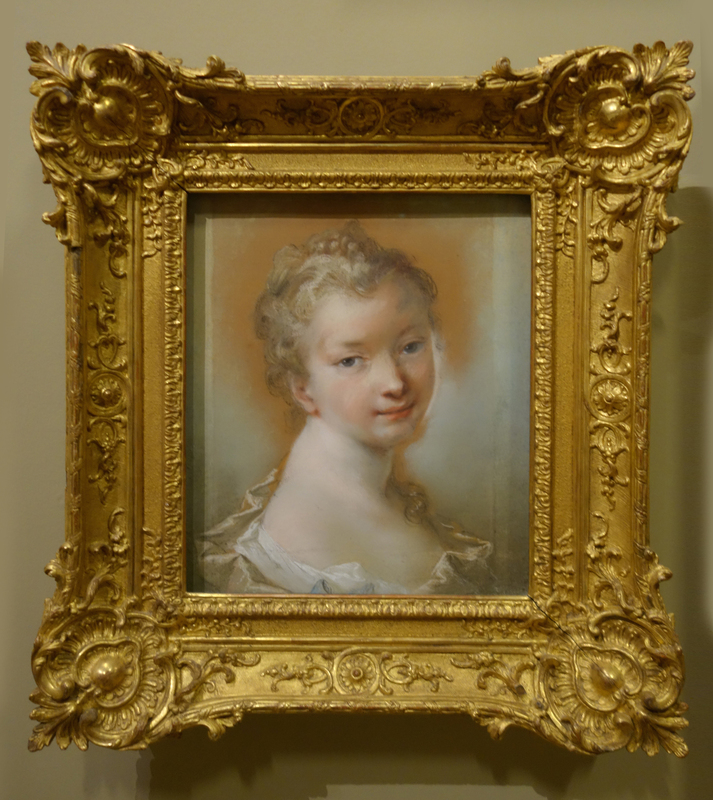 Lovely swept Rococo frame – but not for this pastel. It doesn’t fit, and the slip is nasty in finish and shape. J.285.151. 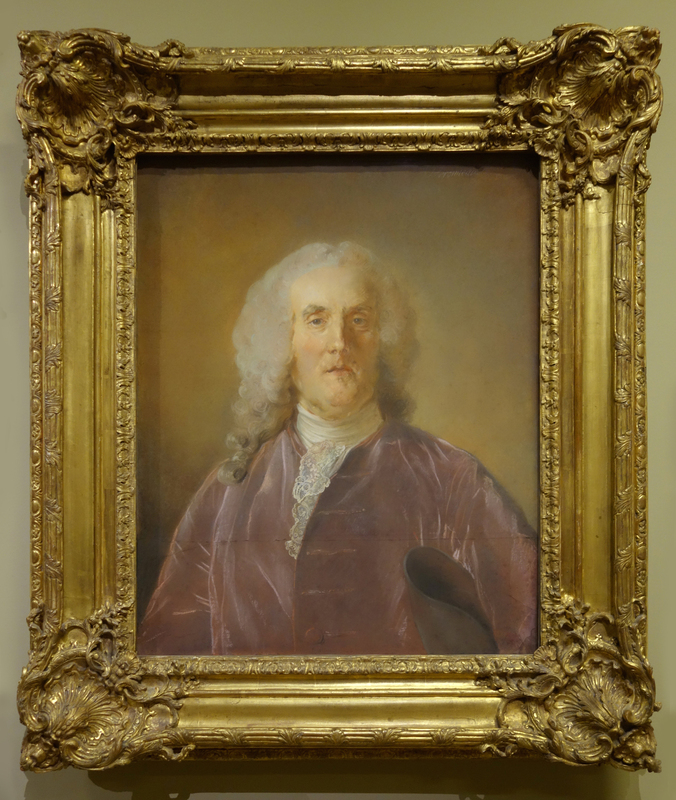 Although the frame looks right, the pastel is now mounted on an expensive, elaborate and surely later châssis à clés, standing in contrast to the very loose weave of the original canvas. As the strainer cannot, I think, be original, we cannot be certain whether the frame is. J.438.104. 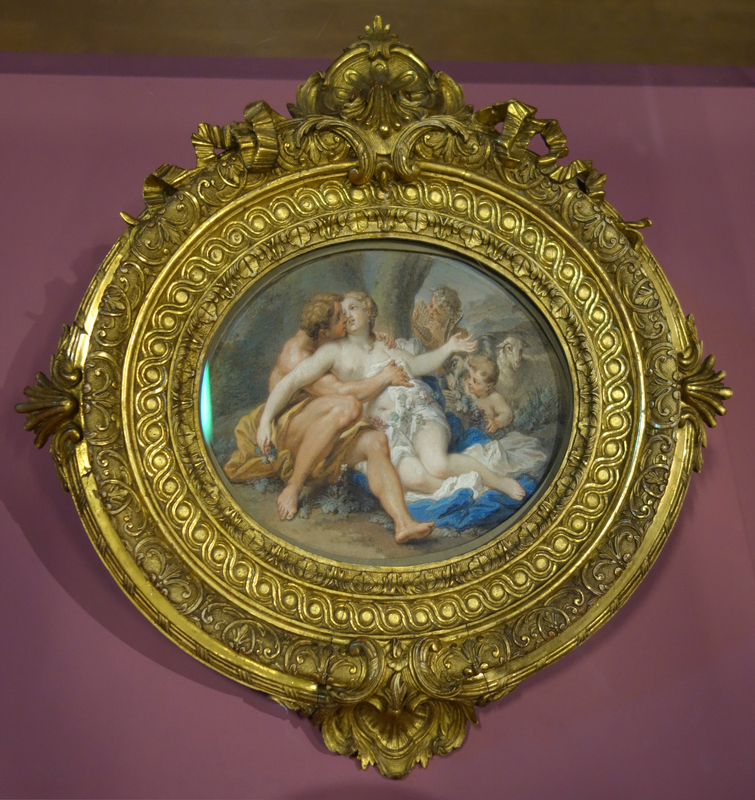 This type of oval scotia frame was widely used in the 1790s on by artists including Vigée Le Brun – and Kucharski. 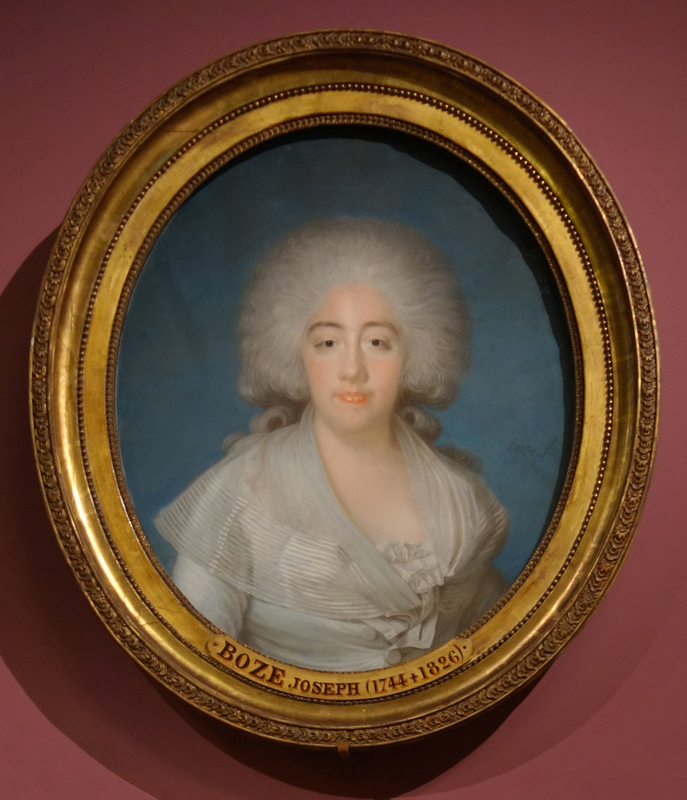 An example is the Princesse de Montléar (Toulouse, Fondation Bemberg). 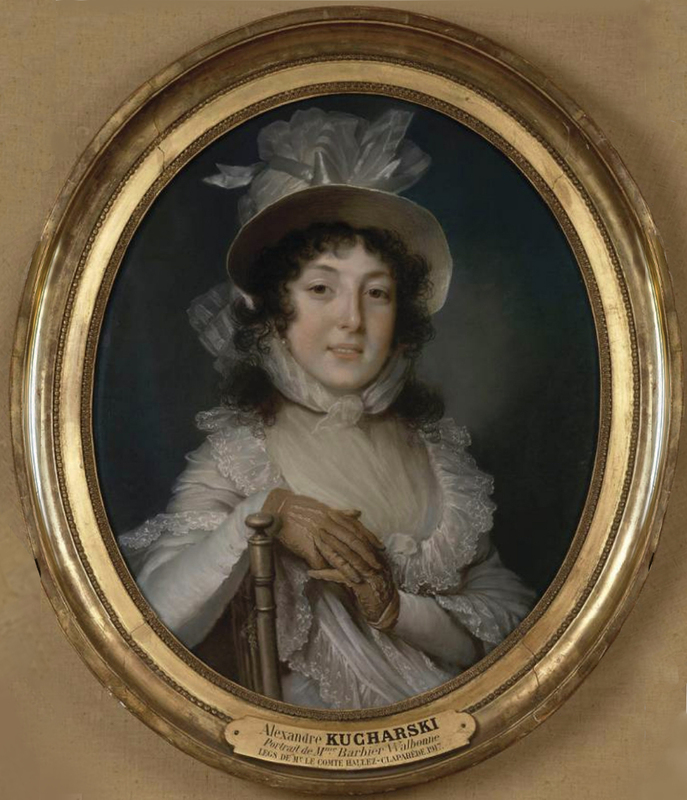 Another is the Kucharski pastel of Louis XVII which belonged to the impératrice Eugénie when it was displayed in the Petit Trianon https://www.akg-images.fr/archive/-2UMDHUS9T5MX.html , and which XS assumed was the 19th century copy presented to Versailles after her death (in his 1997 catalogue, one of the few Versailles pastels which do not belong to the Louvre), and which is in a quite different frame stamped by Létonné. 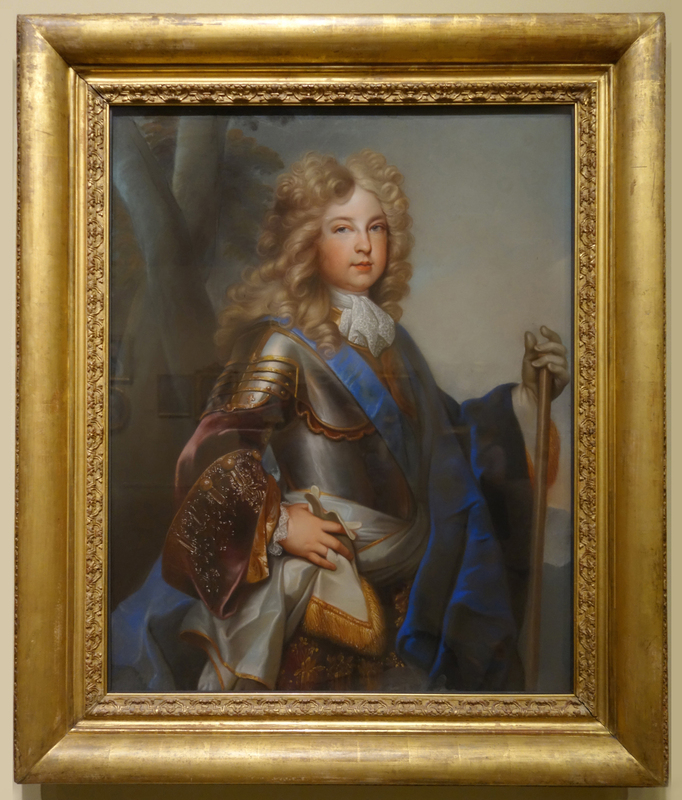 The reproduction I have found of the original frame  doesn’t allow us to say for certain if the Versailles pastel was the same or a substitute – the enigma is reminiscent of the legend of the dauphin’s imposters. J.46.1009. 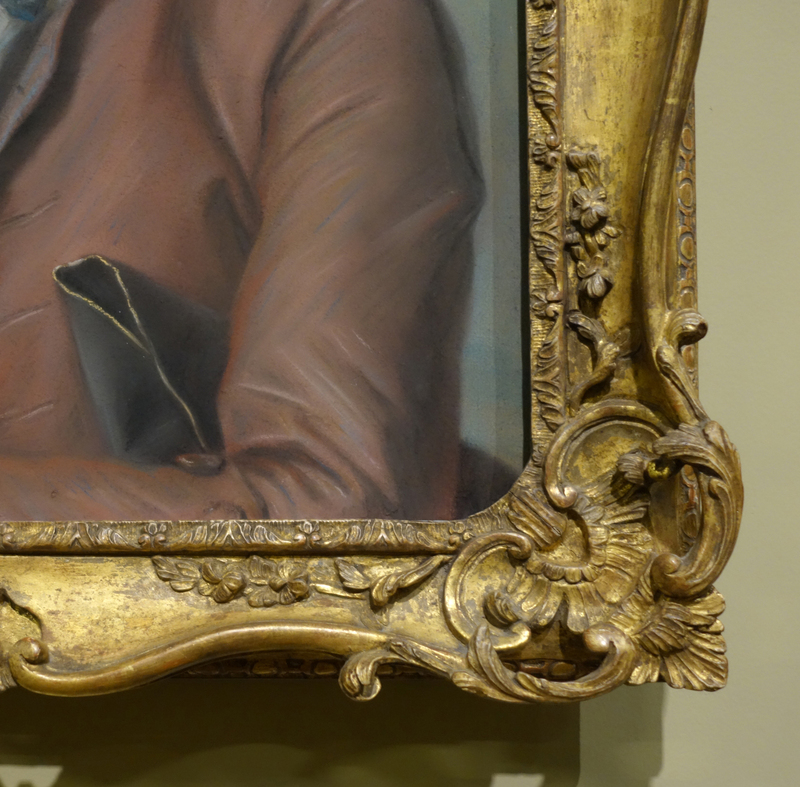 A skilful repair has restored the ribbon surmounting this Louis XVI trophy frame (almost the whole of the part extending above the main rail had been broken off). One cannot but wonder whether La Tour en Démocrite would have wanted to appear with laurel festoons and ribbons (the outer decoration is acanthus leaf, the sight edge rais-de-cœur, or lamb’s tongue), but I suppose by 1776 anything was possible. J.46.2926. 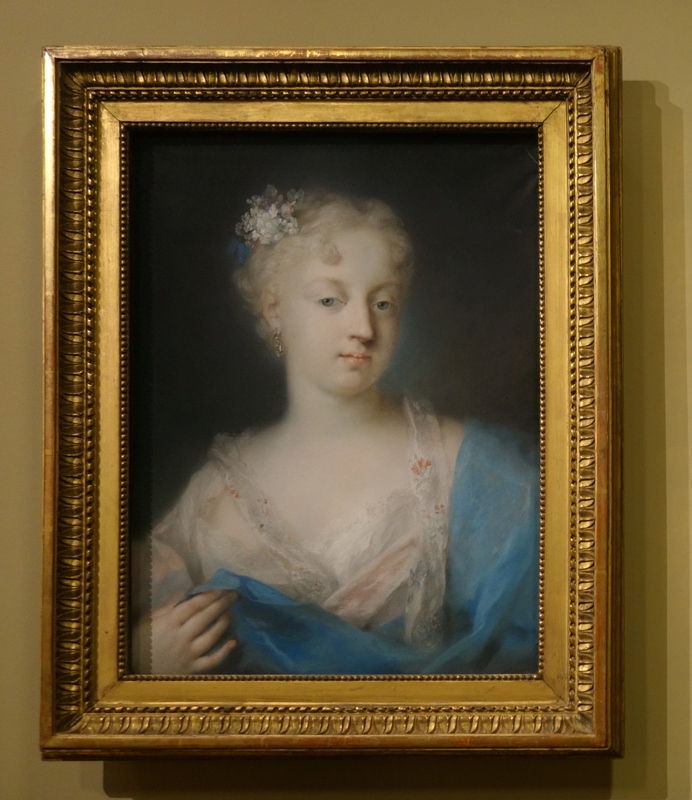 At first glance this splendid frame looks like a later addition; in 1737 when this pastel was commissioned one would have expected something closer to the standard pastel frame still found on Mme Restout (above). 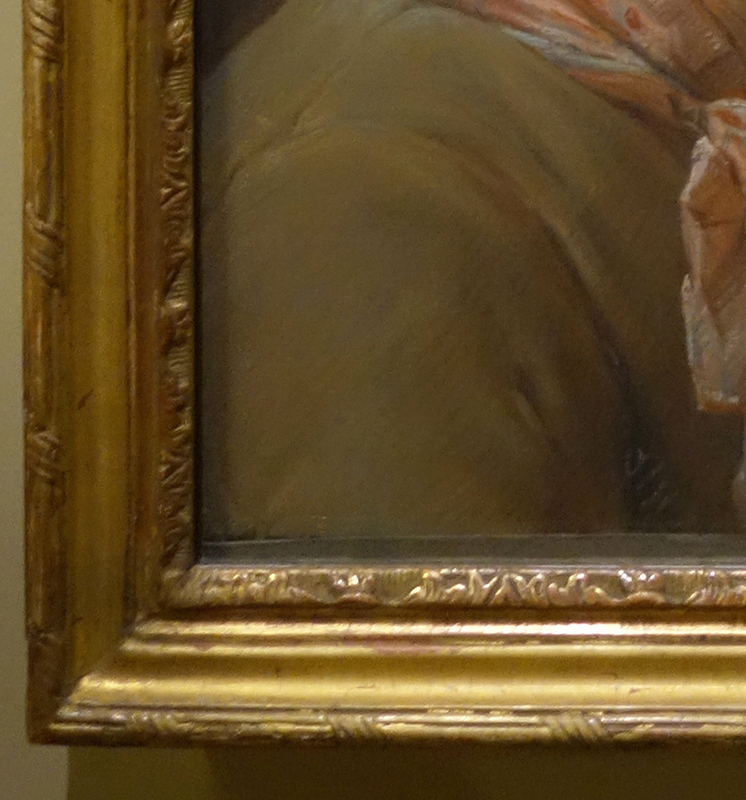 On second thoughts one finds a very similar pattern of frame on the portrait of her aunt, La présidente de Rieux (both pastels, with the Getty portrait of the president, descended together at the château de Glisolles until the First World War): there are minor differences where the smaller frame of cat. 79 doesn’t have room for the full elaboration in the Cognacq-Jay example. 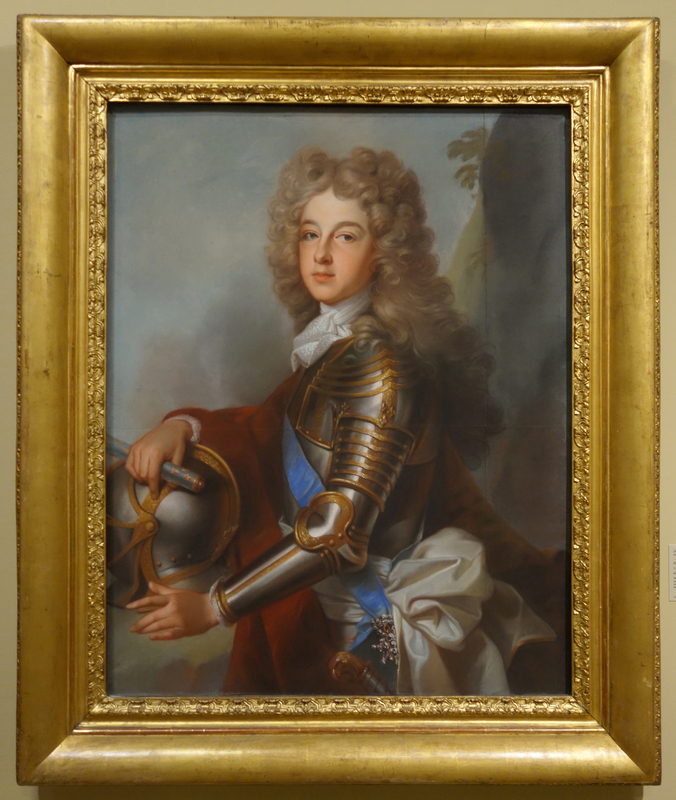 La présidente (1742) was auctioned in 1923, and bought soon after by Ernest Cognacq; it was certainly in its present frame by 1923, when, very unusually, it was reproduced with its ‘très beau cadre ancien Louis XV’ in the sale catalogue (it also appeared in a photograph of an exhibition at the Samaritaine two years later). 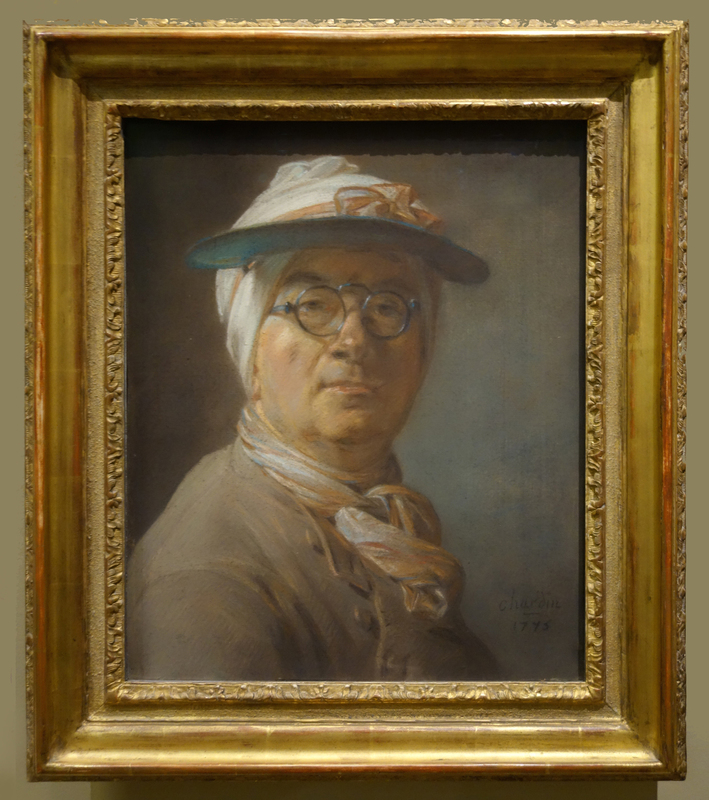 Mlle Marie-Louise, however, was acquired directly by Arthur Veil-Picard from the owners in 1918, before the auction. (Le président was acquired similarly, but by Wildenstein.) There doesn’t seem a simple solution that would explain which frame was copied from which. J.46.1819. 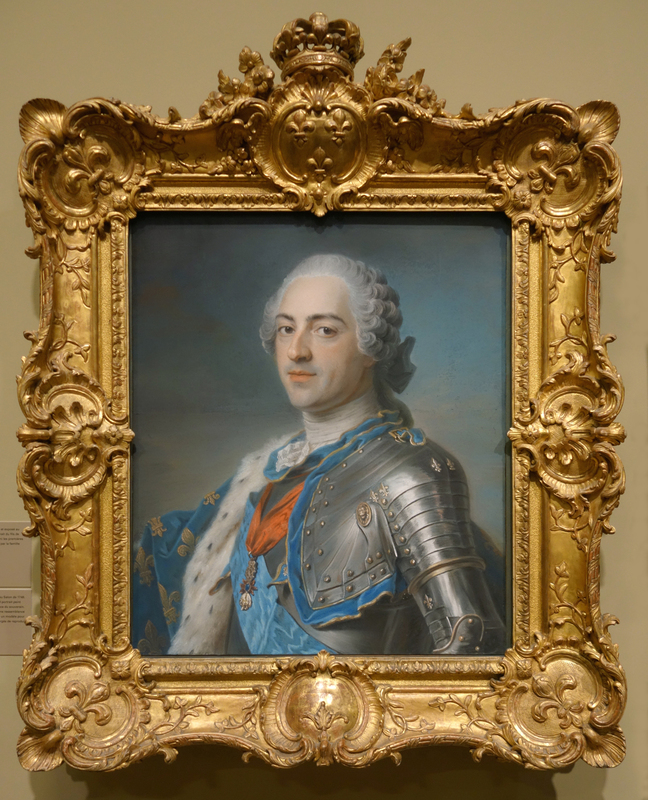 The splendid Louis XV swept frame appears to be a later addition, perhaps having required the quite elaborate extension to one side of the pastel (with the addition of a one inch batten). XS states that this occurred at an uncertain date. The new frame was in place by 1919, and it is tempting to assume that the alterations took place c.1852, the date appearing on some newspapers used to line the back of the picture. But after examining a series of documents in the Archives des musées nationaux from which I have been able to construct a detailed account of the provenance (see my blog post at cat. no. 80), and the report on the condition of the frame when it was still with the descendants in 1852, I came to a different view: the proportions and aspect ratio of the work is confirmed by the 1747 engraving, and the dimensions have not changed since 1852. The frame apparently was in poor condition, and may well have been replaced or repaired (hence the new lining paper), but the radical addition had been made before 1747. 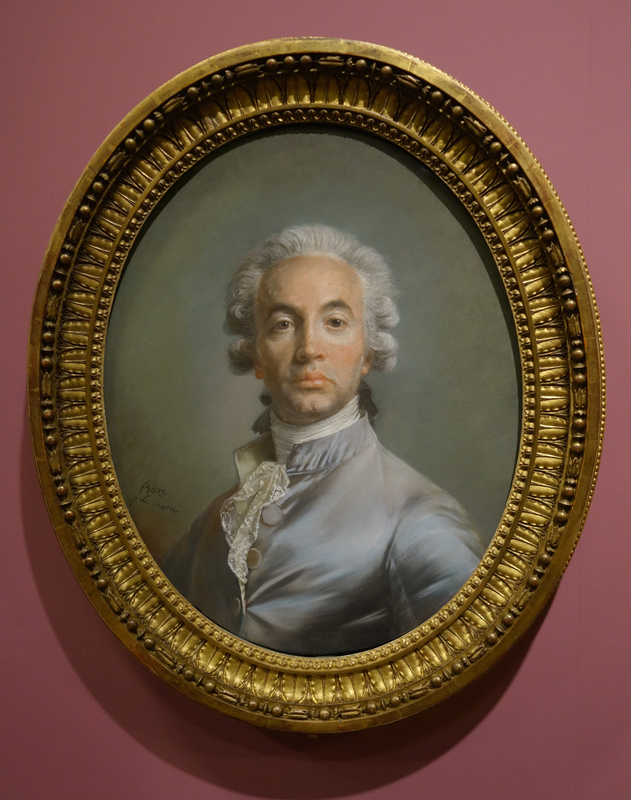 Thus La Tour seems to have behaved like Liotard, with the extension probably added for visual reasons. J.46.2431. 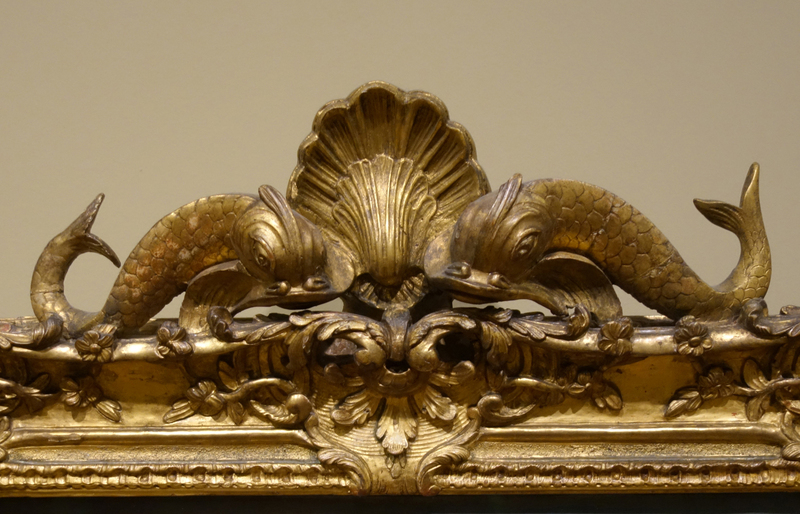 While the best frames were carved and gilded, there were some surprisingly early (but excellent) examples of stuc doré, or composition frames. Several frames, including this one, bear a stamp, ‘Ornements de composition D.L’. XS vouchsafes no suggestion for the maker; but it seems likely to be (as Bruno Hochart suggests) the ‘Sieur De Launay, quai de Gesvres’, recommended by Petit de Bachaumont for his composition frames at this time. The question is discussed Pons 1987 p. 42, of which there is an illustrated translation here. J.46.2015. The standard model, widely repeated in the Louvre, and found, for example, on cat. no. 32 (Mme Boze). 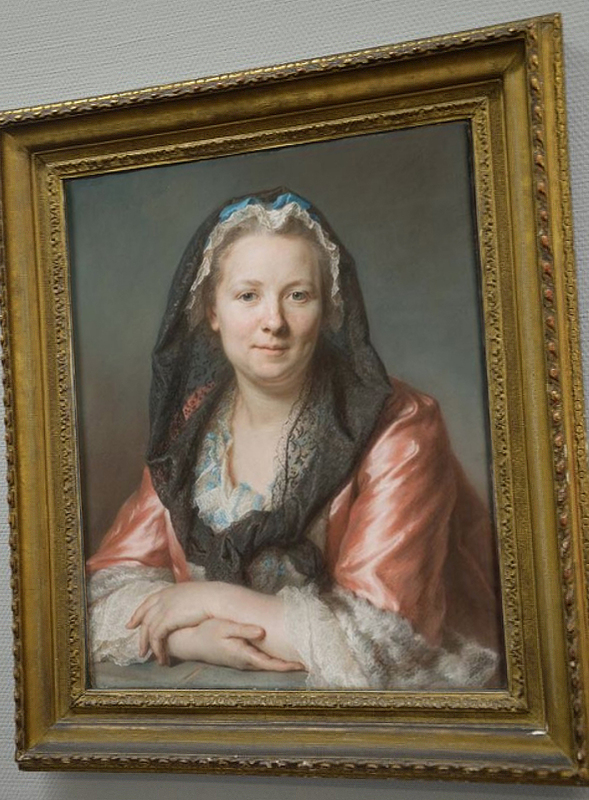 However, it is not scaled down directly: the top edge with the running piastres is wider and the flat frieze narrower than in the frame of Mme Boze. 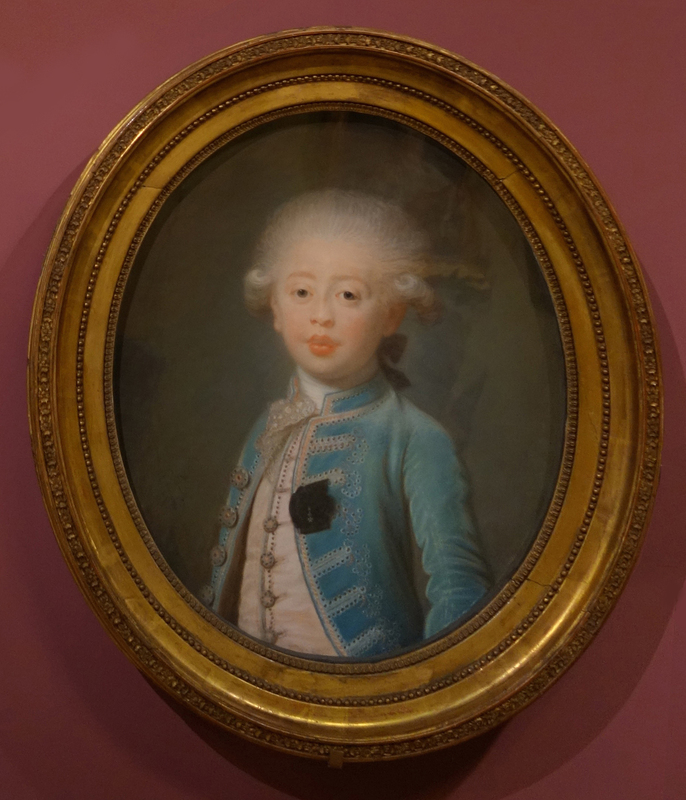 It is difficult to imagine a more quintessential ‘pastel frame’ than this, and the immediate assumption is that it must be the cadre d’origine. But the 1919 photograph shows it in a different frame – or at least one with an elaborate fronton, similar to the Lundbergs, cat. nos 103/104 (it is possible that the fronton was detached, but there is no evidence of its removal, albeit the pastel was hung too high for close inspection). This is a pity in view of the gap in the early provenance of the pastel. J.46.2089/J.46.2269/J.46.2126/J.46.2242. 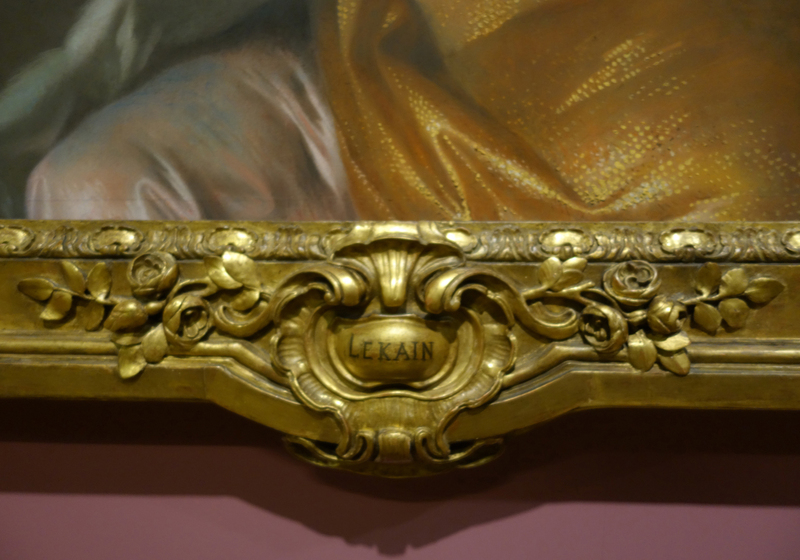 In XS’s Louvre lecture (YouTube, at 46 mins 30 secs in) it is stated that the frames for the king and queen were made by Louis Maurisan, and his receipt for frames for pastels of these subjects is mentioned on p.164 of the catalogue. 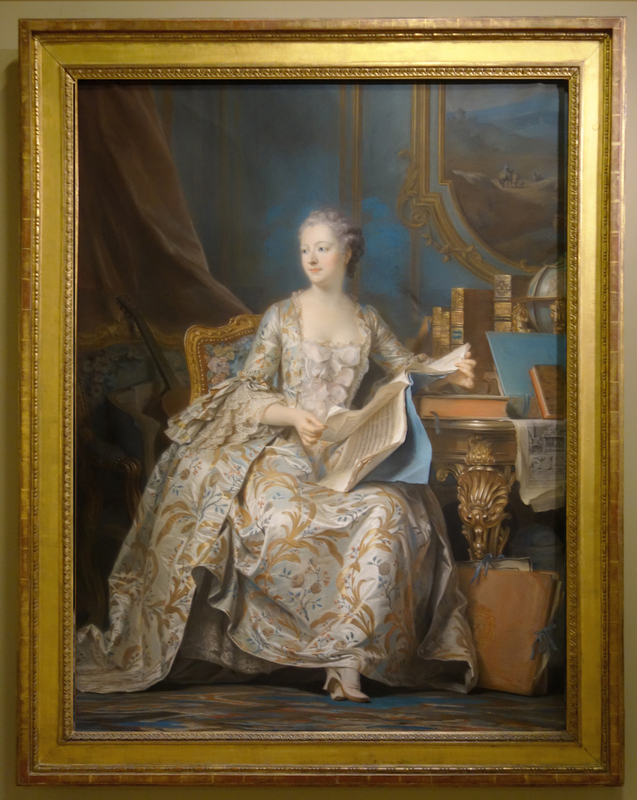 But according to Bruno Pons , only that of the queen could correspond with the works in the Louvre: the 1748 invoice covered works by La Tour and Nattier, ‘dont un par M. La Tour’ [my emphasis] (‘of which one is by M. La Tour’). Indeed the entremilieux of the frames [i.e. 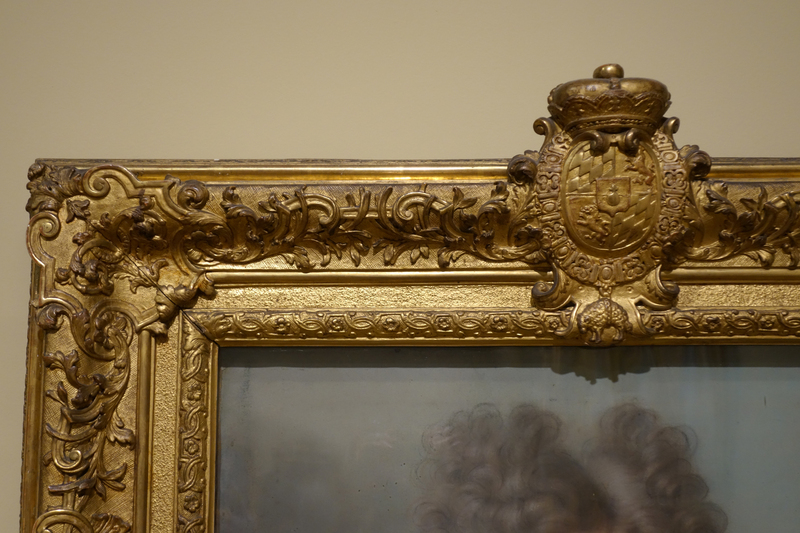 the reposes between centres & corners] for the king and dauphin were ‘d’un losange et entrelas et de bandes très délicatement travaillé’ ( ‘very delicately worked with diapering, interlace and strapwork’), which are not found on the Louvre frames. The intricacies of these royal commissions, and how the records tie up with the surviving pastels, would occupy a far longer post than this. 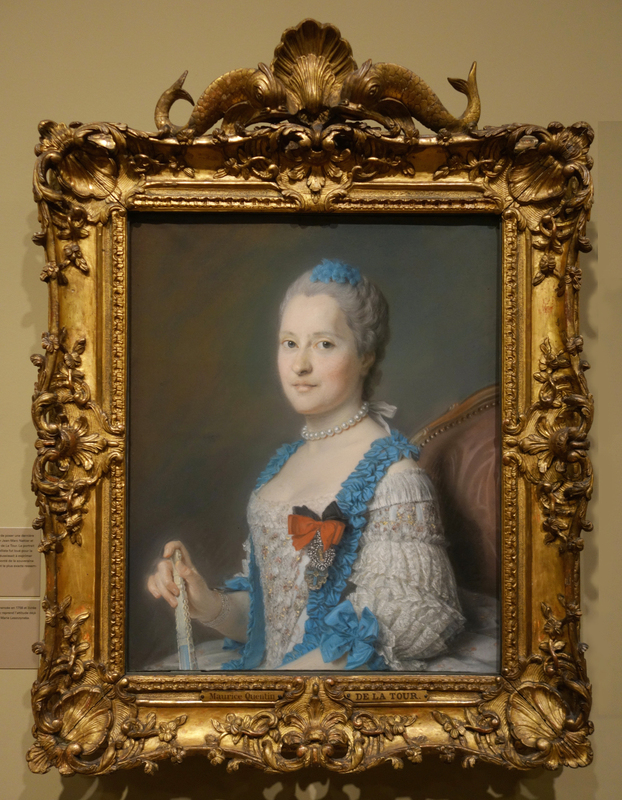 For example, we know that in 1749 Louis Maurisan delivered a ‘bordure en tilleul’ (‘a limewood frame’) for La Tour’s portrait of Marie-Josèphe de Saxe, dauphine. That might well be the earlier model now in Dresden [and in a Dresden gallery frame]. 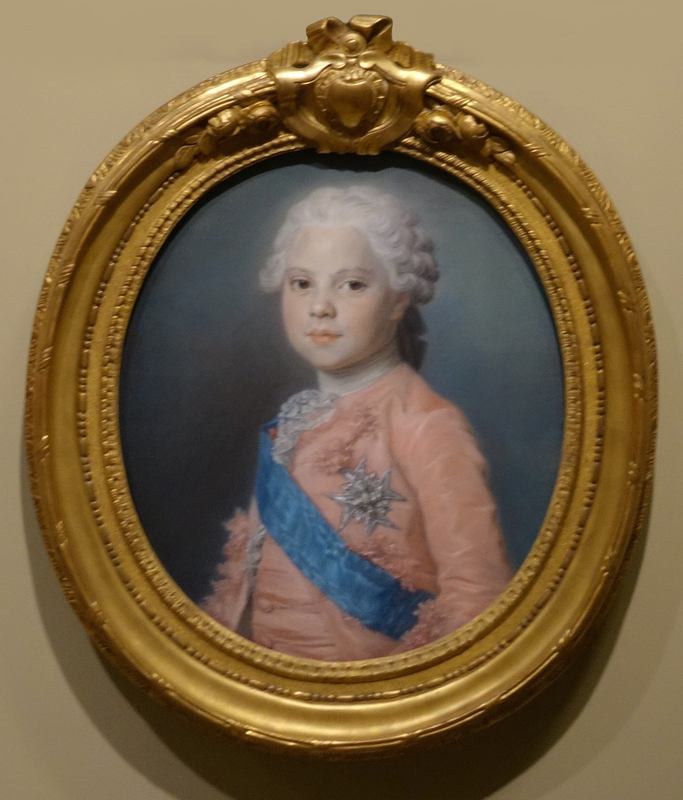 In Louis-Jacques Durameau’s inventory of works at Versailles, only nine pastels are included in the rooms the displays of which are illustrated: they are all by La Tour, and all of the royal family. 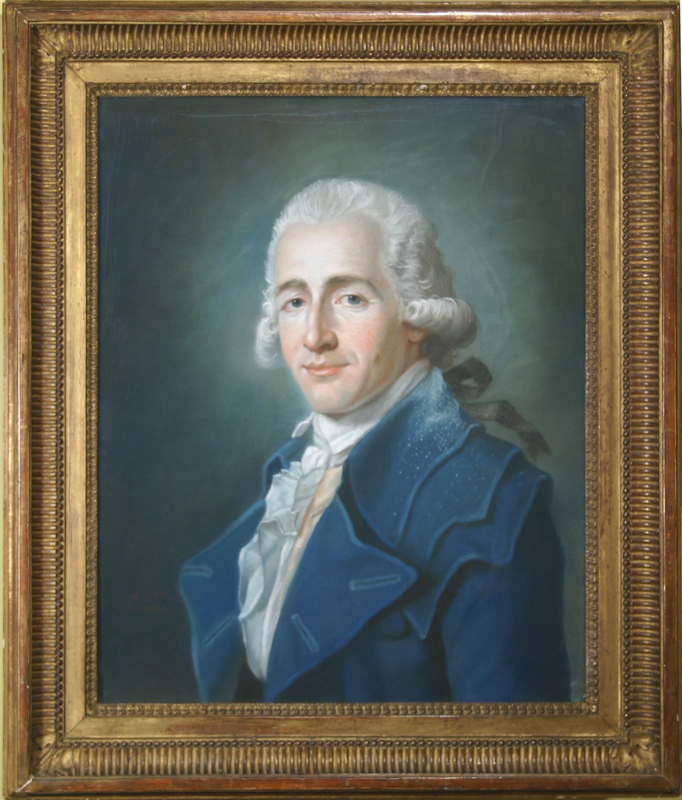 One notes that Durameau’s drawing fairly carefully indicates a gradation in the sizes of the frames of the La Tour pastels along the lowest tier. From this it does not seem that all four of the present Louvre pastels can correspond. There is a confusion about some of the versions of the pendants of Louis XV and Marie Leszczyńska which I have discussed elsewhere. 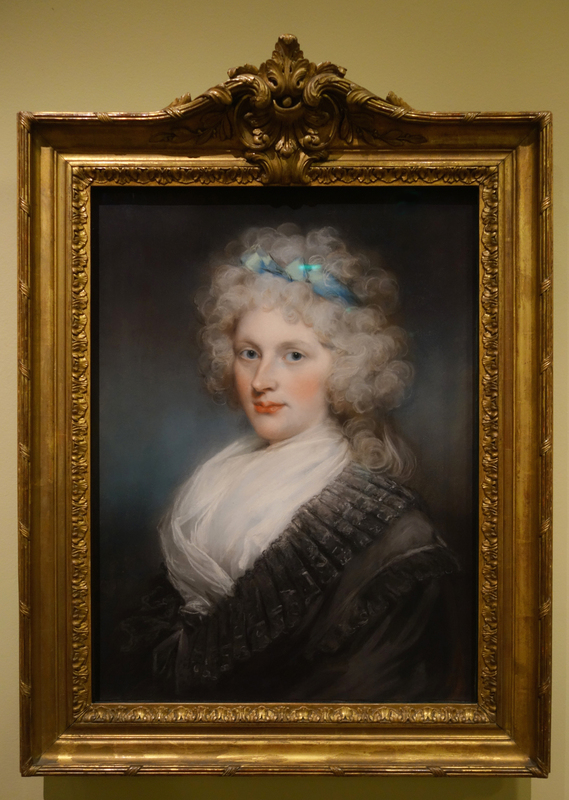 Suffice it to say that there appear to be two further sets of both pastels, presumably studio copies, supplied in identical frames – each with a pendant in a frame that doesn’t match. The trouble taken to copy each of the two different frames seems significant. One speculates if they might even be among the copies recorded by Durameau in the magazin at Versailles in 1784. 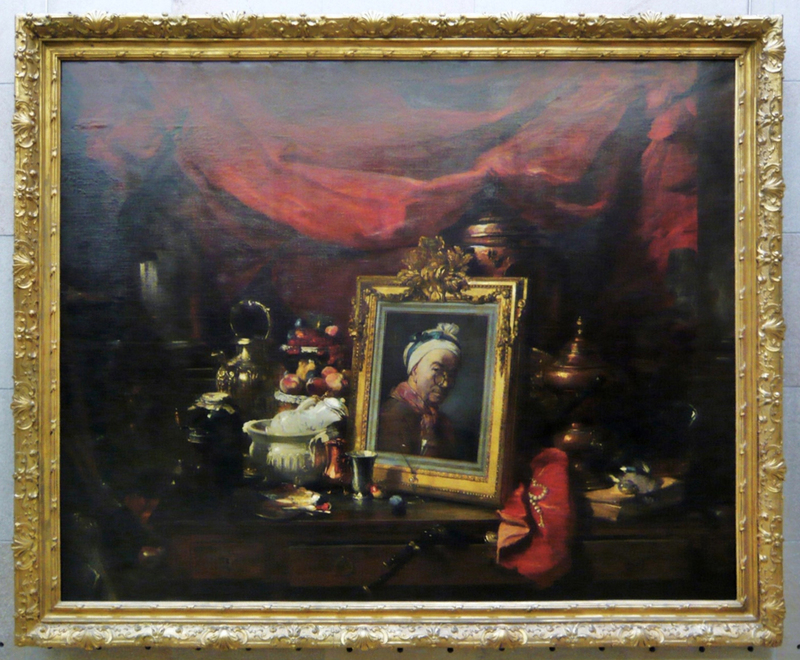 The more important of these are those supplied (presumably as diplomatic gifts) to Graf Brühl – apparently the one photographed in Schloß Seifersdorf in 1904 (above). 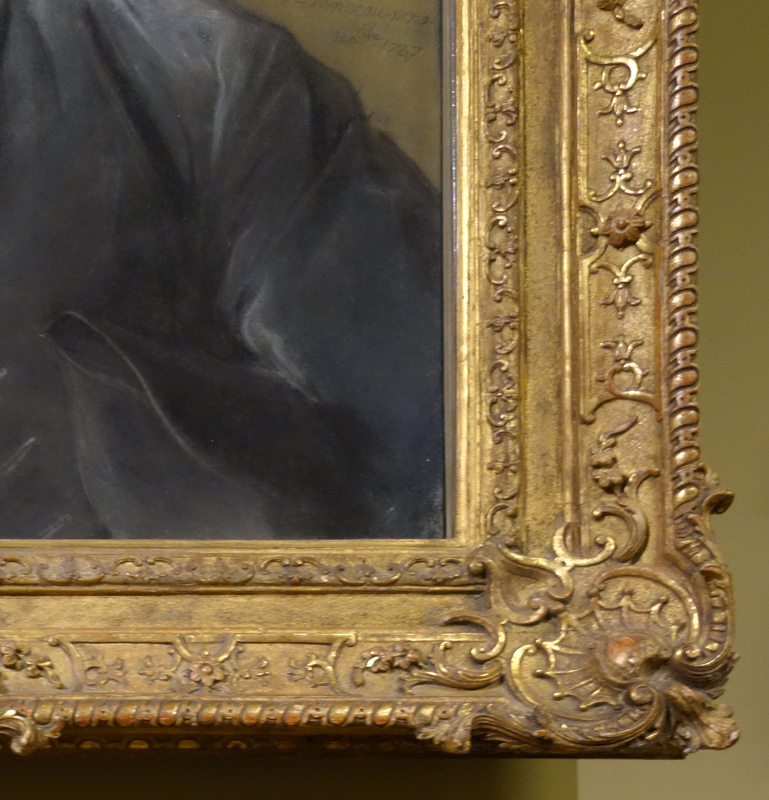 Given Brühl’s importance in the Saxon court, this and its pendant have some interest: all the more so because the frame, which is just barely visible in the photo (and which I originally mistook for a Dresden frame), appears also to copy the Louvre frame for Marie Leszczyńska . J.46.2541. For the present frame, see the introduction to this article. 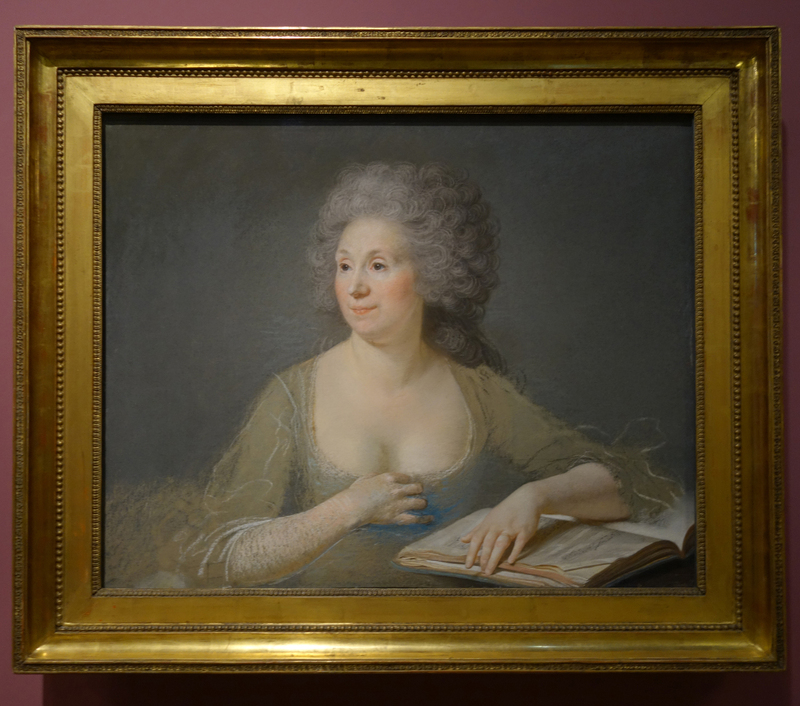 in Mme de Pompadour’s posthumous inventory, but with necessary reservations – it is inherently unlikely in view of the weight of the original sheet (evidently present in 1755 and 1803 on, until c.1942) that this pastel could be under glass without a frame. 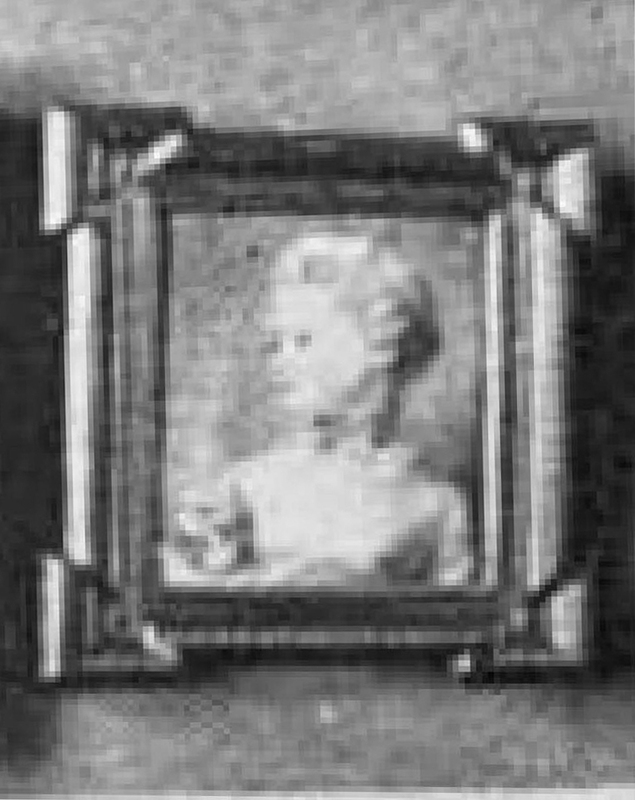 ‘un Tableau peint sous glace representant la ditte dame de Pompadour [dans] sa bordure’ (‘….the said Mme de Pompadour [in] its frame’). This removes the obstacle to recognising this jewel in the collection of the Louvre as having belonged to the marquise herself. 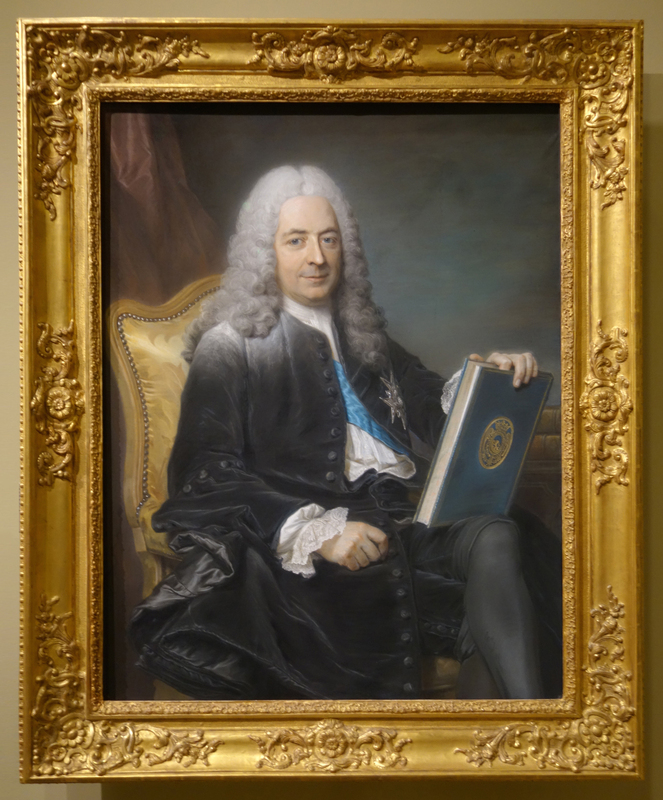 ‘dans l’appartement où est décédé ledit sieur d’Alembert, le portrait du deffunt sieur d’Alembert dans son cadre doré’ (‘… in the apartment where the said Sieur d’Alembert died, the portrait of the late Sieur d’Alembert in its giltwood frame’). Thus the frame itself is part of history. 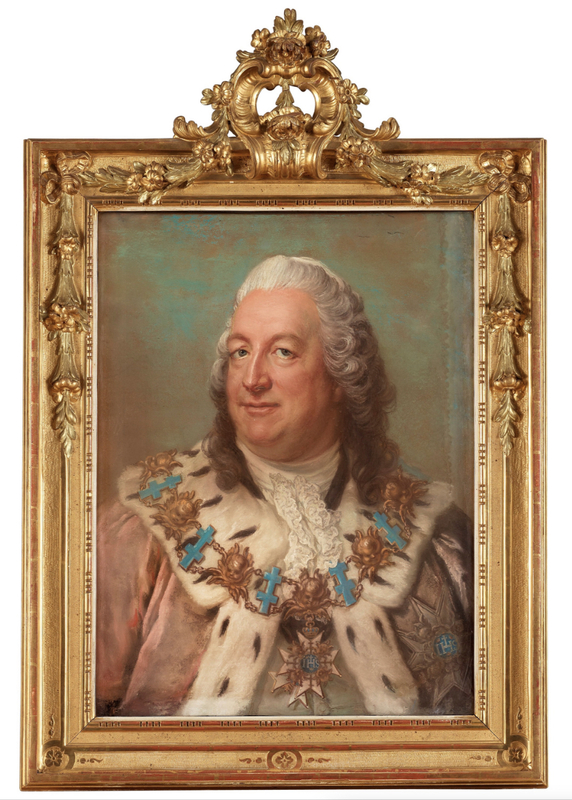 One knows this pastel so well that it is difficult to see it in any other frame than the sparely elegant Louis XV swept frame which is so appropriate. 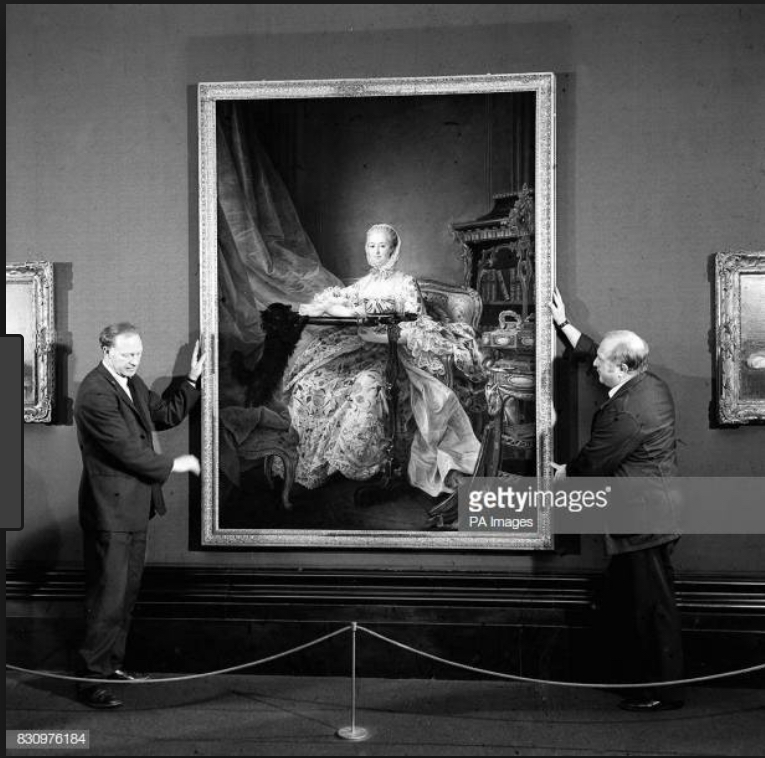 But it was not the frame it had in 1919, when it was photographed shortly after its acquisition from the descendants of the marquis de Condorcet. J.46.1436. The curious blank plaque is unexplained, and rather too heavy. 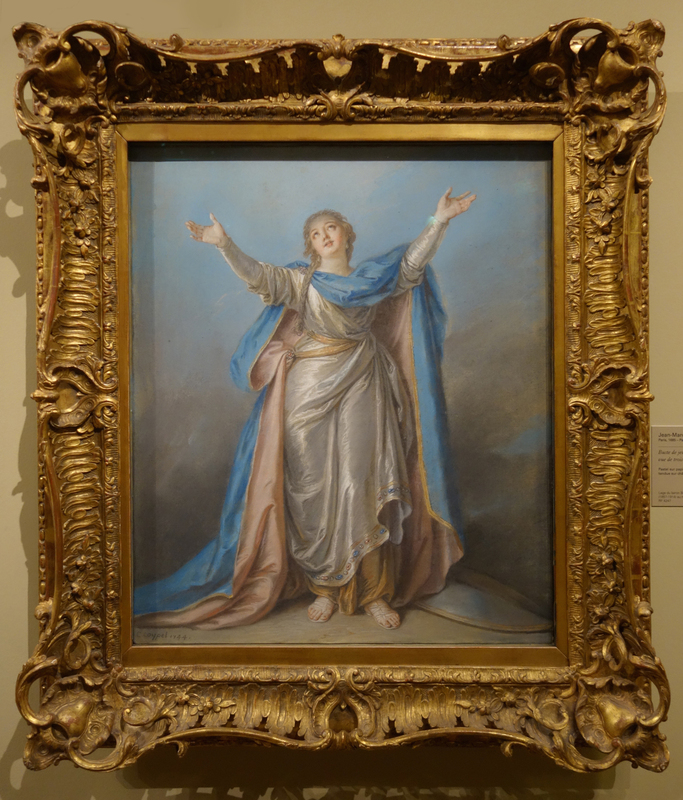 It seems unlikely it was exhibited thus in 1761 (Saint-Aubin’s sketch does not show the fronton, although his borders are probably not attempts to represent frames); but such a presentation frame might have been appropriate when it was given to the Académie in 1774 and hung in the Académie six months later (procès-verbaux, reported in XS) – to which we can add that Dezallier d’Argenville (1781, p. 46) recorded it hanging in the salle des portraits. J.46.2624. No doubt the oval on the left in Durameau’s image. See also cat. no. 138 (Louis Vigée’s Anne Racine) below. J.46.162. Curiously XS makes no mention of the recent long and fascinating report by Pascal Labreuche on his inspection of the work (unpublished; Louvre documentation), which analyses in detail the strainer, canvas etc. – made from inferior materials – but not unfortunately the frame, which is of similarly modest appearance, the gilding a little too bright for my eye. J.478.182. 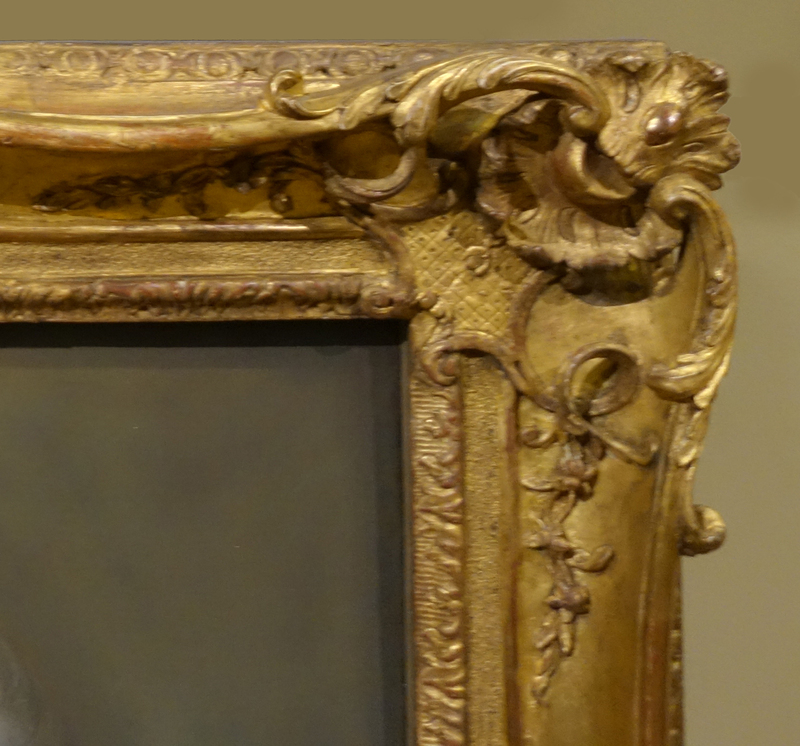 An imposing fronton frame, nicely restored by the Louvre (opened mitres, extensive gilt losses on acquisition). The various versions of the pastel itself present curious questions of dating. In the 1779 oil (now in the Comédie-Française), a rather larger version is given a much thinner baguette. I think I’d prefer something in between for the pastel, and the boldness of the fronton seems to conflict with the rather twee roses that emerge from it, almost heedless of the plot of Voltaire’s play and of Lekain’s best attempt at anger. J.49.234. 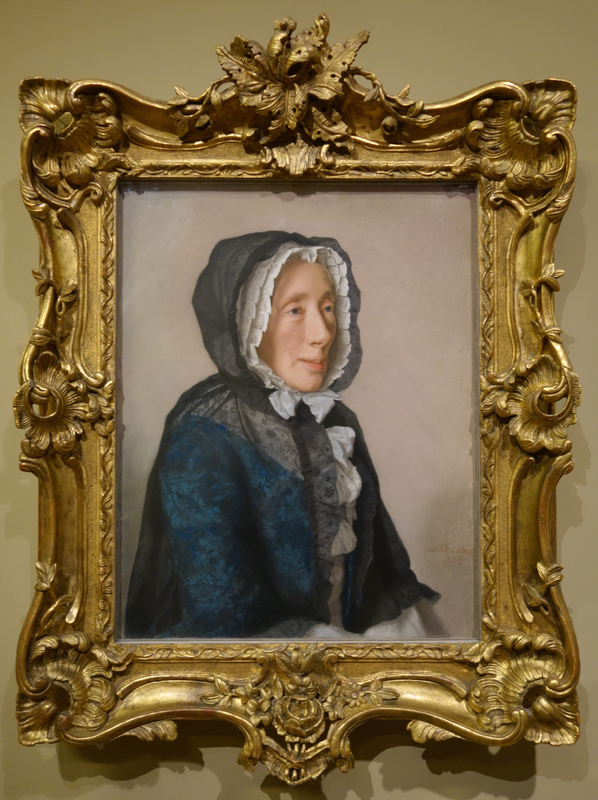 The magnificent frame is surely original, as it is one of a number of similar frames made for Liotard in Geneva, and discussed previously in a review of the Liotard exhibition at the Royal Academy (2016). 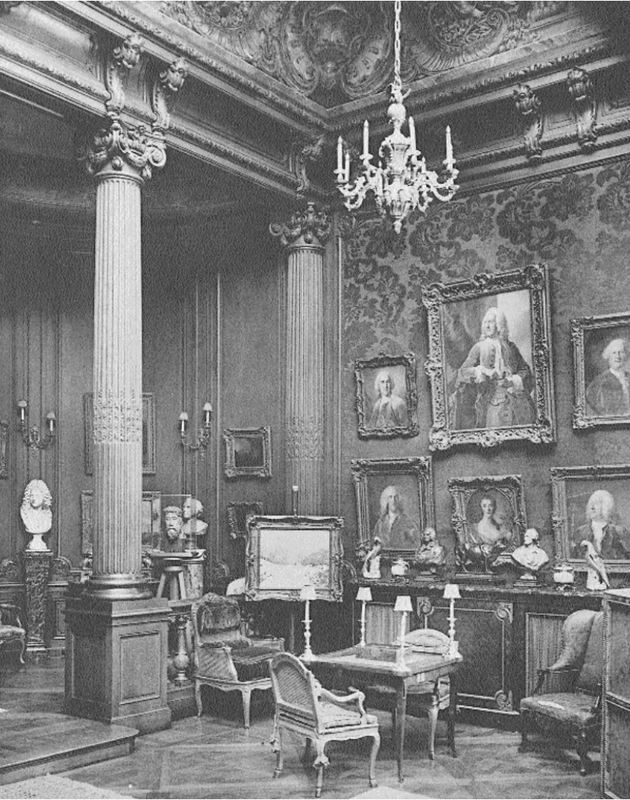 It is clearly visible in this photograph of the Liotard exhibition in the palais de l’Athénée in Geneva in 1886, along with some other examples. 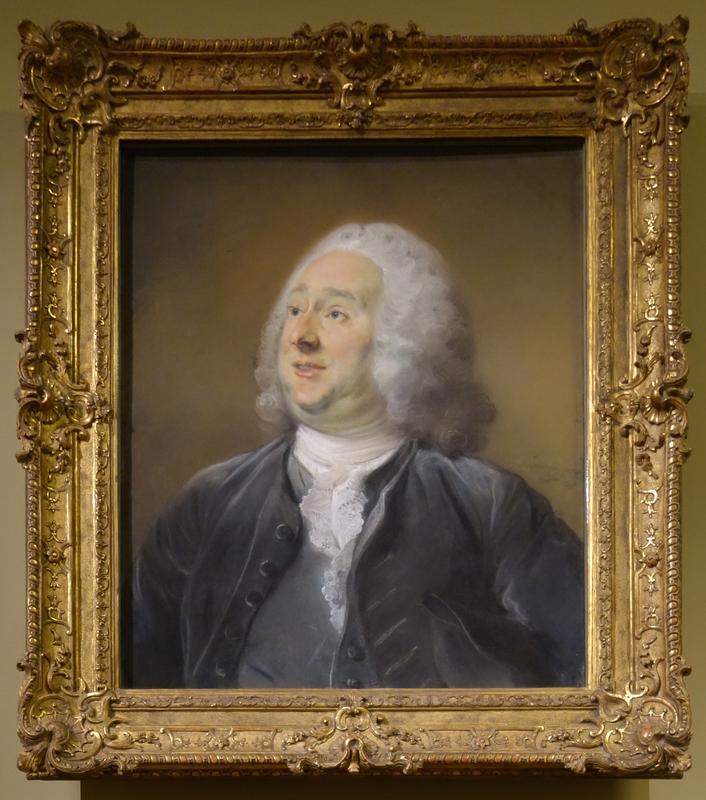 Somewhat amusingly, you may spot an interloper – the version of La Tour’s autoportrait (quite a bit earlier than the Louvre’s Neilson version, cat. no. 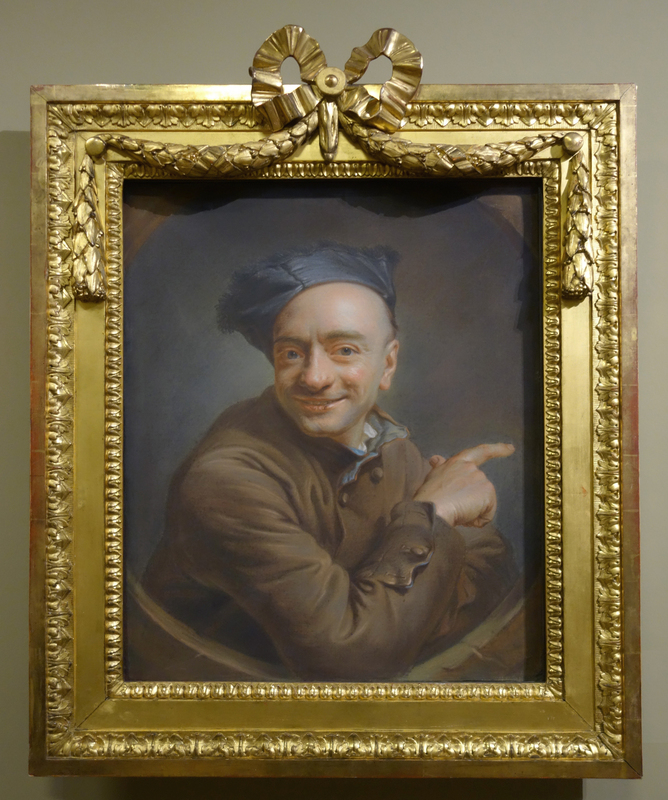 78) was then thought to be by Liotard. You can see it hanging in a plain baguette, on the left in the upper tier. It has of course subsequently been reframed, as this more recent image shows. J.503.1518/J.503.1091. 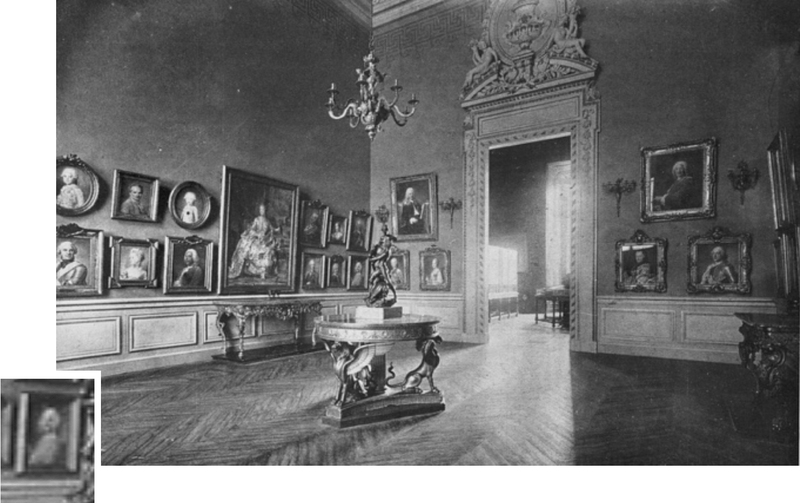 No doubt the original frames with their frontons for the Académie, visible in the 1919 photograph (in the far corner of the left-hand wall, in the upper tier). J.503.172. Rather an impressive fronton frame which, as XS points out, was made in Sweden c.1770. There is an exactly matching frame on Greve Mattias von Hermansson (J.503.1353), the main difference being in the higher level of burnishing normally seen in Swedish frames. This would have been thought tasteless in France, and the Vergennes frame may have been toned down. More recently there has been an excellent repair to the broken C-scrolls and rose stem projecting perilously out from the top of the latter. J.582.1393. The recent intervention with Perronneau’s Mlle Huquier raised some tricky questions. It formerly had an elaborate spandrel with curved corners which neatly concealed the tear in the lower left corner. That has now been removed and replaced by a bright straight-edged slip which serves only to reveal that the frame never fitted. Nor is it the one visible in the photograph of the salle des pastels of 1919 – although I doubt very much if that was the original either. The tear, and cosmetic spandrels, were evidently introduced before 1971 when Virgina and Lee Adair reproduced the clipped format. This is a case for reframing completely if we want to see the whole pastel and enjoy it as Perronneau originally intended. I don’t think the frame on the version sent soon after to Karlsruhe is quite right either (too late), but its simplicity is appealing. 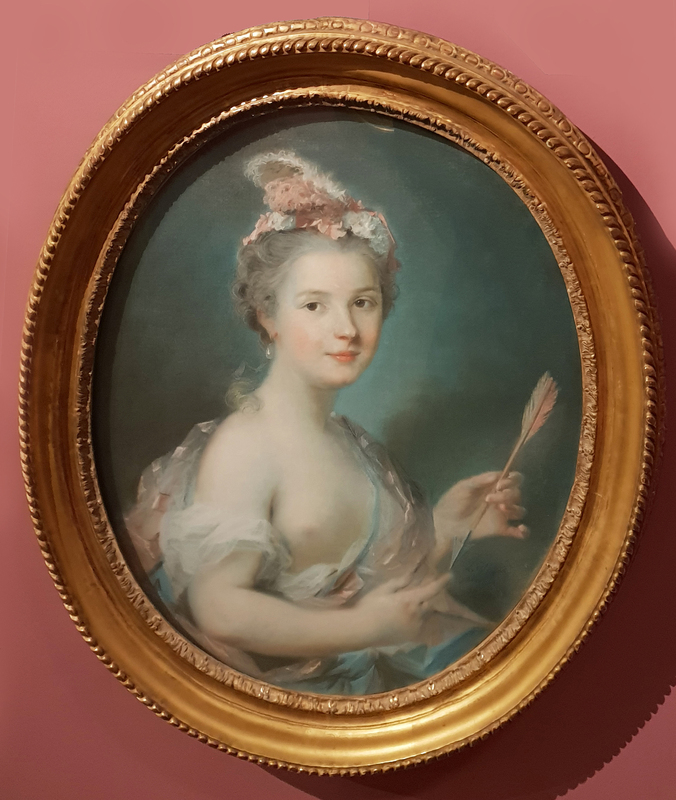 This 1753 pastel is shown today in an excellent Louis XV frame, with undercut corners and queues-de-cochon decoration, all looking just right. However, the 1919 photograph shows it in a completely different frame, matching that of the Maréchal de Saxe (cat. no. 87). It invites one to speculate that the 1919 frames for neither cat. no. 87 nor cat. no. 114 was original. Once again the 1919 photograph shows it in a completely different frame, possibly original and certainly far simpler than the elaborate frame it now occupies: an asymmetric rocaille frame laden with C-scrolls and vaguelettes. Lovely in its way, it feels somewhat wrong for the engraver with whose family Perronneau was close; one feels something more austere would have been appropriate. Gorgeous frame, but is it original? Two additions to the sides, only one of which is autograph, confirm that it is not. And it looks like a ‘dealer’s frame’. But the story is a little more complicated. There is a gap in the provenance between 1910 (when last seen with the family, as published by Louis Paraf) and 1927 (first noted with Mme Orosdi). 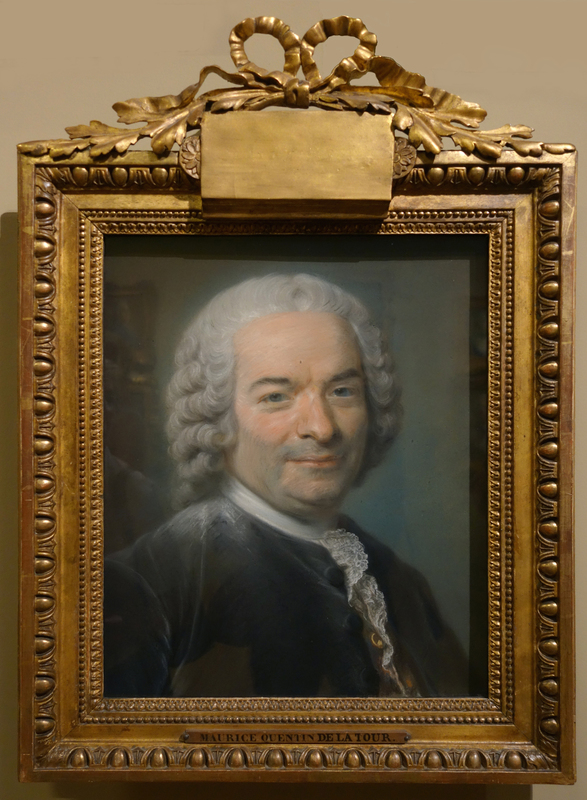 The Perronneau (1765) has a pendant, last seen in New York in 2011 (my recollection is that the frame, of which I don’t have an image, is a match) but known to have been with Galerie Wildenstein in 1924. (Louis Paraf was Georges Wildenstein’s brother-in-law.) 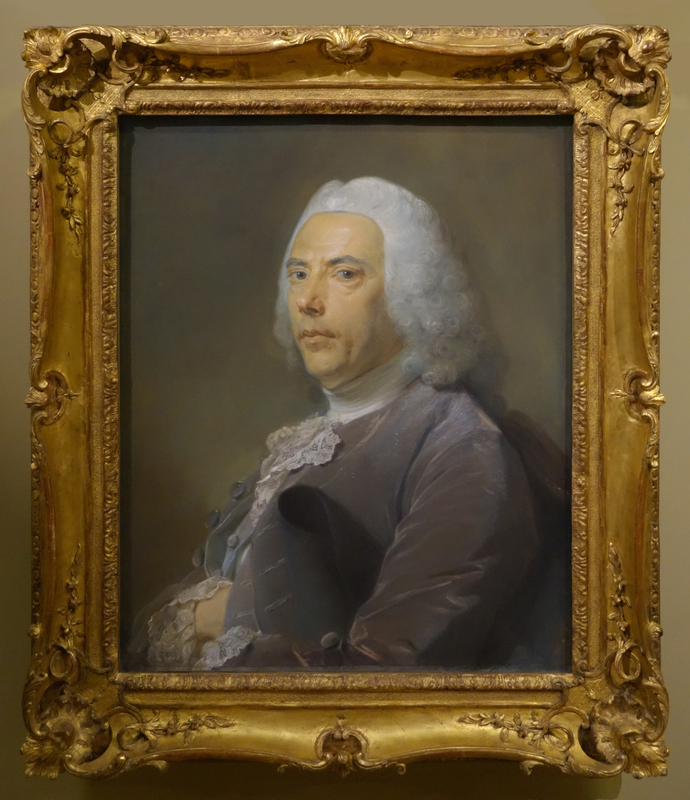 But the frame is an almost exact match with the frame on a Greuze painting, Citoyen Bernard Dubard (dated 1799, thirty-four years and a Revolution later than the Perronneau) supplied to the Fine Arts Museum of San Francisco in 1935 by Wildenstein, who had had the picture since 1913: the frame is reproduced, as probably original for the painting, in Mitchell & Roberts, Frameworks, 1996, fig. 225. 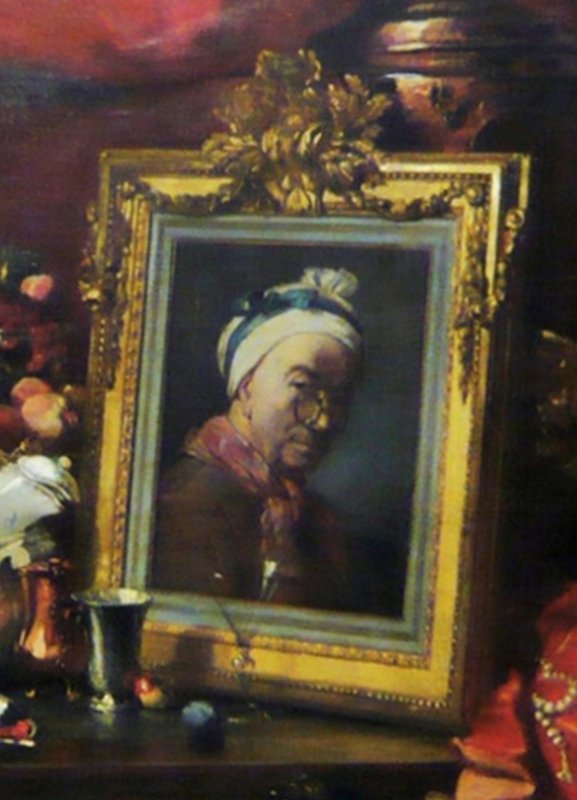 Magnificent frames (particularly that of Van Robais), both visible in the lower tier of portraits in the photograph of Doucet’s hôtel in the rue Spontini between 1909 and 1912, but unlikely to be original. 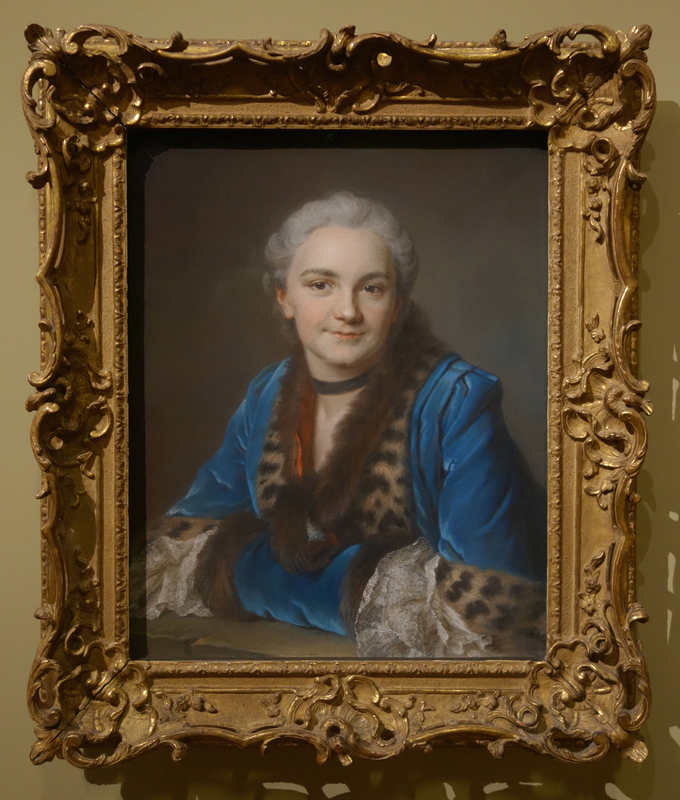 The Empire frame sitting on a pastel dated 1765, a model much favoured in the Louvre, is a variant of the model for Mme Boze (cat. no. 32), adapted like the Vivien artiste (cat. no. 15), but with alternating palmette and honeysuckle ornament confirming an early 19th century date. J.63.142. Valérie Luquet has kindly pointed out  that the frame bears the stamp ‘E L INFROIT’ with that of the jurande des menuisiers-ébénistes, ‘JME’, the committee of guild members who assured quality. It is curious that of all two dozen known framemakers, Infroit’s and Levert’s stamps appear far more frequently than those of the others . 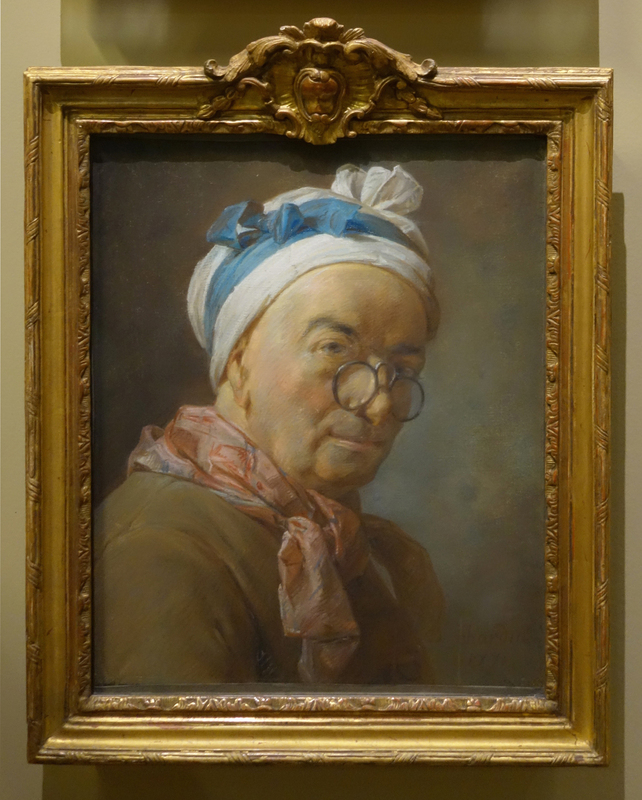 Étienne-Louis Infroit’s case is particularly interesting, as he was ‘interdit pour cause de faiblesse d’esprit en 1771’ (‘interdicted for feeble-mindedness in 1771’): the charges brought by his wife involved drunkenness and violence against her rather than imbecility, but sadly the inventaire taken at the time (which would have been an invaluable insight into the mechanics of the business) has been mislaid in the Minutier central (2018). 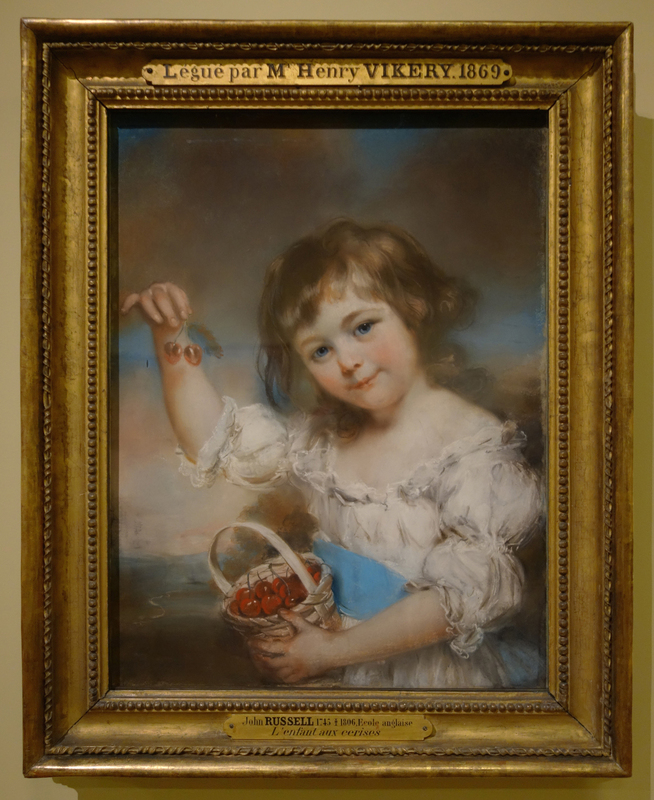 However, we know that the firm (carried on by his wife and sons) was still using his stamp ten years later – for example, on a pastel by Mlle Capet in an identical moulding. 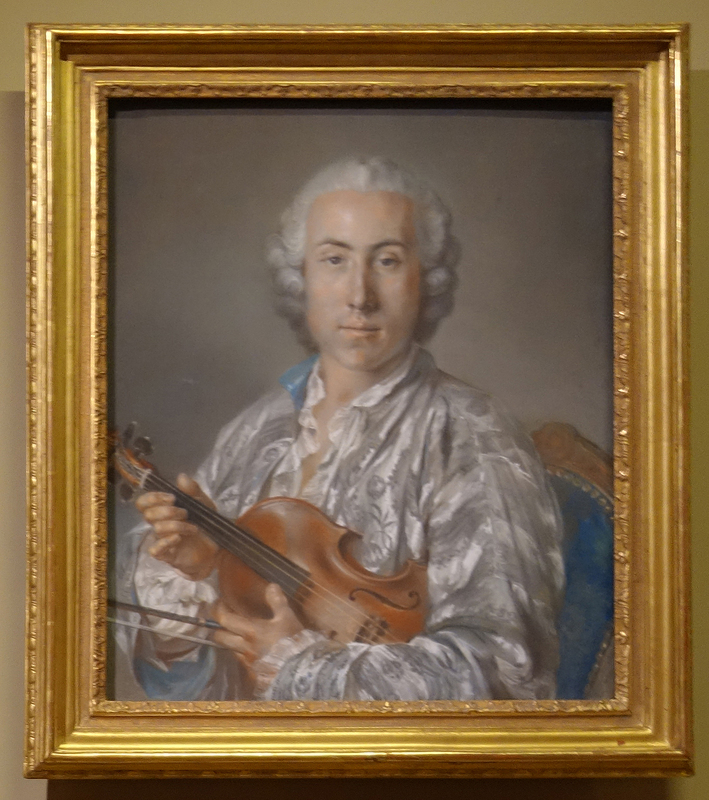 A third example, again identical, was in the Georges Bac collection (Le Cadre et le bois doré à travers les siècles, 1991, p. 100): unlike Levert, who produced a wide variety of frames, Infroit seems to have specialised in this moulding. 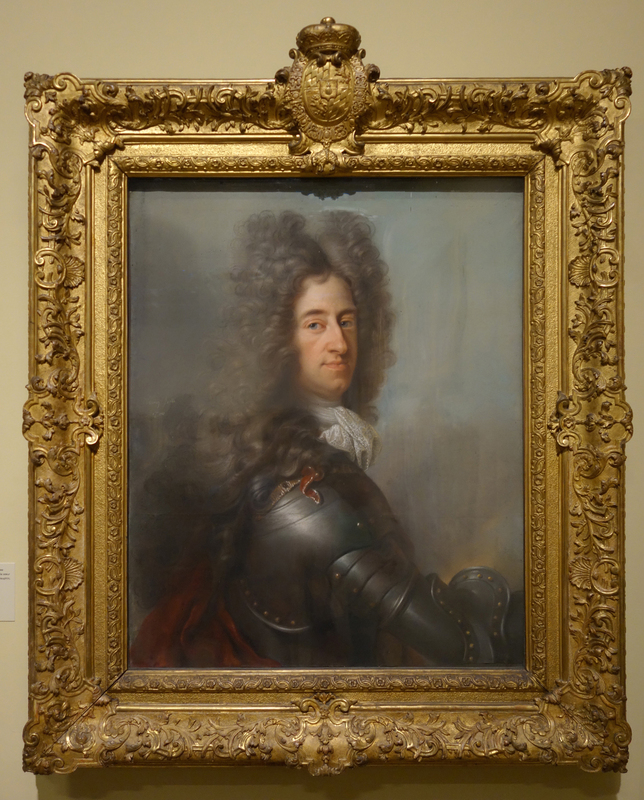 However, the rather odd trophy frame for the unattributable oil portrait en pied of the maréchal-duc de Richelieu, reproduced in XS (fig. 77) as stamped ‘Infroit’, is elsewhere reported as stamped ‘C. E. Infroit’, perhaps for Claude, one of Étienne-Louis Infroit’s sons, or another member of this extended dynasty of menuisiers . J.64.172/J.64.1863. Both in absolutely typical Russell ‘Maratta’ frames, surely original; Mrs Jeans particularly splendid. J.64.114. I don’t know why the Bartolozzi is in a ‘Kent’ frame, a style that went out of fashion in England when Russell was born (perhaps this is less obvious to a French audience). J.64.006. 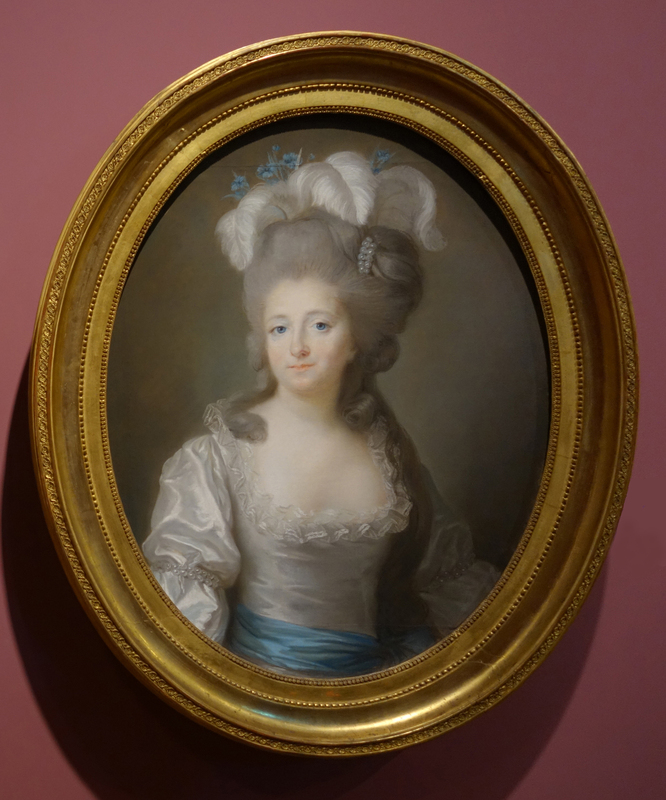 Here, the French fronton frame is a clue to the unsatisfactory provenance for this pastel, the authenticity of which I question, for the reasons set out in my blog. J.6924.139/J.6924.117. 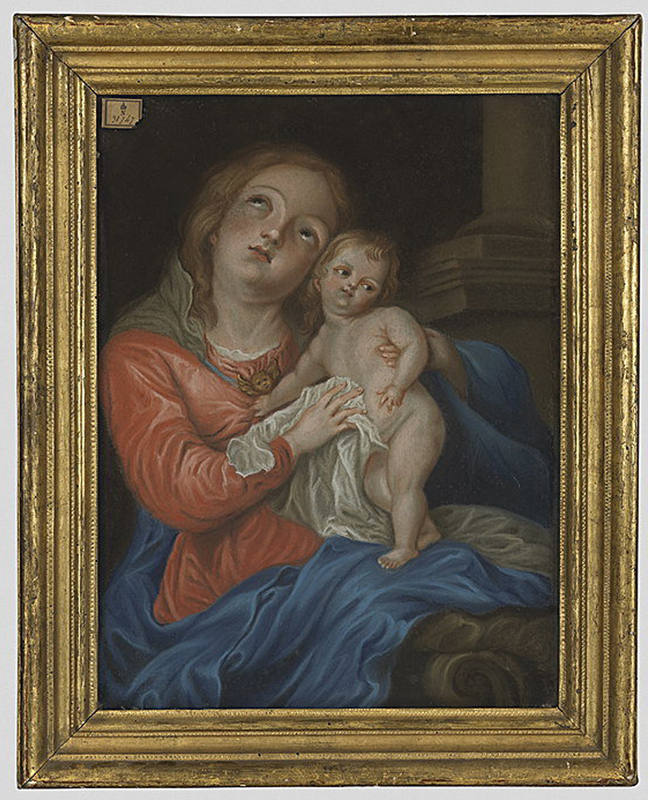 XS argues that the giltwood frame of the Virgin & Child is the cadre d’origine (the ‘cadre doré’ in the posthumous inventory of the artist’s daughter) because the right hand edge of the paper (where Stanisław had tested his crayons) has been folded over to fit into the frame; perhaps it is thought unlikely that such a border would have been retained had the work been reframed later. In any case the moulding seems of the period. 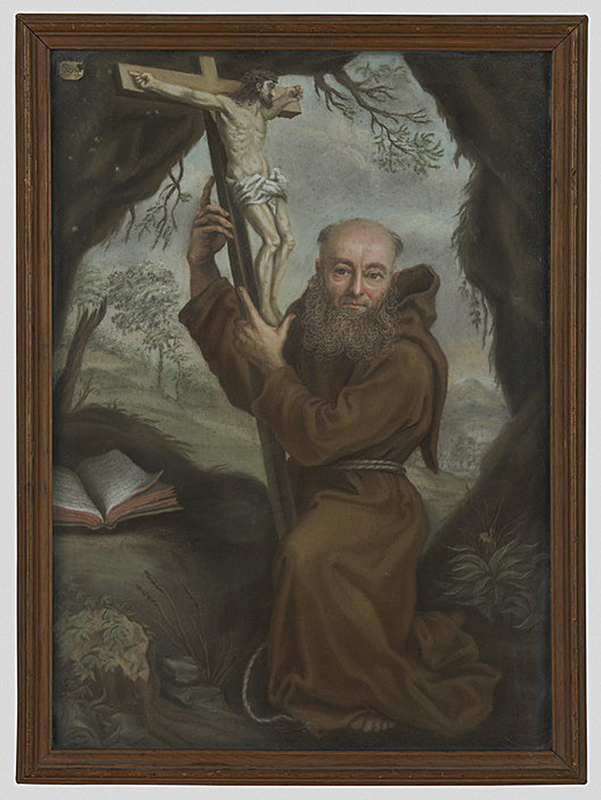 It contrasts with the rather plain, ungilded frame of a monk, also from the queen’s collection. J.758.305. It is rare to see Vigée working in oval. This example, from 1745, perhaps explains why. Louis XIV ‘ovals’ were somewhat fatter than the geometrical conic section, but when the shape returned to favour, an exact oval was sought, and presumably guided more precisely than the craftsman who gave Racine’s granddaughter this rather irregular bordure. La Tour’s Comte de Provence, made in 1762 (cat. no. 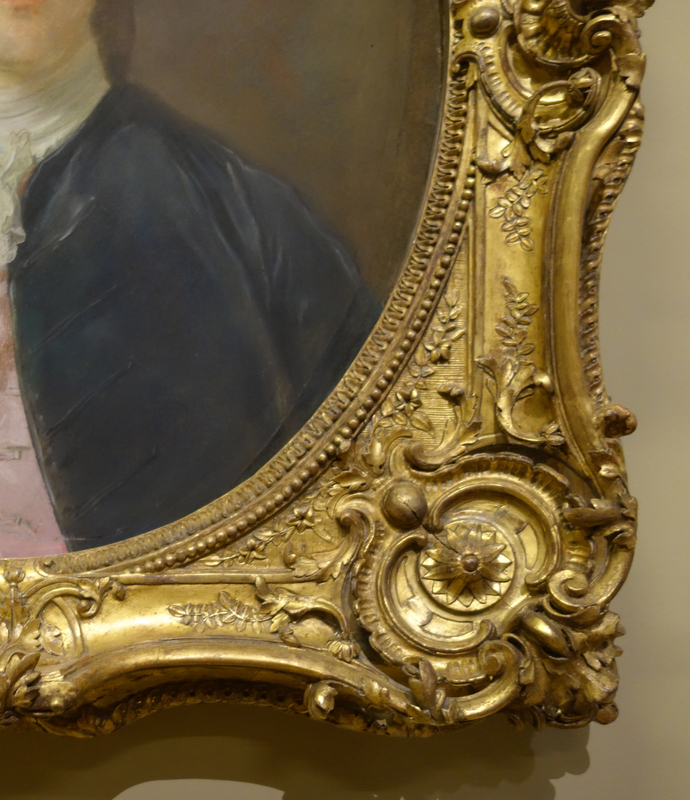 96), is the next earliest oval in the exhibition, the others all dating from the 1780s or later: a surprise perhaps, and a disappointment, given the exquisite refinement of the French Rococo oval frame, its prevalence and the difficulties of manufacture, all of which demonstrate the pressure of the aesthetic which demanded them. J.76.318 & J.76.306. 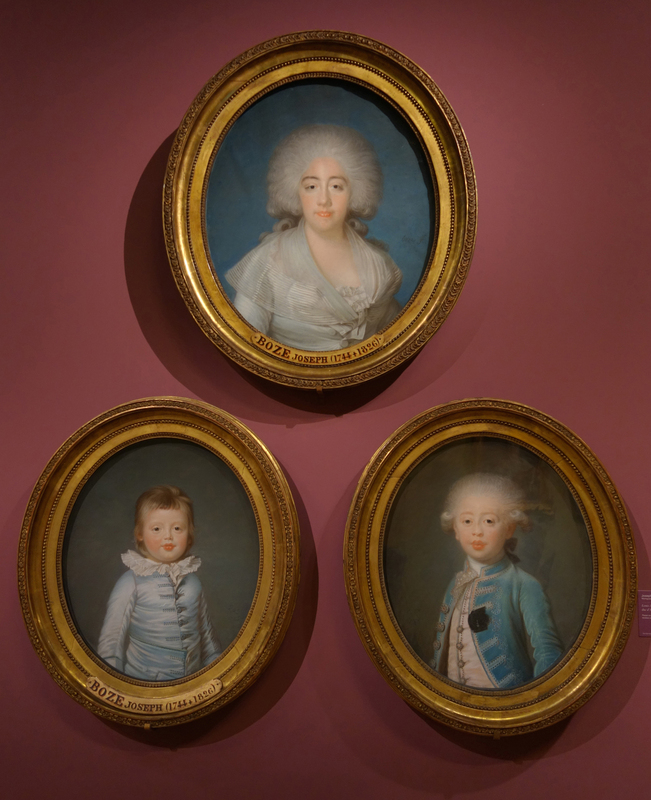 I have discussed the provenance of these in my blog and in my essay on Vigée Le Brun’s pastel frames for The Frame Blog. A brief recap: a key link in my research was the candle marks that had burnt the frames in a specific spot (still visible when the works appeared for auction in 2014), and were just visible in an old photograph of the château de Léran. They have now been beautifully restored in the Louvre, but it would be nice to document the evidence. It illustrates once again the contribution images of frames can make to forensic art history, and how restrictive museum policies of reproducing pictures without frames can be. although the ‘idem’ in the description may mean that the others were the same. J.9.8262. 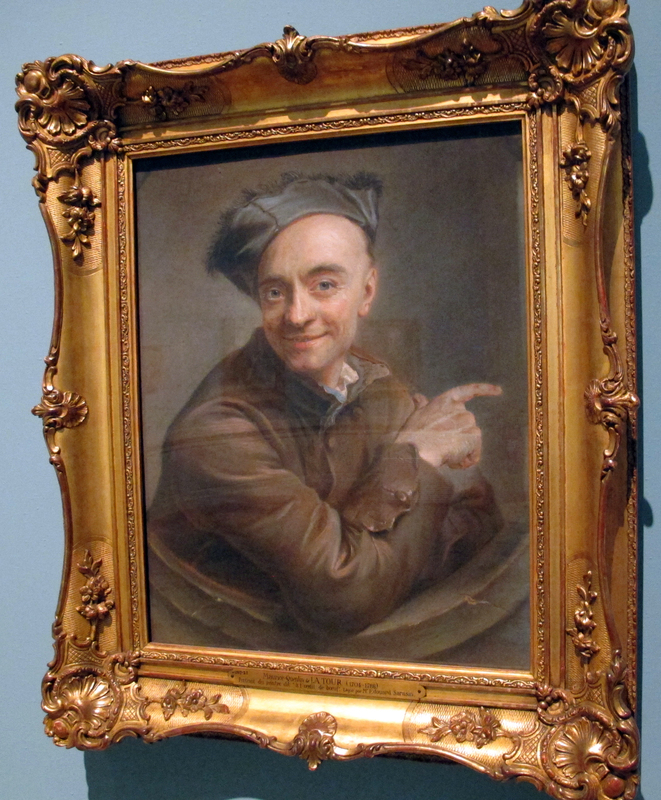 In his lecture, in a passage on frames and cadres d’origine, XS suggests that the frame is based on an Oppenord design from c.1700.But the awkward card slip suggests that this is not original for this pastel. With grateful thanks to Louise Delbarre for the photographs of the pastel exhibition, nearly all of which she generously provided. In the article on ‘cadres’ in his ever-delightful Dictionnaire amoureux du Louvre, 2007, pp. 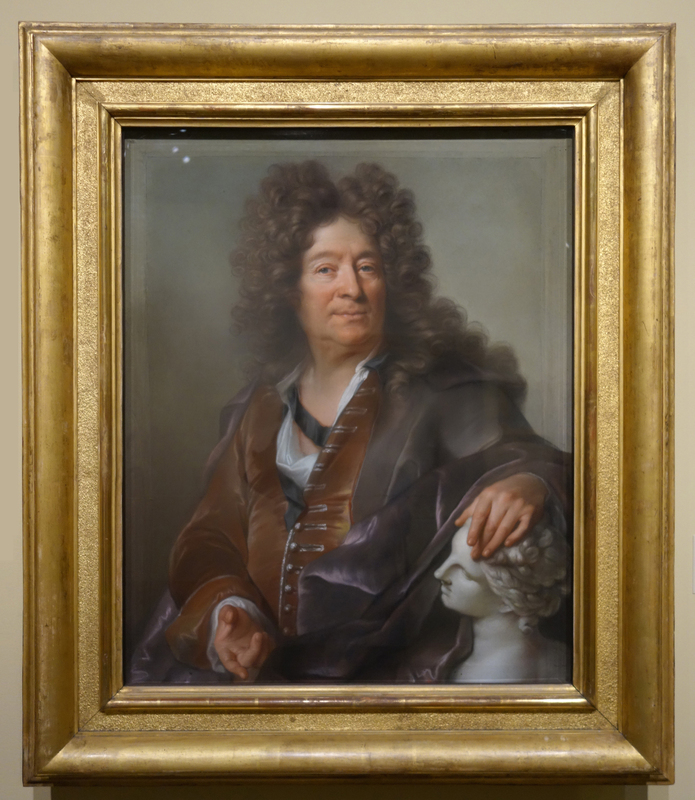 169 f, Pierre Rosenberg nominates those for the Carraccci pendants La Pêche and La Chasse (both discussed in a review of the Louvre frame exhibtion), with Rigaud’s Louis XIV the runner-up. He bemoans, of cadres d’origines in the paintings department at the Louvre, that ‘il y en a fort peu. Le temps, les changements de goût les ont fait disparaître’ (‘…there are very few of them. Time and changes in taste have caused their disappearance’). He notes too that in the past frames were cut down or adapted; standards today are different. In the September 2018 issue of Apollo. I reviewed the exhibition itself in an earlier post on my blog. 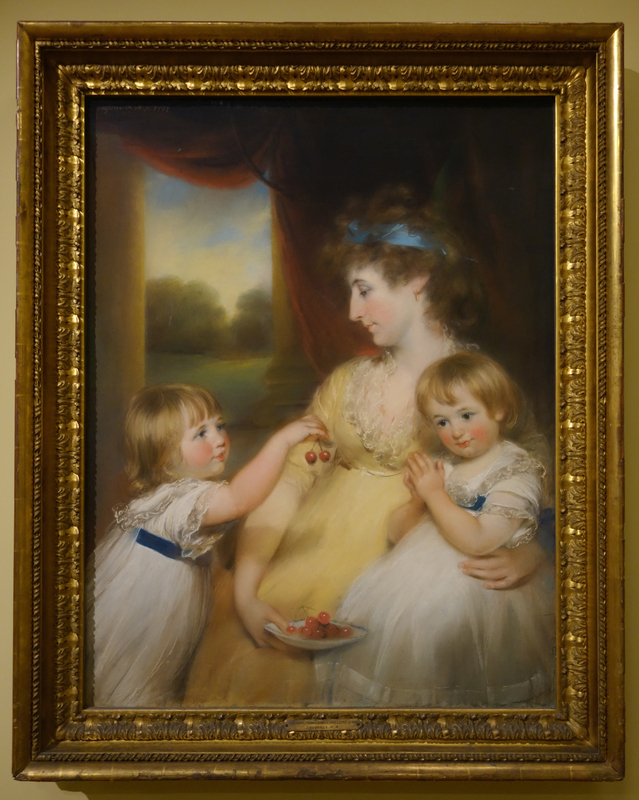 The literature on historic picture frames is vast, and well-known to readers of The Frame Blog. For specific reference to pastel frames, and much of the material summarized here, see my ‘Prolegomena’, especially §iv.16. 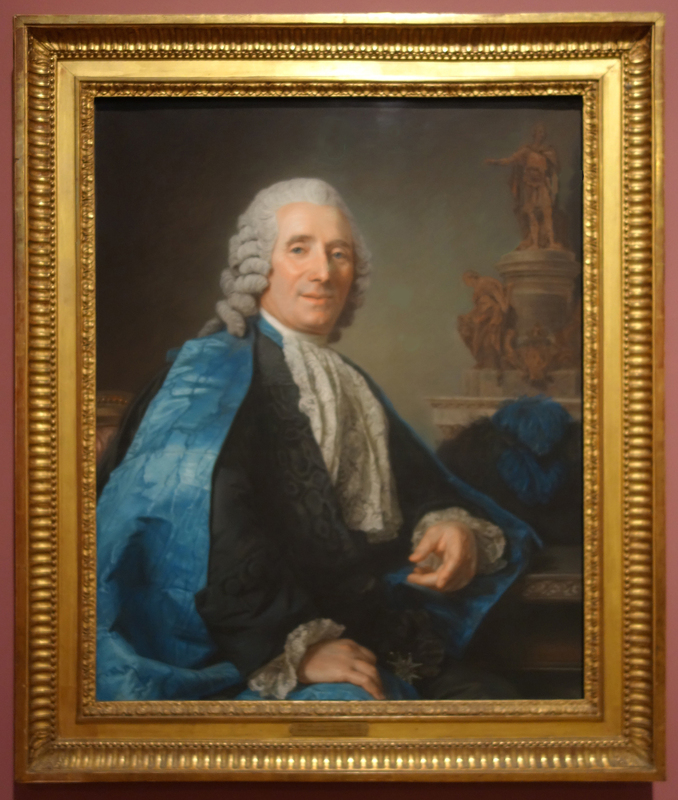 To the 22 listed in Harden 1998 may be added Jean-Baptiste Detroulleau (1737–1780) and Louis Boussard (Bruno Hochart, private communication, 8 March 2018). This may be because the businesses were not sufficiently profitable, and estates were renounced to avoid the assumption of debts. Such accounts as survive often provide very limited detail. We know for example that François-Charles Buteux (1722–1802) was owed arrears of 44,349 livres 2s. 11d. by the Bâtiments du roi in 1791 – but with no breakdown of the orders involved. Original spelling preserved. René Gimpel suggested it might be to a design by Caffiéri. The original glass survived until the 1970s when it was broken while being moved at the château de Pregny; it is said to have been signed by the glass maker, but no record of that name seems to have survived. Anon., Lettre à Monsieur de Poiresson-Chamarande, lieutenant général au baillage et siège présidial de Chaumont en Bassigny, au sujet des tableaux exposés au Salon du Louvre, s.l., s.d. .
 Observations sur l’histoire naturelle, sur la physique et sur la peinture, Paris, xiii, 1755, p. 58f; see ‘exhibitions 1751-75’ for the full text. The document was overlooked in the Collection Deloynes, McWilliam & al. 1991, B&W and Arnoult 2014, and first republished in the Dictionary in 2015 ; but it is not in XS. Anon. [abbé Jean-Bernard le blanc], Observations sur les ouvrages de MM. 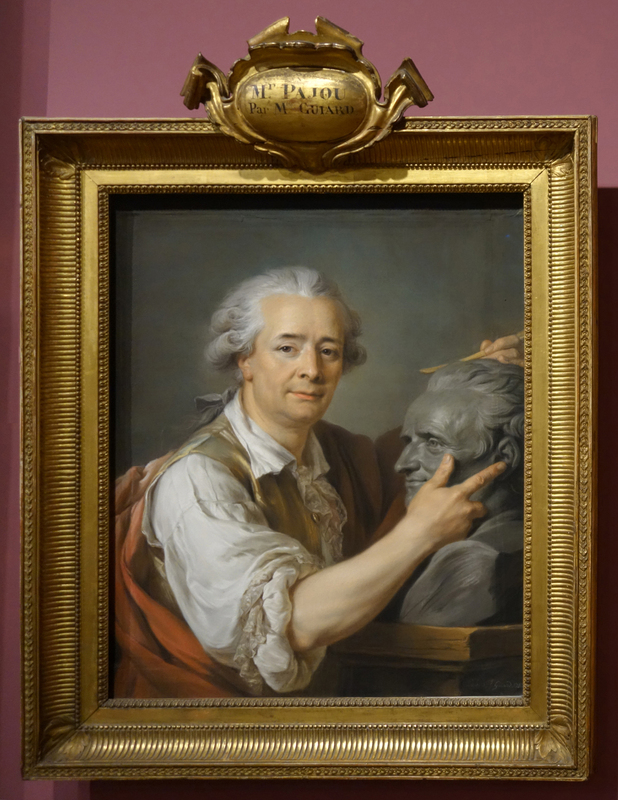 de l’Académie de peinture et de sculpture, exposés au Salon du Louvre en l’année 1753 et sur quelques écrits qui ont rapport à la peinture, à M. le président de B***, s.l., 1753, p. 155f. The passage is discussed in Bruno Pons, ‘Les cadres français du xviiie siècle et leurs ornements’, Revue de l’art, 76, 1987, pp. 41–50, at p. 43 and n.18; also see translation here. 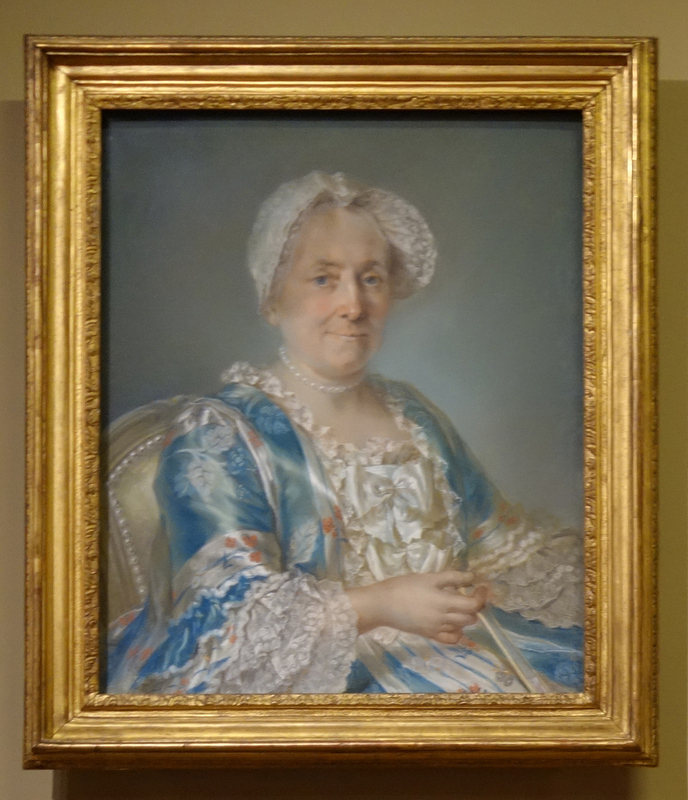 There is perhaps an irony in that the Louvre’s great pastel of Mme de Pompadour is in an architrave frame, while the National Gallery’s oil of her is now in a pastel frame. 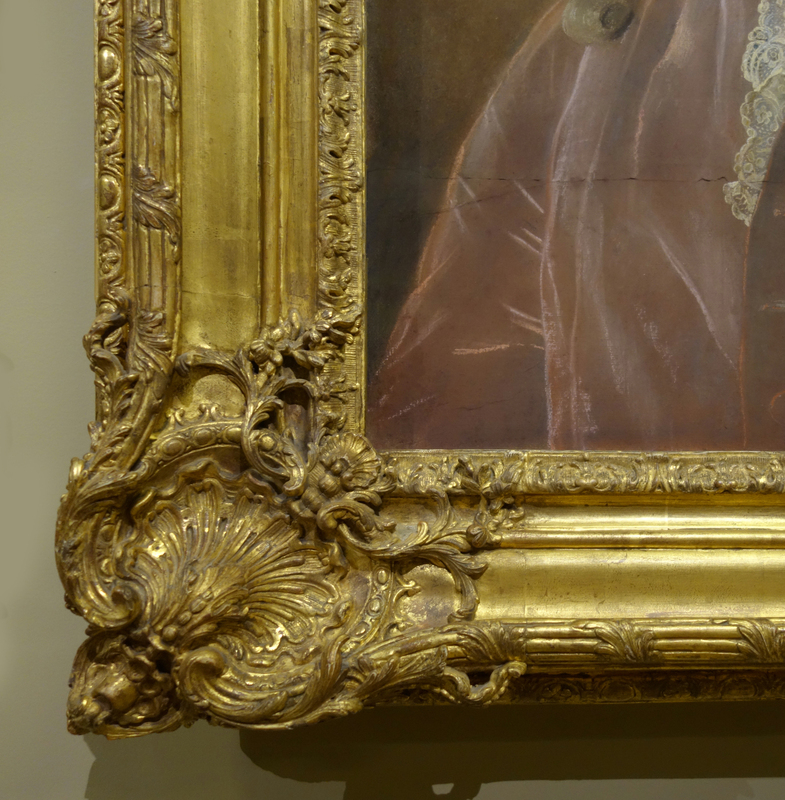 The Drouais came from the Earl of Rosebery in what appears to have been a Maratta-style moulding of far too narrow a section; this was replaced with a NeoClassical fluted frame which was not much better. 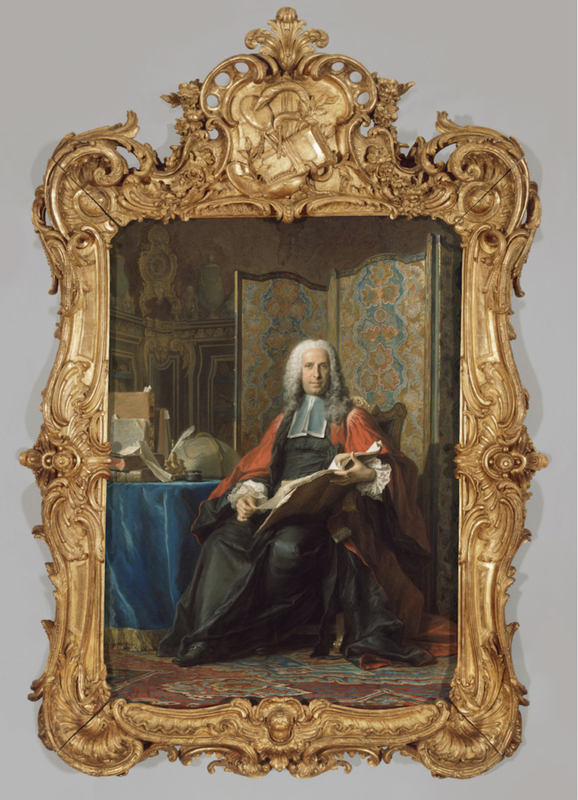 The decision was taken c. 2010 to reframe this magnificent tutorial in Rococo furniture in a ‘pastel frame’ which can never have been intended for a work in the medium: see Peter Schade’s note in The National Gallery Review of the Year 2009–2010, pp. 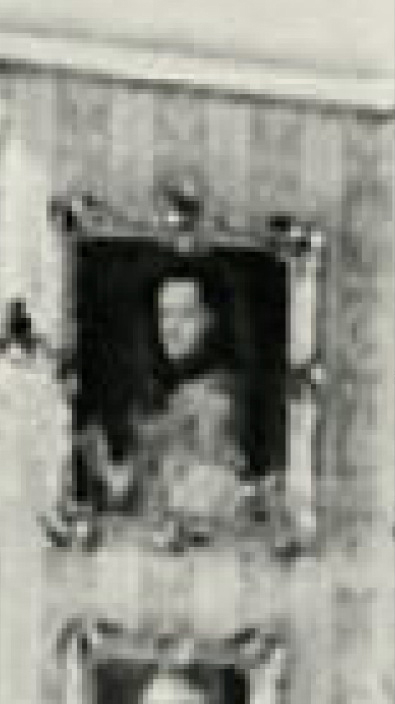 23ff, which reproduces the immediately previous frame but does not however mention the Mentmore Towers frame in which the painting arrived in 1977. 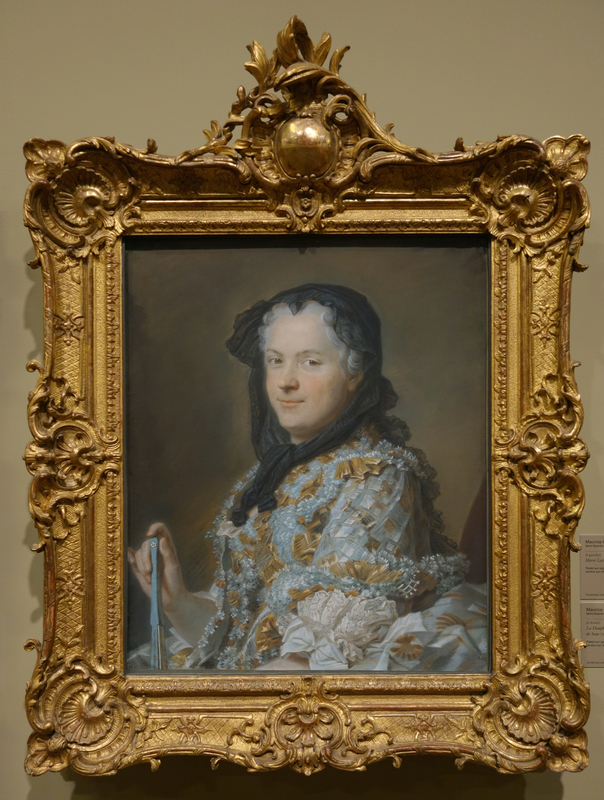 Curiously when the National Gallery embarked on its ‘Grand Tour’ – exhibiting replicas of some 30 of its paintings in unexpected places in London – Mme de Pompadour was again fitted into a fairly similar reproduction frame. 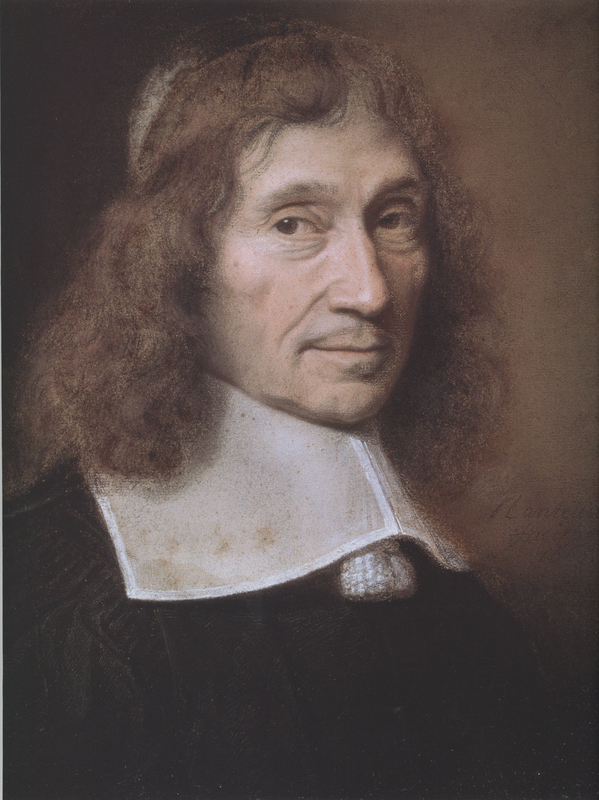 Examples in Perronneau’s œuvre include original frames on two Bordeaux pastels, Gorsse (J.582.1364) and Mme Molles (J.582.1626), both extremely simple baguettes. 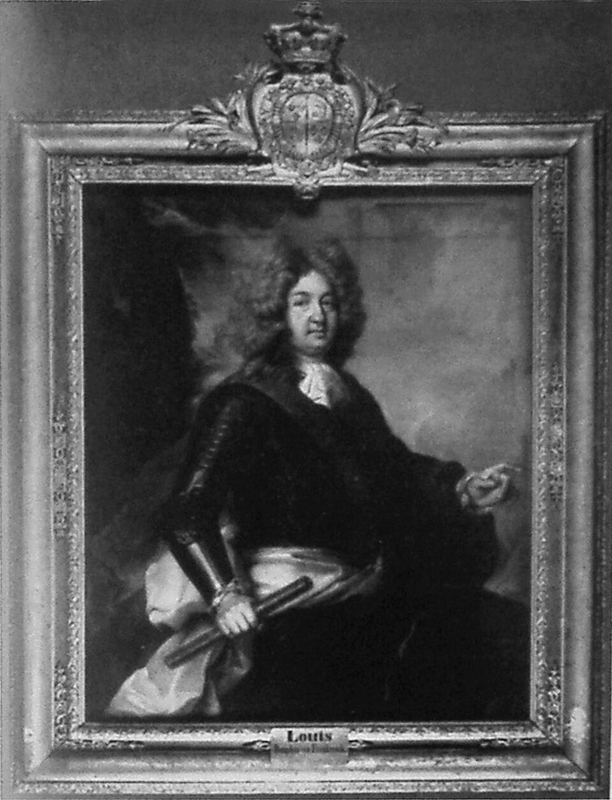 The original frame on the much earlier J.582.1041 (1746) is visible in the background of the photograph of Marius Paulme in his sale catalogue. A magnificent Louis XIV example, perhaps for Mme de Verrue who certainly owned the Louvre picture. 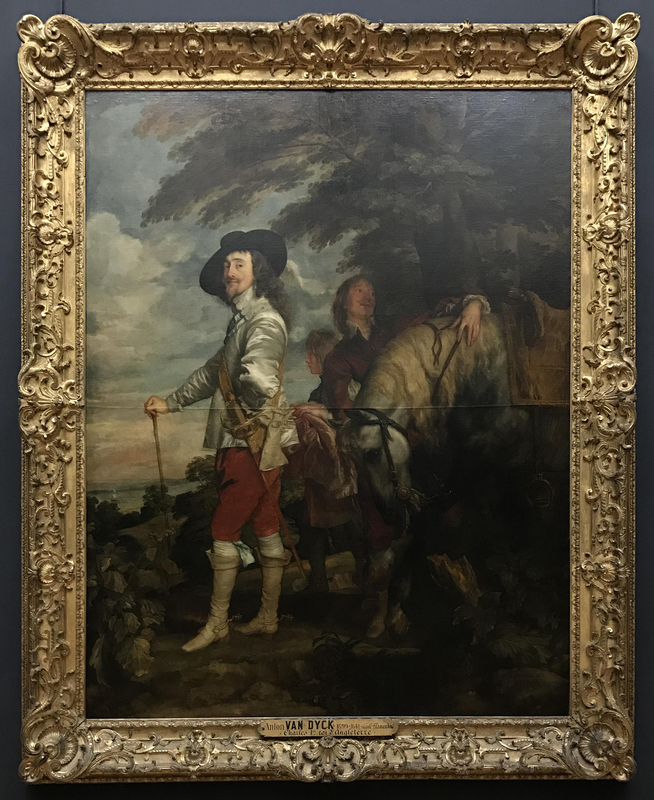 The earlier provenance is uncertain: instead of it coming from Charles I’s collection, as assumed in the exhibition, I think it possible that Van Dyck may have sold it to his great patron Alessandro Scaglia. 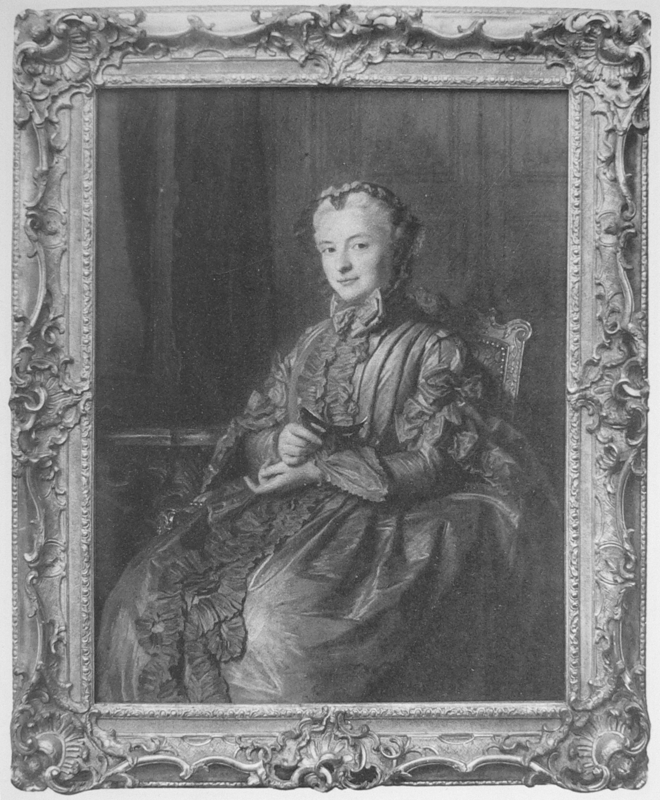 Mme de Verrue was married to Scaglia’s great-great-nephew. 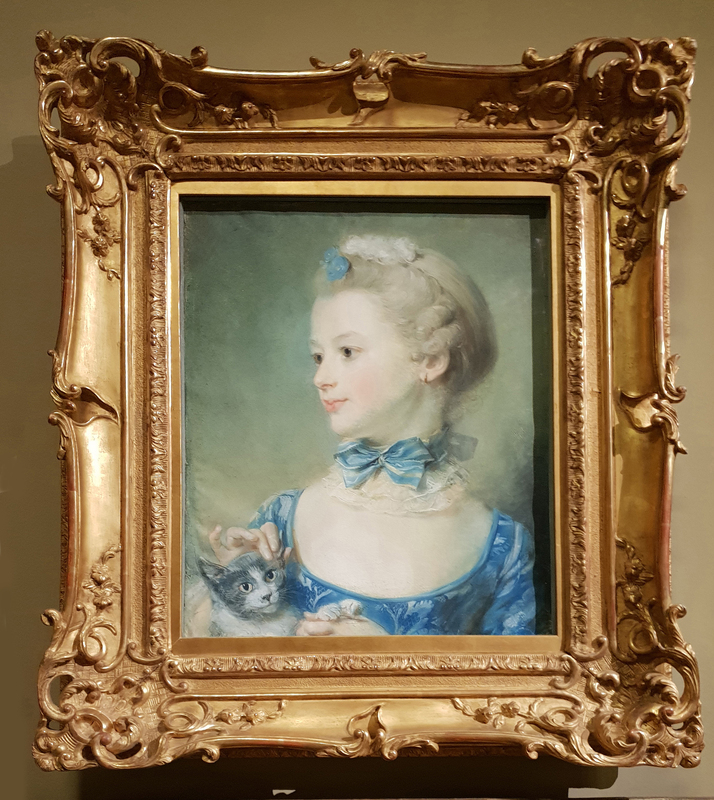 She was also the half-sister of the prince de Grimberghen responsible for acquiring much French art, including pictures and frames, for Max Emanuel (see cat. no. 19 below and my article in The Court Historian in 2012; there’s an expanded online version). Arsène Alexandre, ‘Pour que le Louvre soit parfait’, La Renaissance de l’art français…, .i.1919, p. 239. ‘Lettre d’un amateur de Province sur le secret de fixer le pastel’, Journal œconomique, .ii.1758, pp. 63–65, in Treatises. On the effects of this, see my essay. Published by Elizabeth Champney in 1891. AN O1 1922A, cited Pons, ibid., p. 48. Twitter, 1 September 2018; it is not reported in XS. For Antoine Levert, see my recent post. New York, Sotheby’s, 25 January 2007, Lot 90, with bibliography. The date on the fronton which now appears as 1767 was formerly 1784; the full name of the framer was given in the catalogue Exposition rétrospective des colonies françaises de l’Amérique du Nord, Paris, 1929, cat. no. 30.